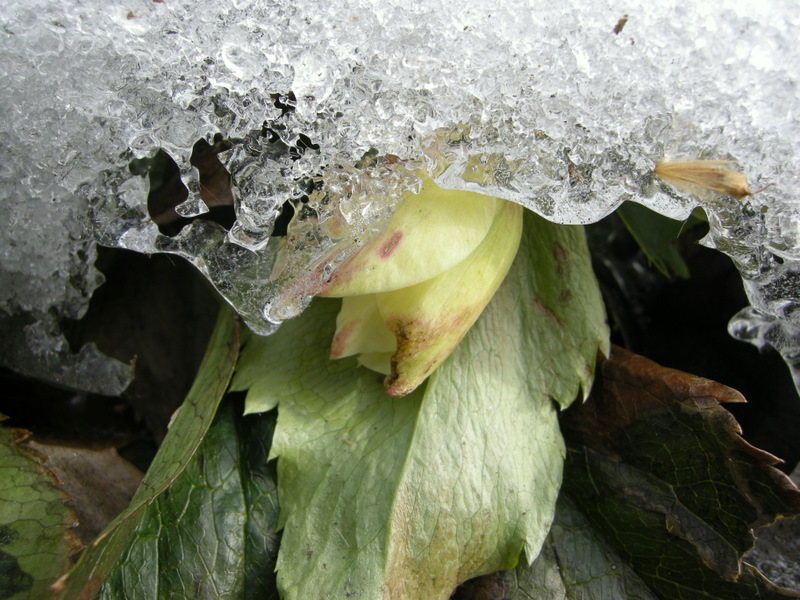 The first of my hybrid hellebores is just about to bloom: Helleborus x ‘Snow White’ (aka ‘Snow Bunting’). I am two days late for the official Garden Blogger’s Bloom Day. 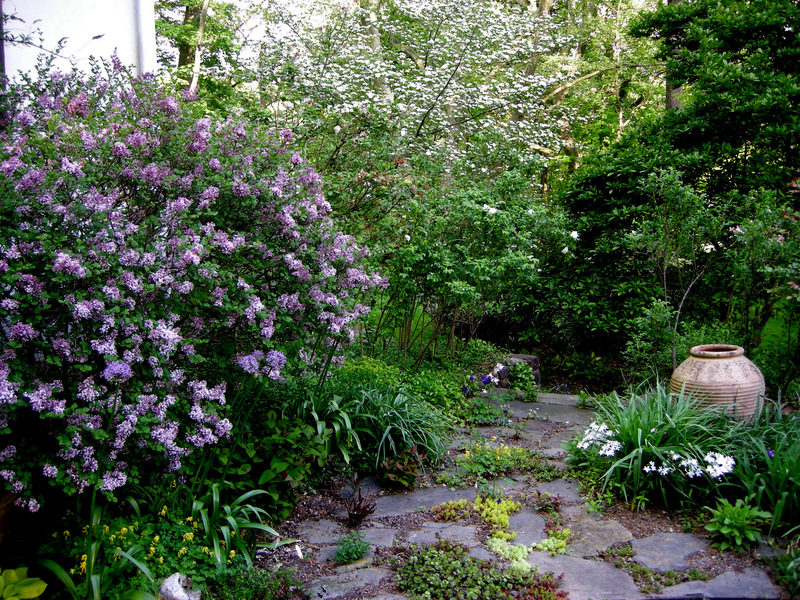 On the fifteenth of each month garden bloggers from all over the world post photos of what’s blooming in their gardens, and their posts are collected by Carol at May Dreams Gardens. 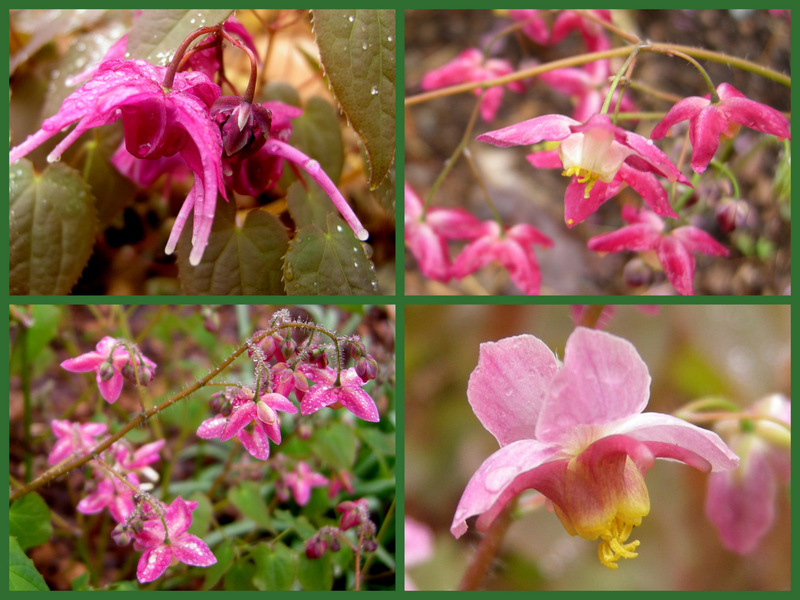 Nevertheless, I thought it would be fun to see which plants are pretty enough to get me outside in December on a somewhat warm but dreary, rainy day. I also wanted to add a new twist by allowing myself only one pass through the garden for photos instead of the numerous trips required by a normal post. Fall-blooming camellia ‘Winter’s Snowman’ has been blooming since October and still has buds waiting to open. My late fall garden has been immensely improved by the addition of fall-blooming hardy camellias. All five of mine are blooming now and have plenty of buds left. 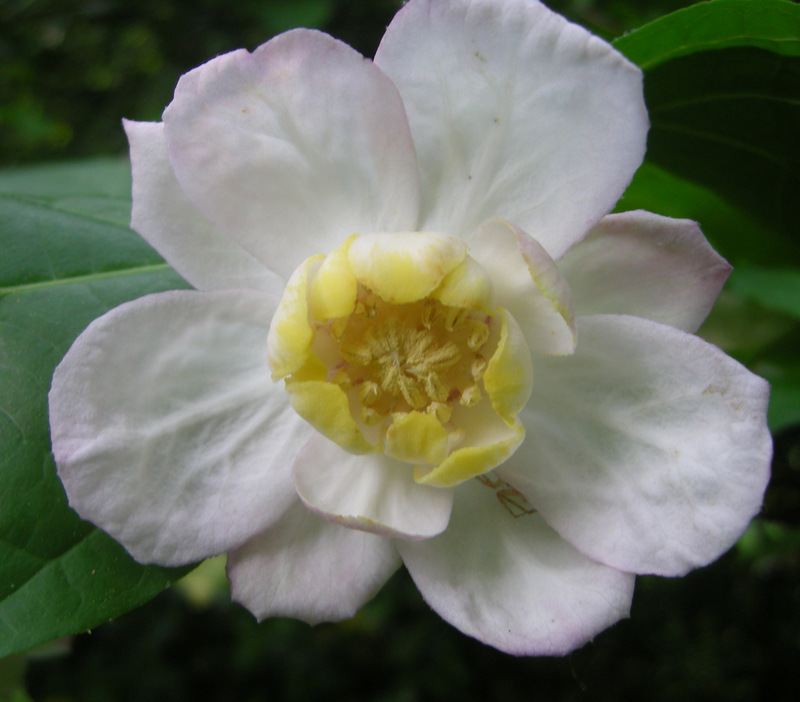 For more information on fall-bloomimg camellias, click here. Another shot of the first flower on ‘Snow White’. 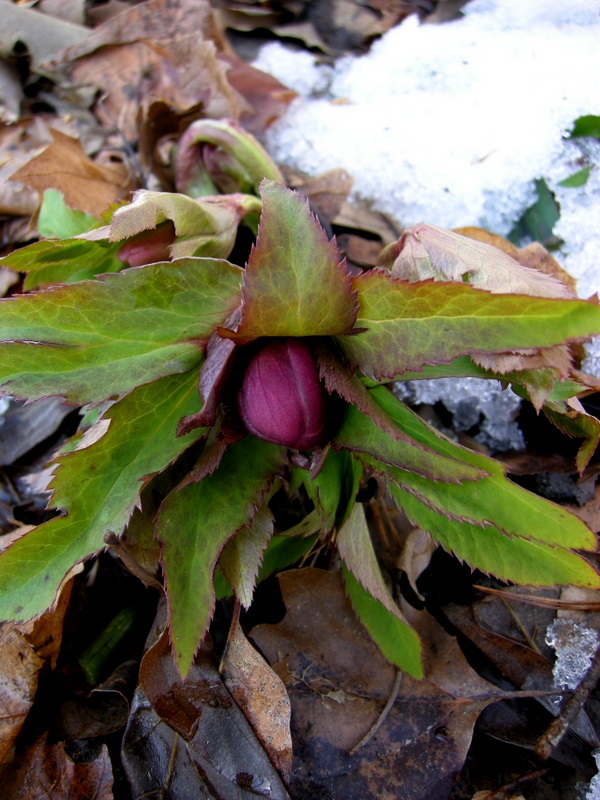 After blooming in October, ‘Josef Lemper’ Christmas rose is at it again and will continue to bloom into spring. ‘Caramel’ heuchera continues to change from one beautiful hue to the next through out the winter. ‘Green Spice’ is new to my garden this year and looks like a winner. ‘Citronelle’ is a customer favorite for brightening dark corners. ‘Potter’s Prelude’, a fall-bloomimg snowdrop cultivar, is getting to the end of its bloom period which began in mid-November. A clump of early blooming giant snowdrops, Galanthus elwesii, hides in the Japanese holly ferns and hellebores. 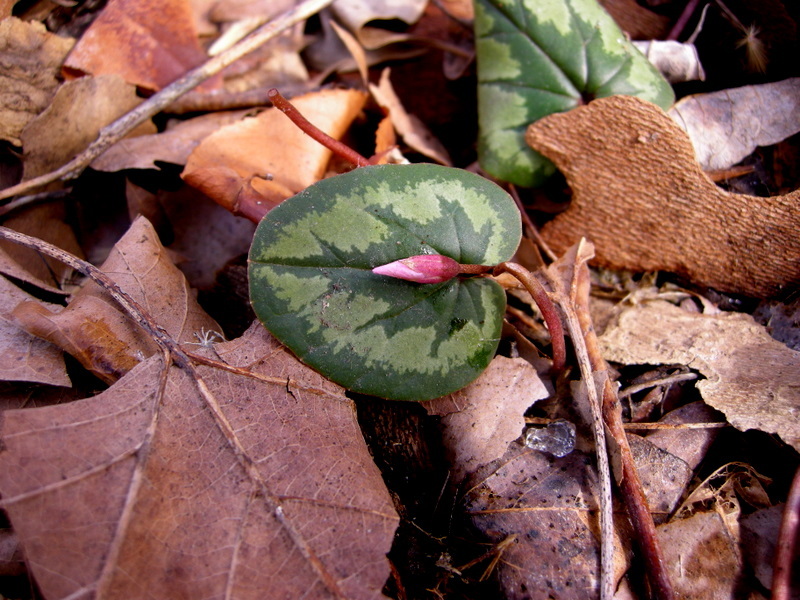 Except during the heart of the summer when they are dormant, hardy cyclamen are stars in my garden. I find their highly variable leaf patterns endlessly fascinating. 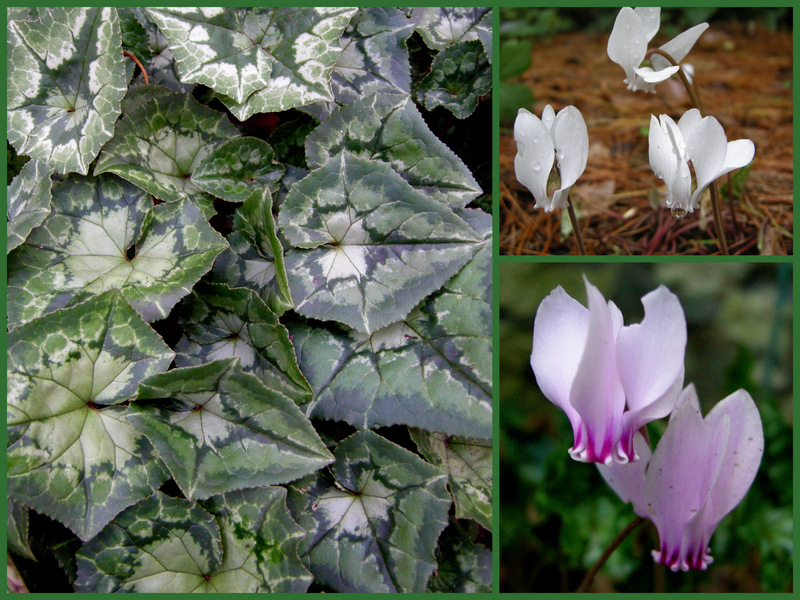 For more information on hardy cyclamen, click here. The last few blooms on fall-blooming hardy cyclamen, C. hederifolium, which began blooming at the end of August. Spring-blooming hardy cyclamen, C. coum, doesn’t need flowers to attract attention. 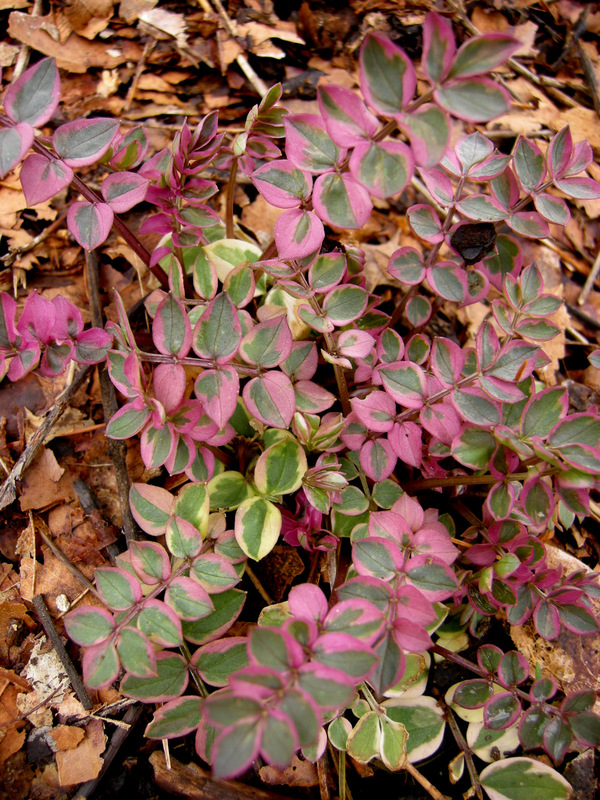 ‘Brigadoon’ St. John’s wort always takes on this lovely peach color for the winter. This new mahonia called ‘Soft Caress’ was given to me by the breeders at the Southern Living Plant Collection to trial in my garden. It is evergreen, blooms now, and is hardy to zone 7. For more information, click here. I have high hopes for it because I have since seen it in two other local gardens. This sedum always turns a lovely burgundy in the fall. Unfortunately, I don’t know its exact name. Bigroot geranium, G. macrorrhizum, takes on red and pink tones for the winter. ‘Black Scallop’ ajuga has quickly become one of my favorite groundcovers because its dark purple leaves remain shiny and beautiful through the winter. You may be wondering why I would limit myself to one trip outside for photos for this post. Every article that you read here takes me at least a full day to compose, including the photography, the research, the writing, and the editing. I wanted to see if I could cut that back to a few hours and still produce a quality product, and I believe I have been largely successful. It would only work for a post like this though where no significant supporting research was required. 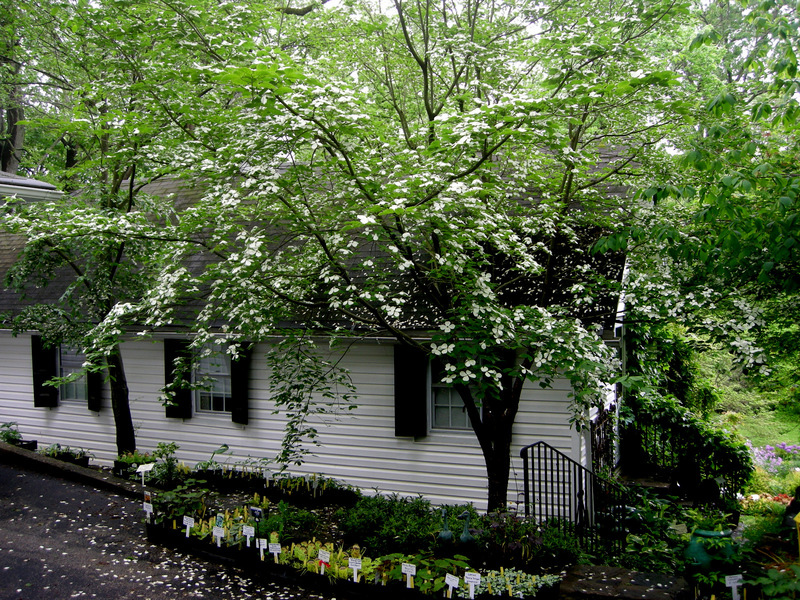 Nursery Happenings: Carolyn’s Shade Gardens is a retail nursery located in Bryn Mawr, PA. 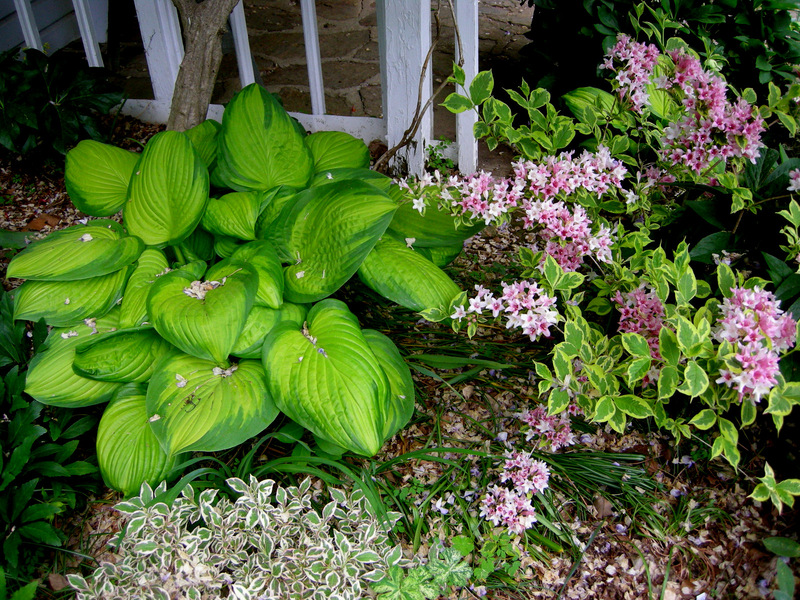 The only plants that we mail order are snowdrops and miniature hostas. The nursery is closed until spring 2013. Thanks for a great year. 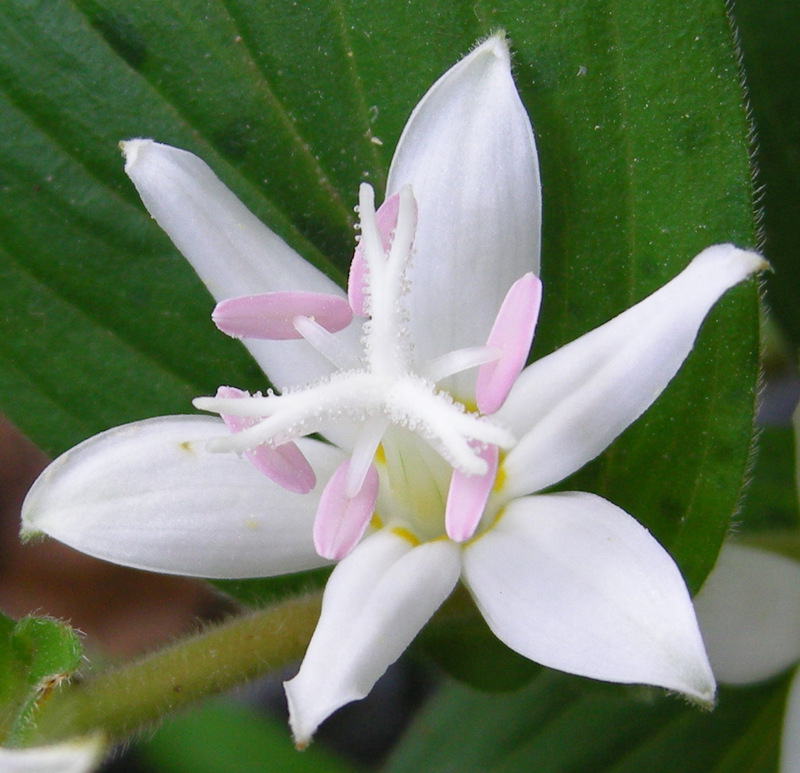 The subtle coloring of ‘White Towers’ toad-lily, Tricyrtis latifolia ‘White Towers’, is magical in the fall. 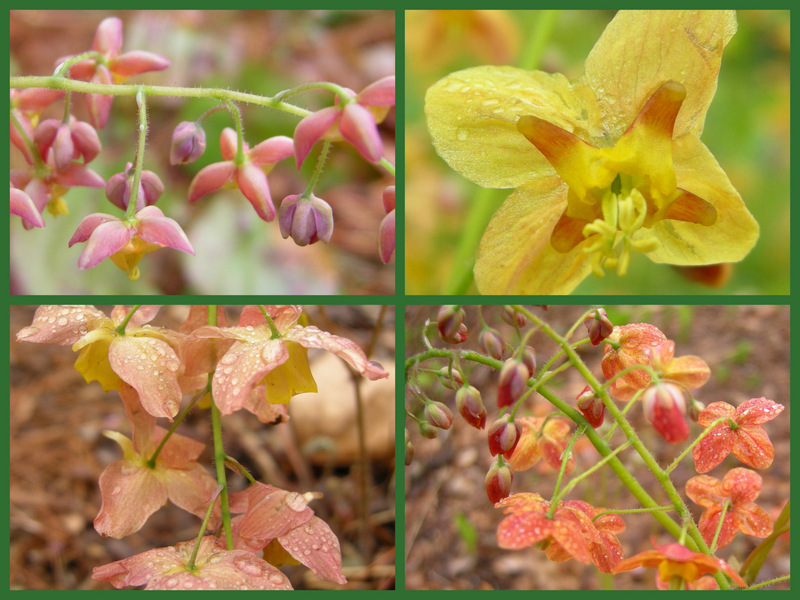 Every photo was taken at Carolyn’s Shade Gardens this fall. 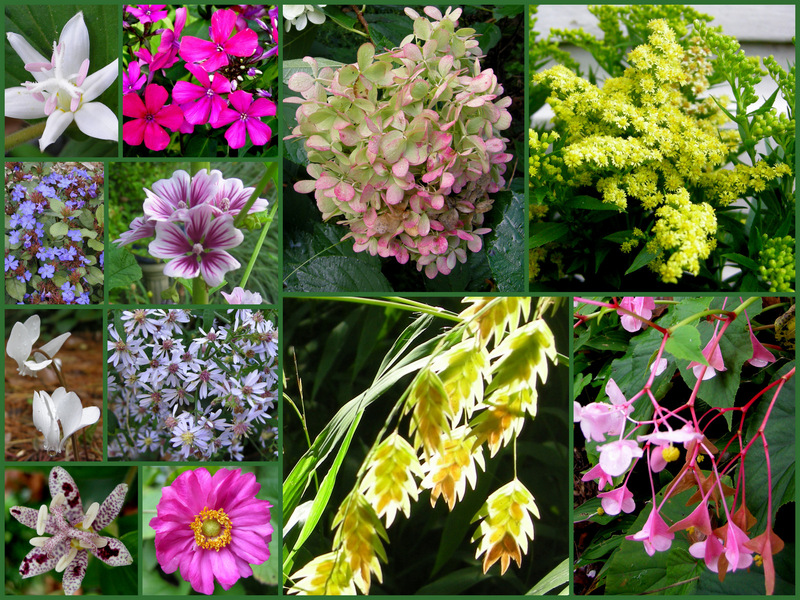 I am linking this post to Garden Blogger’s Bloom Day for October when gardeners around the world show photos of what’s blooming in their gardens (follow the link to see photographs from other garden bloggers assembled by Carol at May Dreams Gardens). 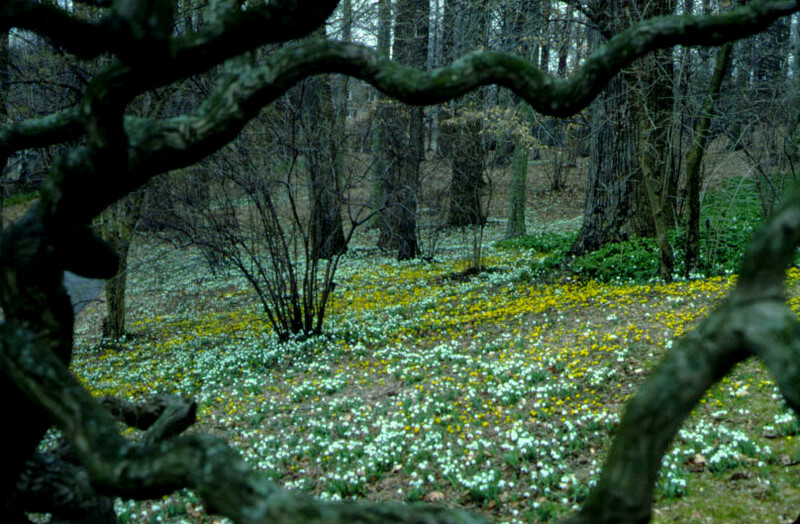 I am also linking to Gesine’s Bloom Day at Seepferds Garten. 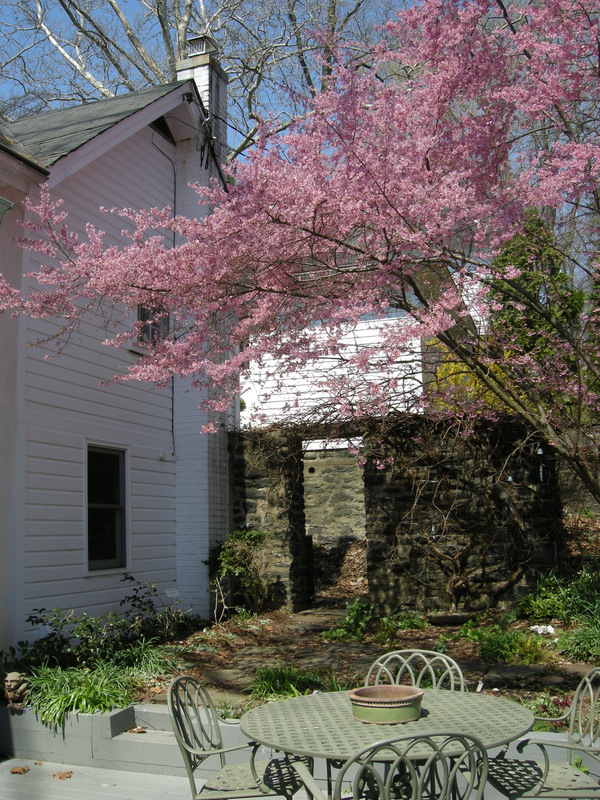 I am located in Bryn Mawr (outside Philadelphia), Pennsylvania, U.S., and zone 6b. 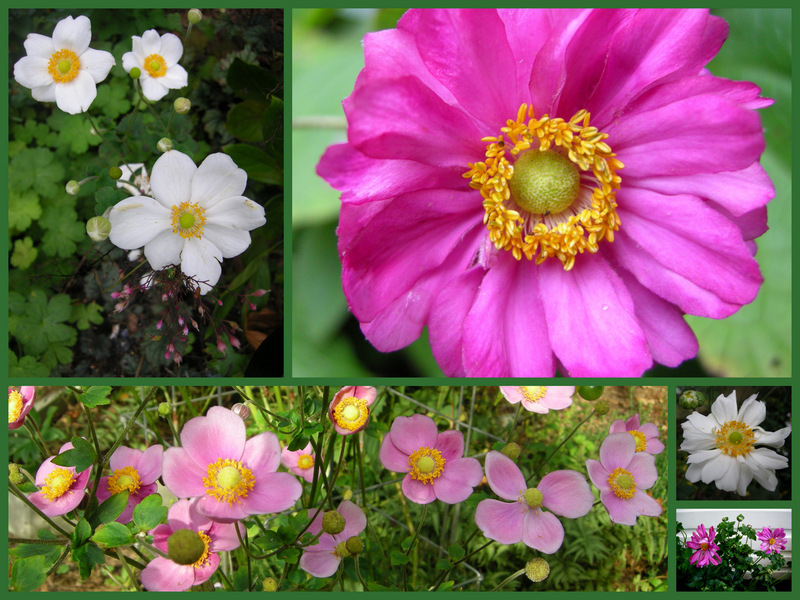 Japanese anemones, Anemone x hybrida, are one of the undisputed stars of my fall garden, growing anywhere from full sun to almost full shade and thriving no matter what the weather. 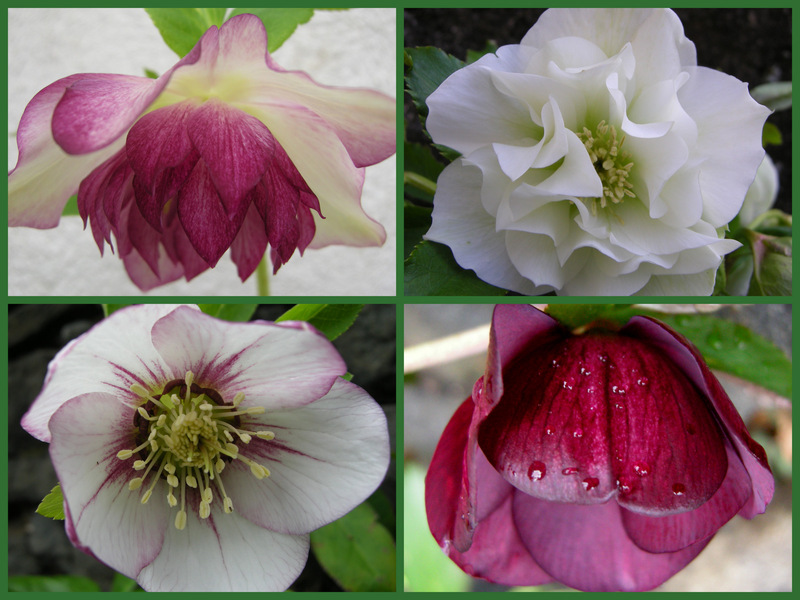 Clockwise from upper left: ‘Honorine Joubert’, ‘Margarete’, ‘Whirlwind’, ‘Bodnant Burgundy’, ‘September Charm’. 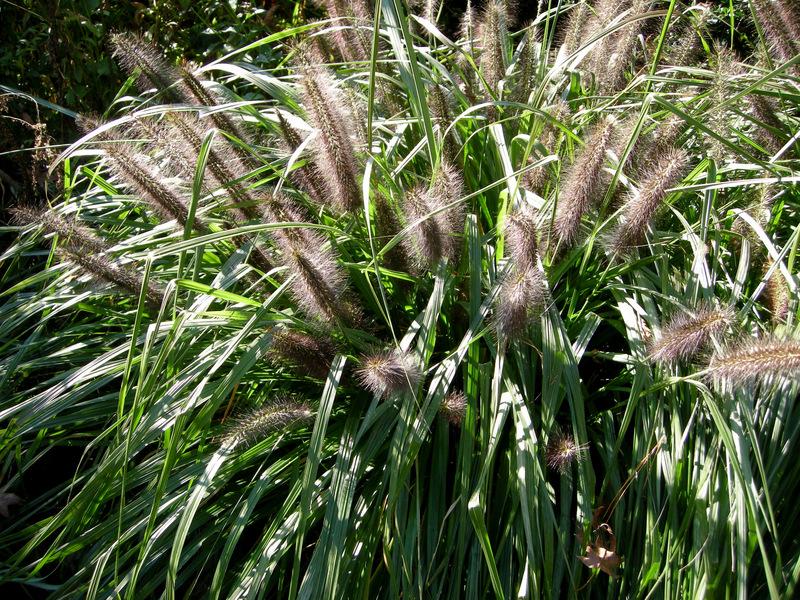 The black plumes of ‘Moudry’ fountain grass, Pennisetum alopecuroides ‘Moudry’, glow in the low-angled fall light. 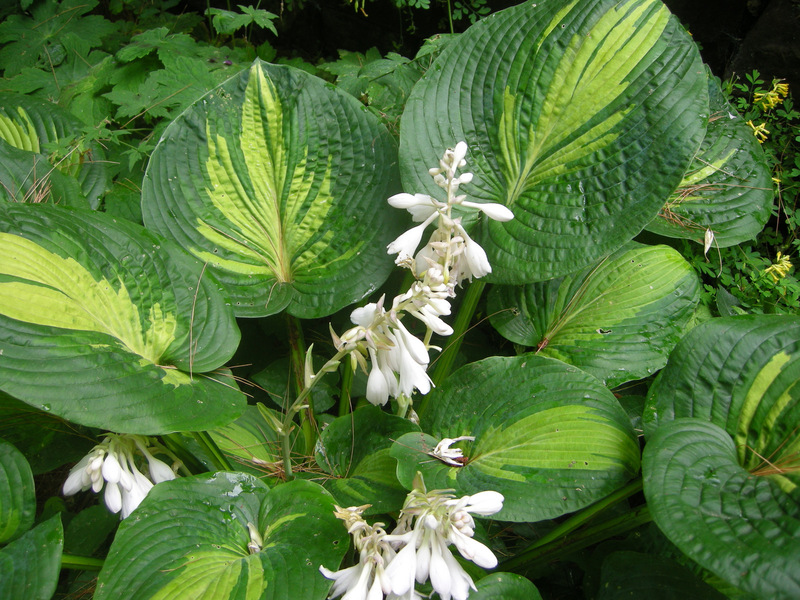 ‘Moudry’ does well in the shade, flowering later and remaining more compact. I grow about five different varieties of native golden rod, Solidago, with my current favorite ‘Little Lemon’, growing only 12 to 18″ high. 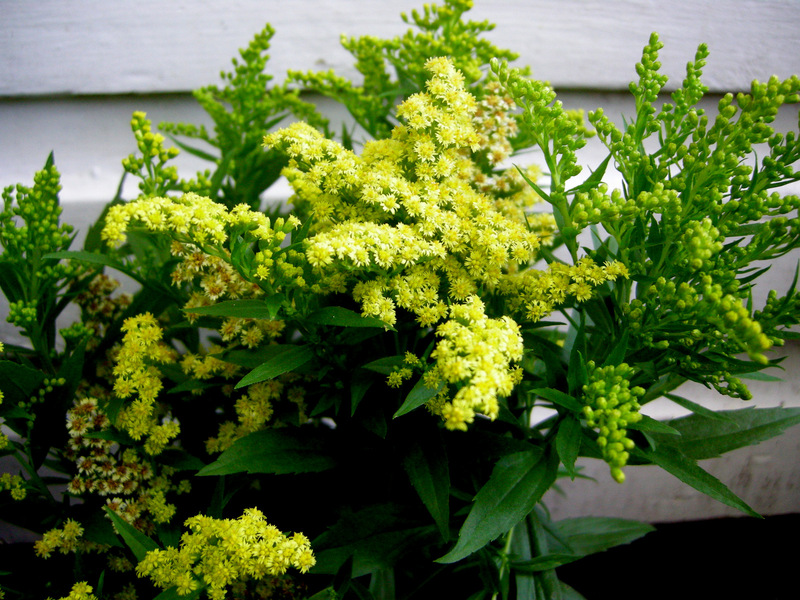 Contrary to popular belief, goldenrod does not cause allergies as it is pollinated by insects. 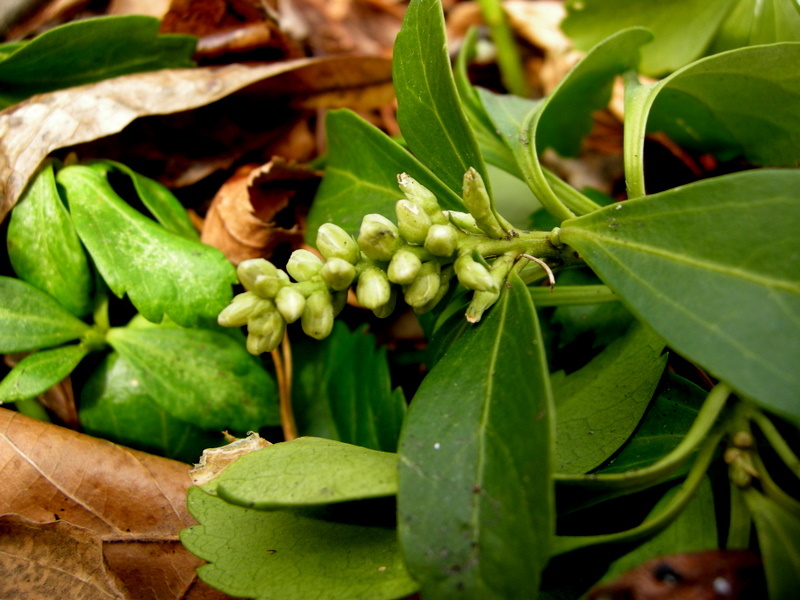 Wind pollinated ragweed, which blooms at the same time, is the culprit. 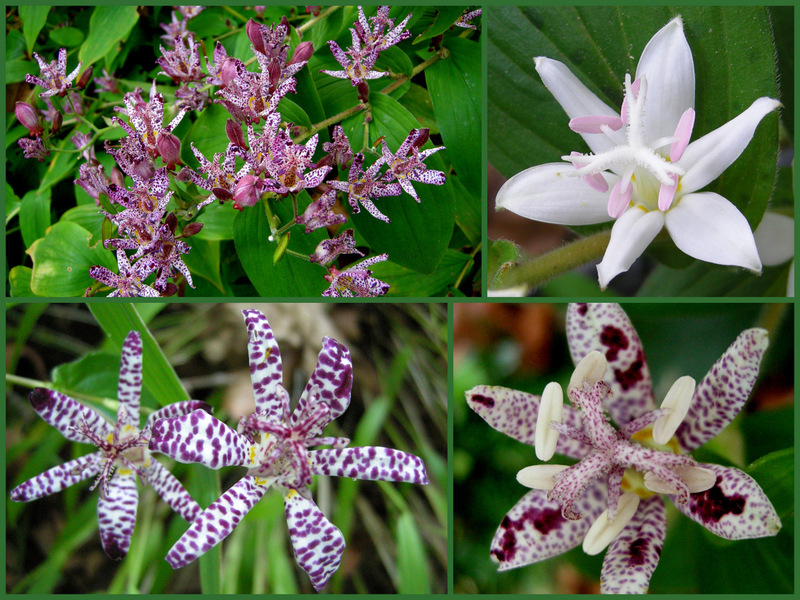 Toad-lilies, Tricyrtis, bloom throughout the fall in full shade with ‘Sinonome’ just getting started now and continuing into November. Clockwise from upper left: ‘Sinonome’, ‘White Towers’, ‘Miyazaki’, ‘Empress’. 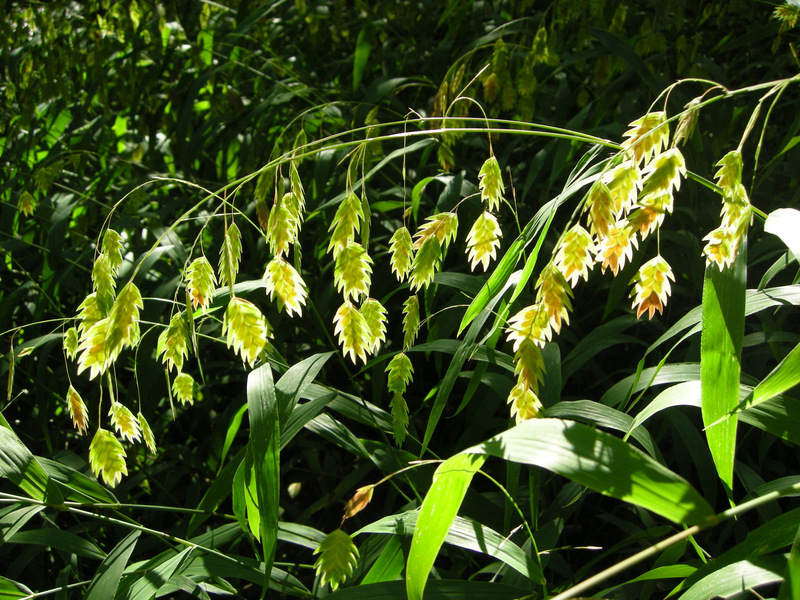 Another plant that is just warming up is Pennsylvania native northern sea oats, Chasmanthium latifolium. 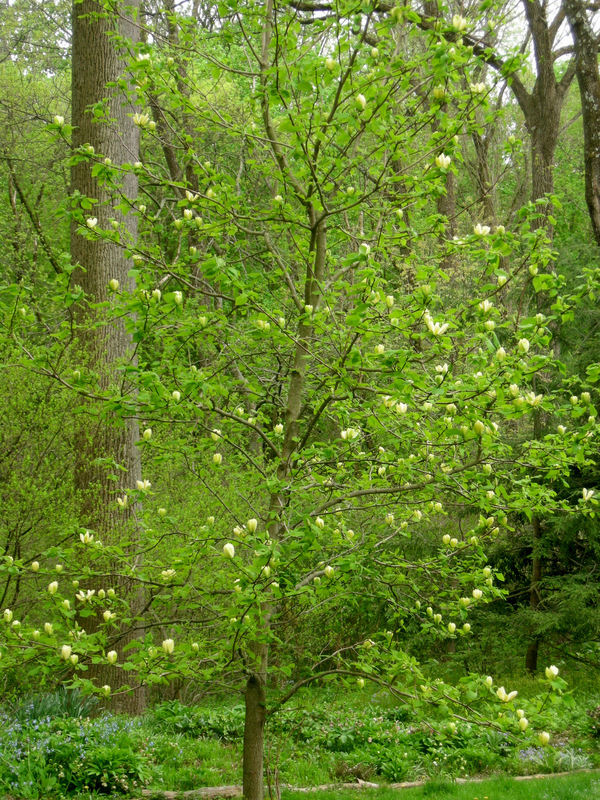 Its foliage will turn orange later in the fall and then dry to a beautiful khaki for the winter. Be forewarned, however, when this plant reaches critical mass, it starts spreading, and its wiry roots are very difficult to remove. Give it room and then triple the space you think you need. 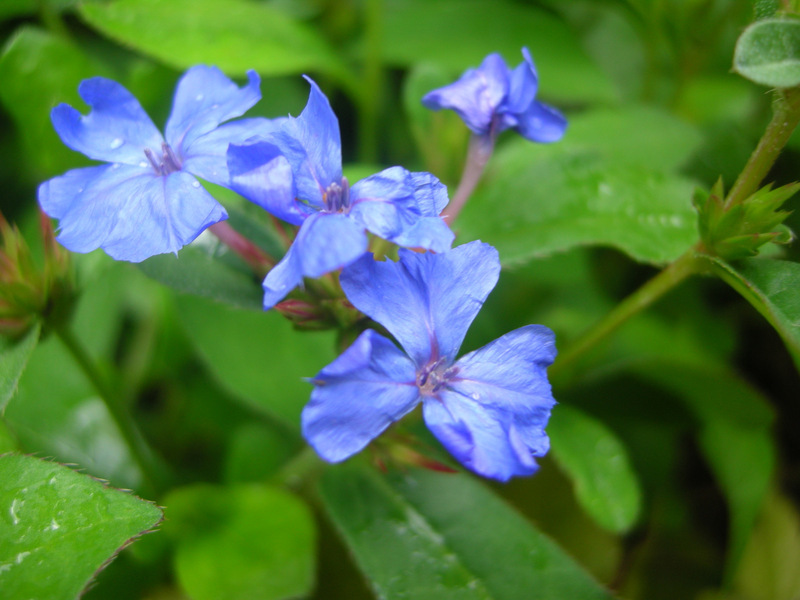 Autumn leadwort, Ceratostigma plumbaginoides, is one of my favorite groundcovers. 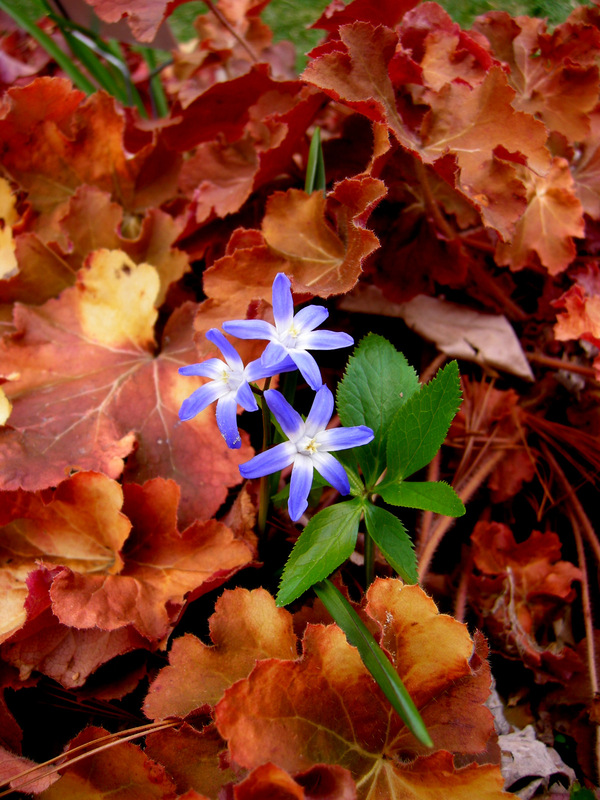 Its true blue flowers start blooming in June and continue through October when its leaves turn bright red. 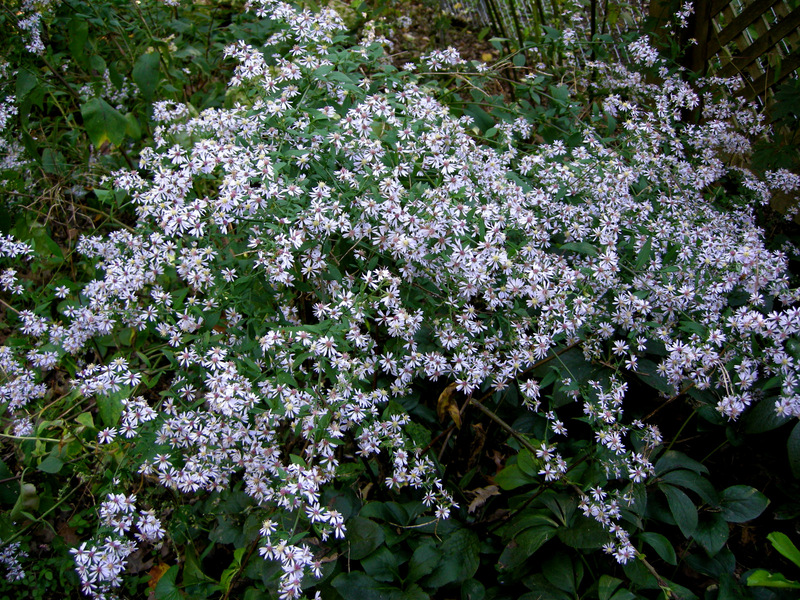 Pennsylvania native ‘Bluebird’ smooth aster, A. laevis ‘Bluebird’, seeds all around my garden in full sun to part shade. Butterflies and bees love it. 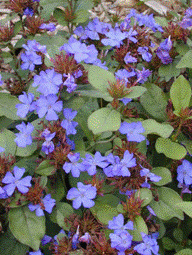 Please click here to find out why most native cultivars are just as friendly to native fauna as the species. 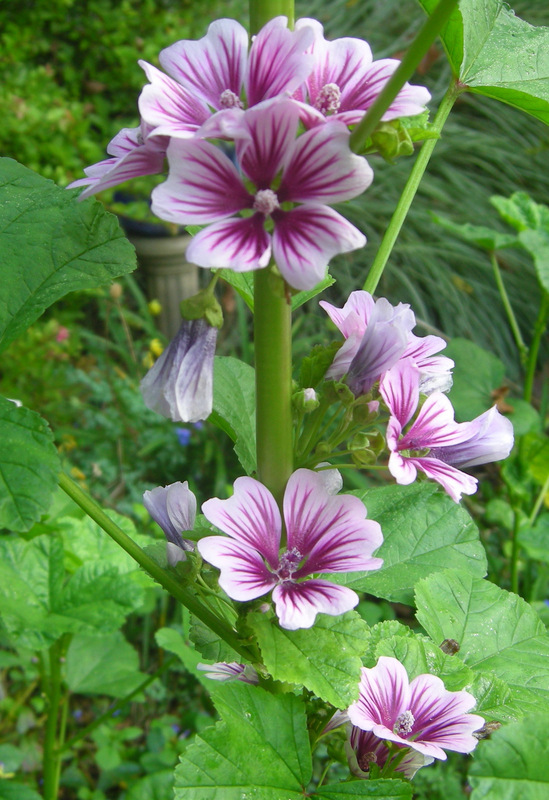 ‘Zebrina’ hollyhock mallow, Malva sylvestris ‘Zebrina’, seems to move around my garden at will, but it never fails to steal the show with its 3 to 4′ stalks loaded with showy flowers. It grows best in full to part sun. Fall-blooming hardy cyclamen, Cyclamen hederifolium, is one of the plants I would take to my shady “desert island”. 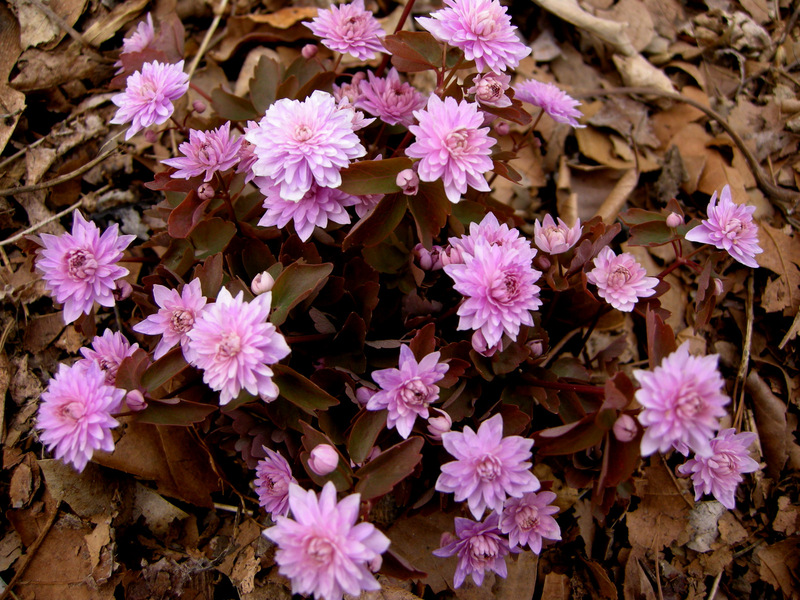 Right now its pink or white flowers are floating all around my shady gardens. 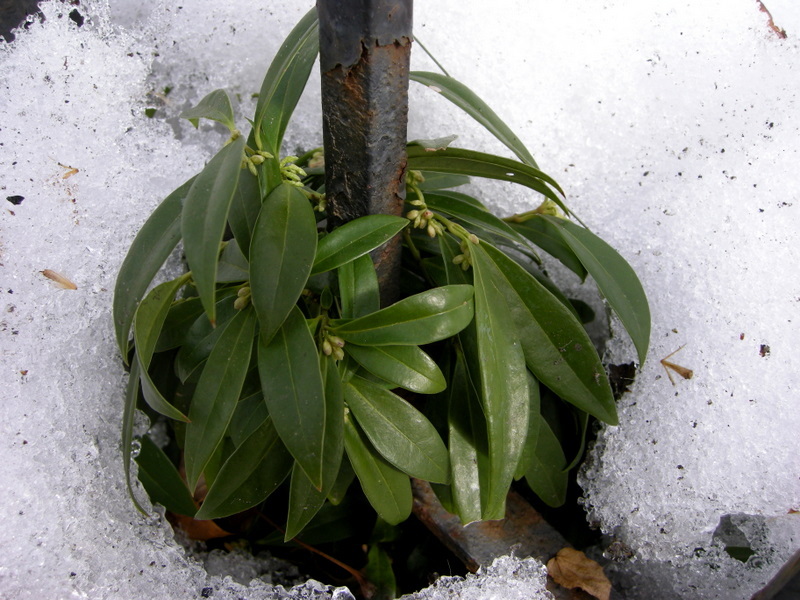 Later its evergreen leaves will emerge from summer dormancy and look like the photo on the left all winter long. 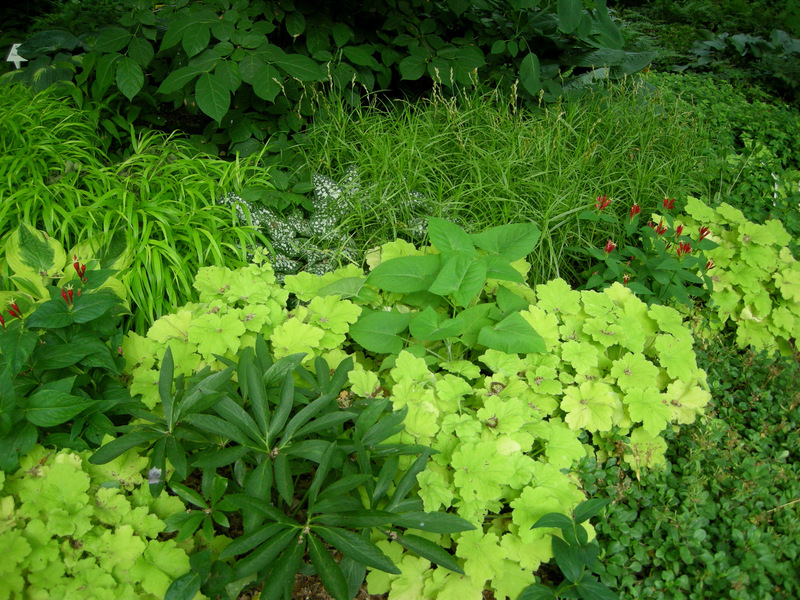 I am always raving about the foliage of the coral bell cultivars derived from our Pennsylvania native Heuchera villosa. Well this is the plant that started it all, Heuchera villosa ‘Autumn Bride’. 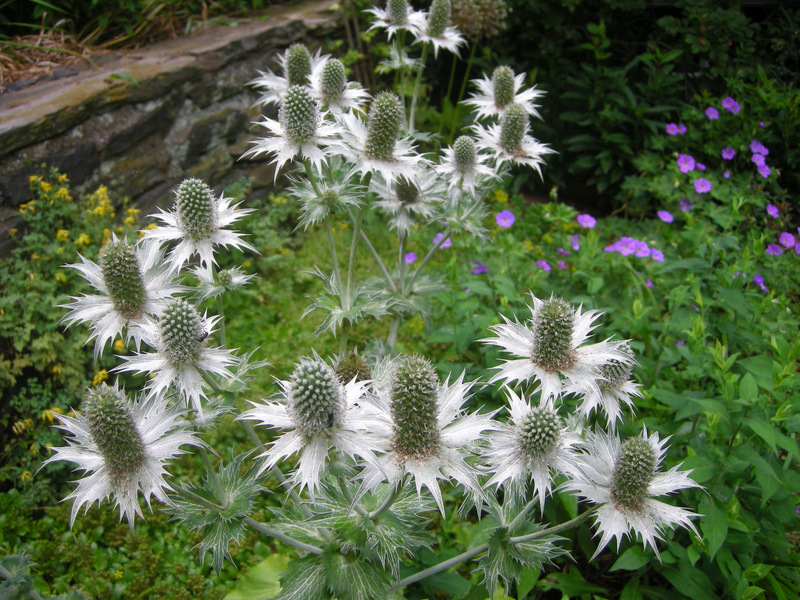 It has very large and attractive fuzzy green leaves and beautiful flowers that bloom right now–this is the only cultivar I would grow for its flowers (the rest I grow for the leaves). 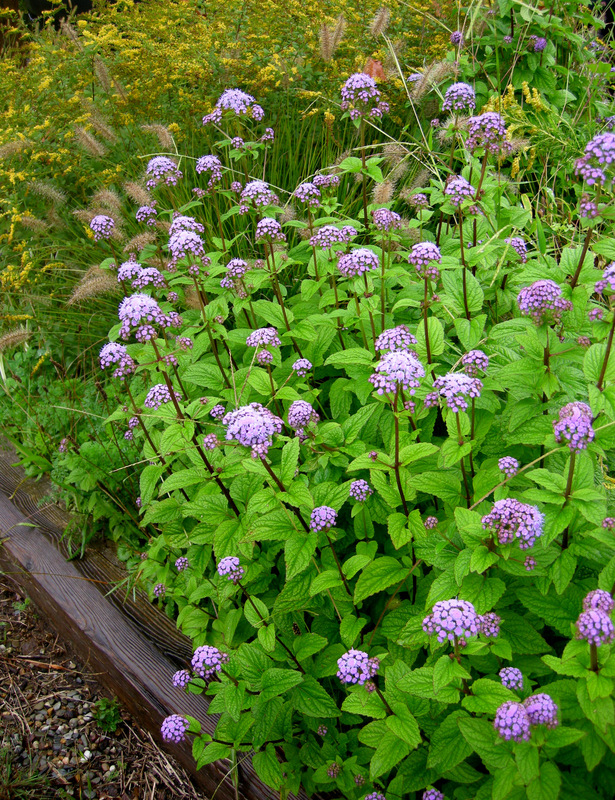 The cultivar ‘Cory’ of Pennsylvania native hardy ageratum, Eupatorium coelestinum, is far superior to the straight species. 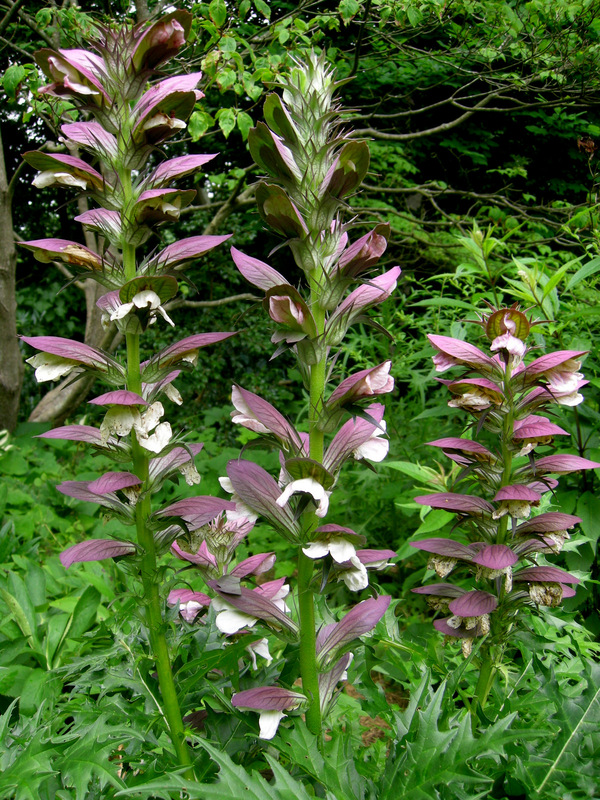 It has more abundant and showier flowers, ornamental purple stems, interesting crinkled leaves, and a much better upright habit. ‘Cory’ is also a good spreader in sun to part shade so give it room. Pictured above with another of my favorite Pennsylvania natives, wrinkleleaf goldenrod, Solidago rugosa ‘Fireworks’. Hardy begonias, Begonia grandis, have spread all over my garden in full shade, and I have yet to find a place that I don’t want them. Because they come up very late in May and really just get going in the fall, I use them to fill in between my hostas on my back hill. 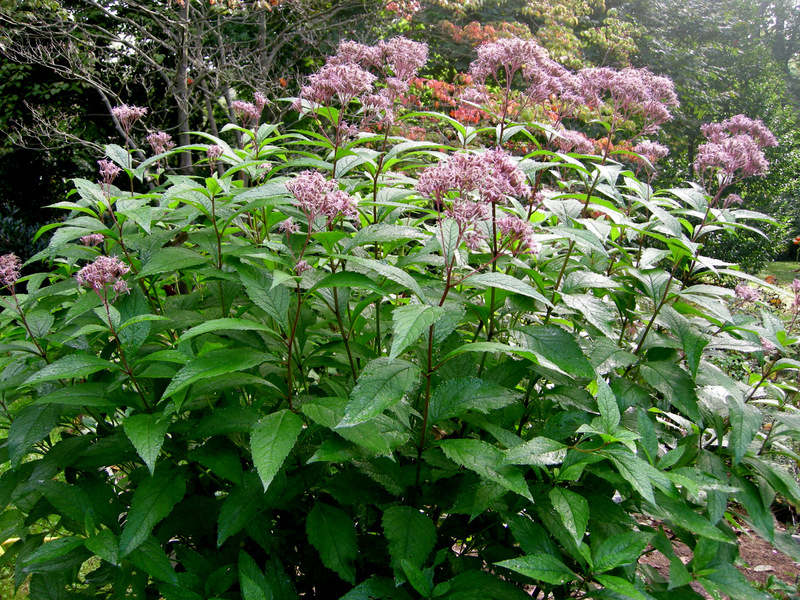 Pennsylvania native Joe Pye weed, Eupatorium dubium, reaches 10′ tall in my garden and flops over in our torrential rains. The “dwarf” version called ‘Little Joe’ grows to a diminutive 5′ tall and has remained erect through the 30″ of rain we had in August and September to bloom now with its large purple flowers–a magnet for butterflies and bees. 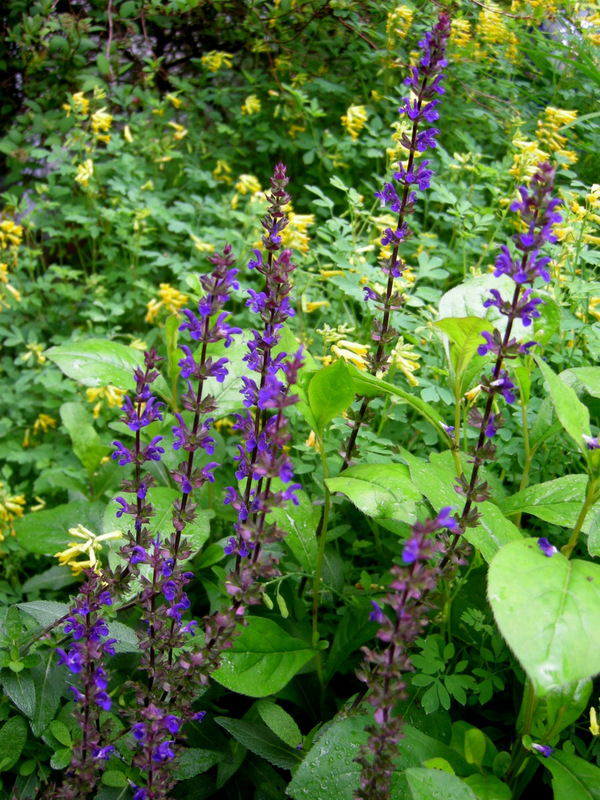 In the spring, a gardener I very much admire brought over this plant, telling me it was a salvia with yellow flowers that grows in full shade and blooms in the fall. 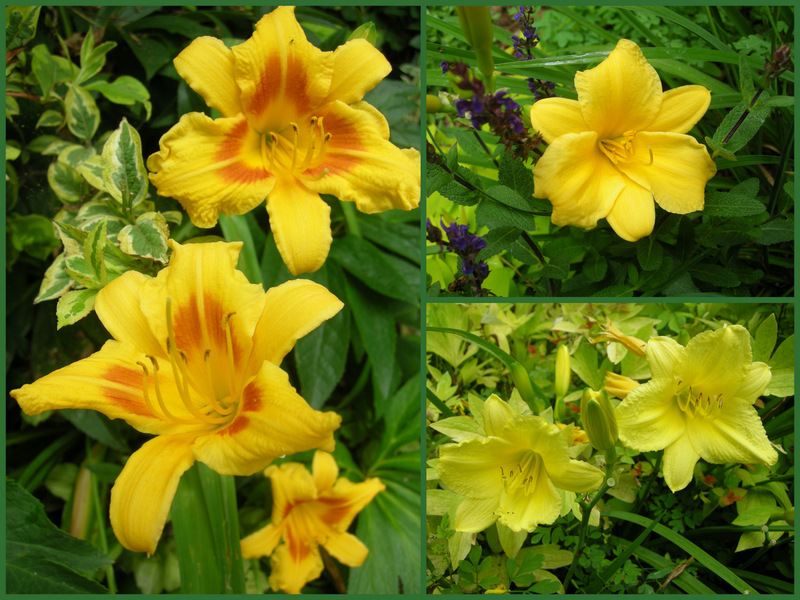 I duly planted it in my shady “yellow garden” and it thrived through heat, drought, and rain with no attention. 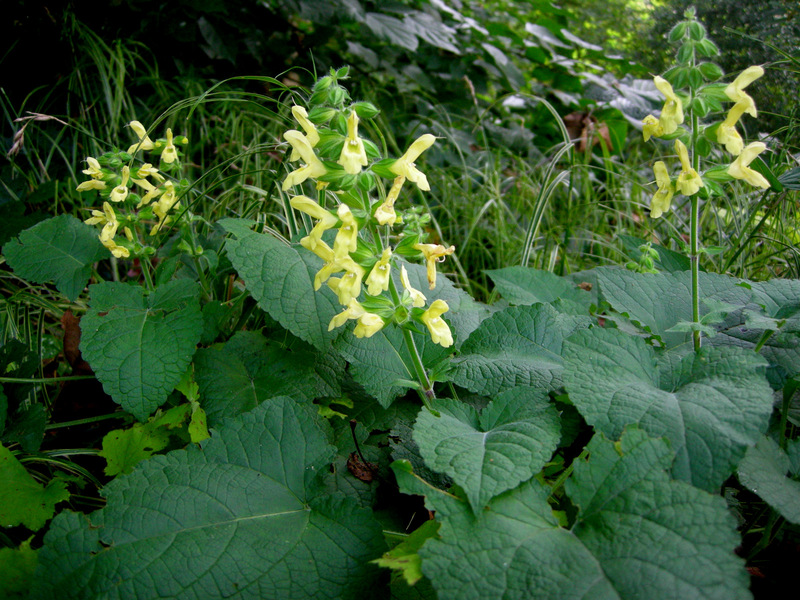 It is called woodland sage, Salvia koyamae. 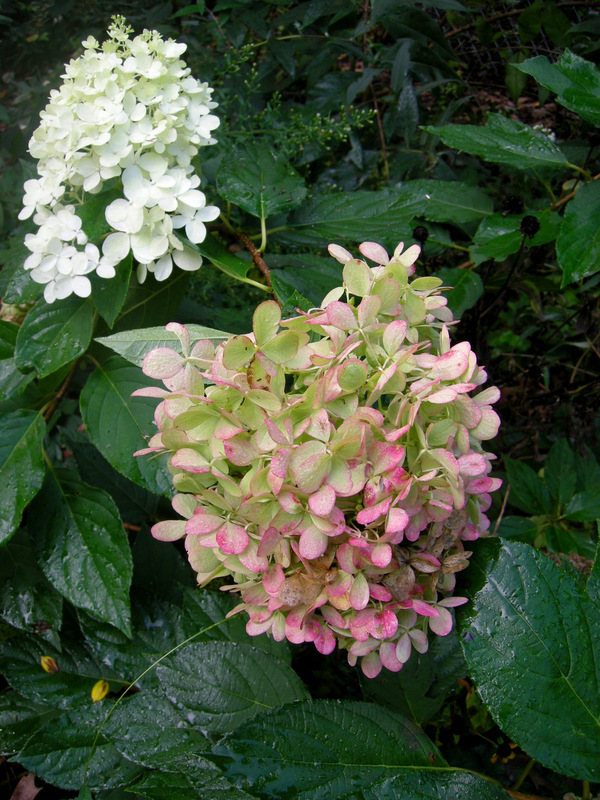 I am just beginning to learn about hydrangeas because until last year there was no point in planting them because of the deer. One of my first acquisitions after the netting went up was ‘Limelight’, Hydrangea paniculata ‘Limelight’. The large white flowers aging to pink have been blooming all summer in part shade, and there are still buds coming—very impressive. 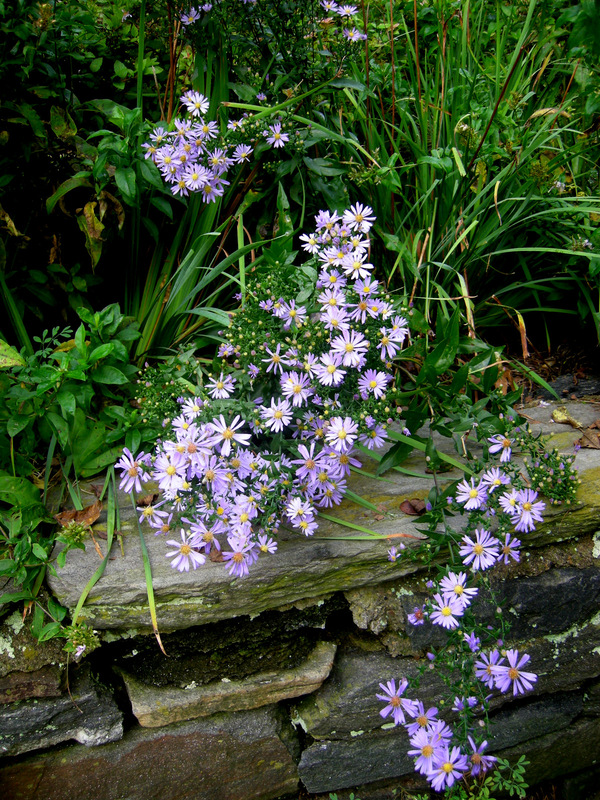 If you want a multitude of fall flowers in dry, full shade, you can’t find a better plant than Pennsylvania native blue wood aster, Aster cordifolius. It fills in all the difficult sites in my woodland and produces a glorious blue haze in the fall. 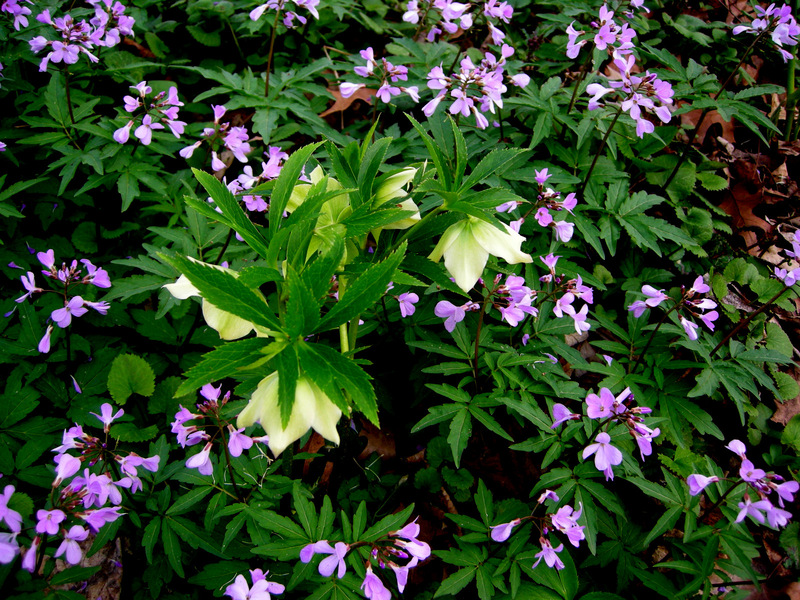 It is fitting that I should end with my favorite Pennsylvania native perennial for fall, garden phlox, Phlox paniculata. 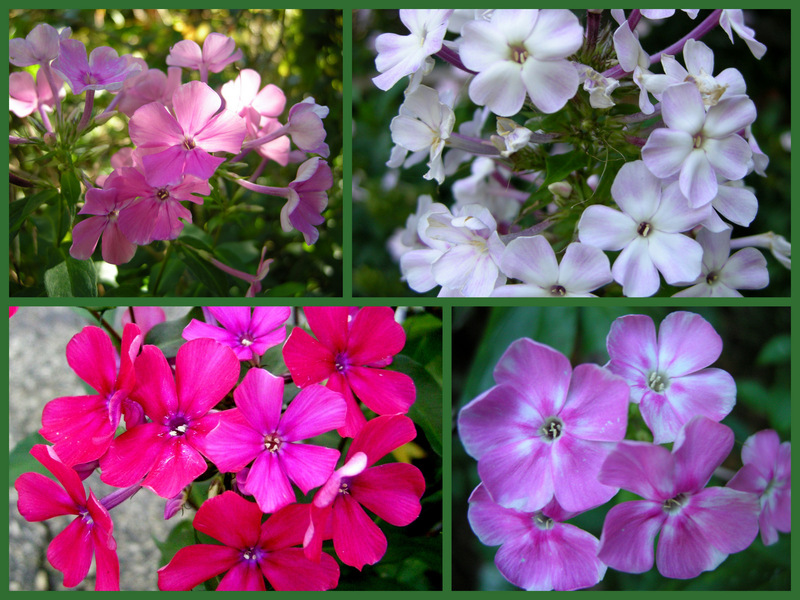 I love everything about garden phlox: its heavenly fragrance, its long bloom time from early summer through fall, the wealth of colors available, its polite self-sowing, and its attraction to butterflies. I dream of installing a meadow area and collecting dozens of plants of every phlox cultivar out there! 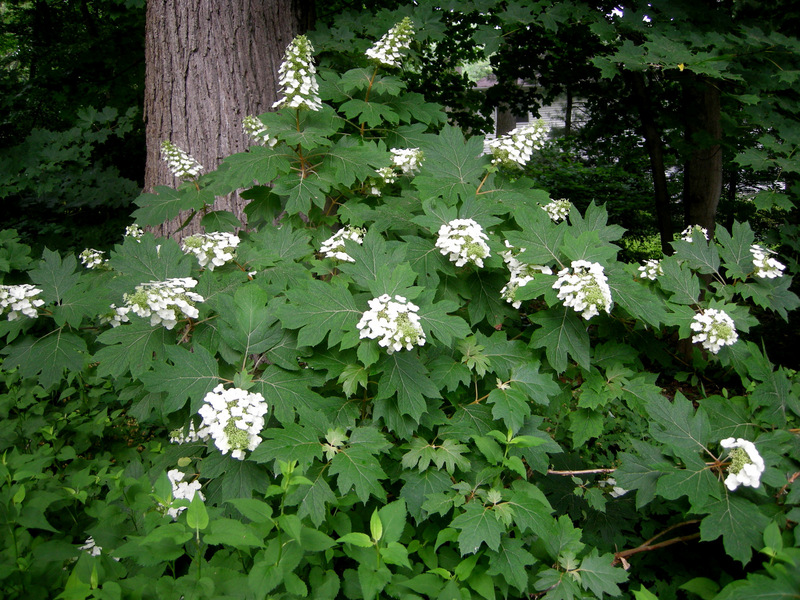 Of the 17 photos above, 8 picture plants that are native to Pennsylvania and eastern North America. 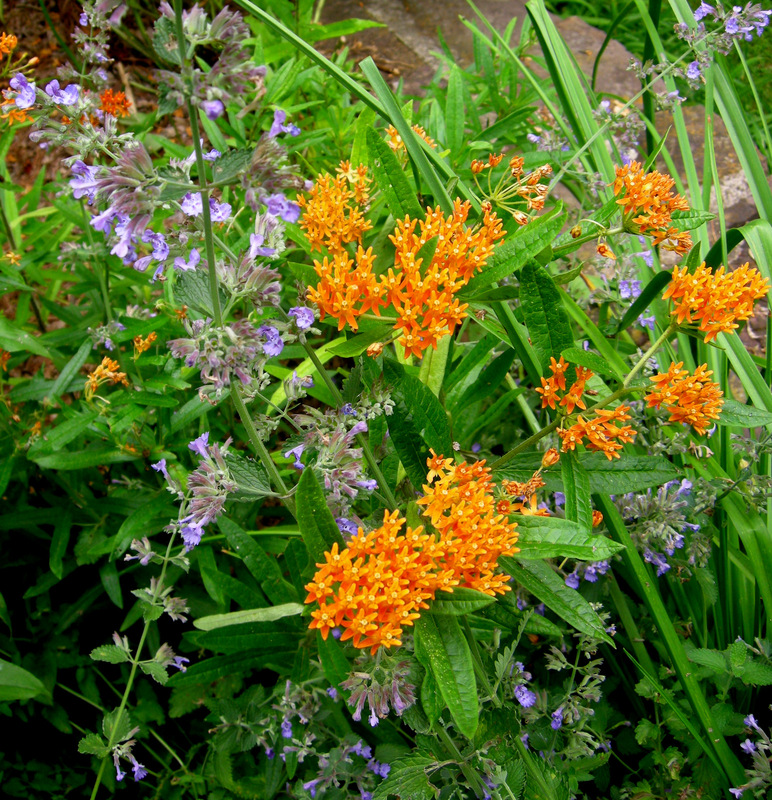 I believe that planting native plants is crucial to our survival. Please take the time to read this short essay explaining why. 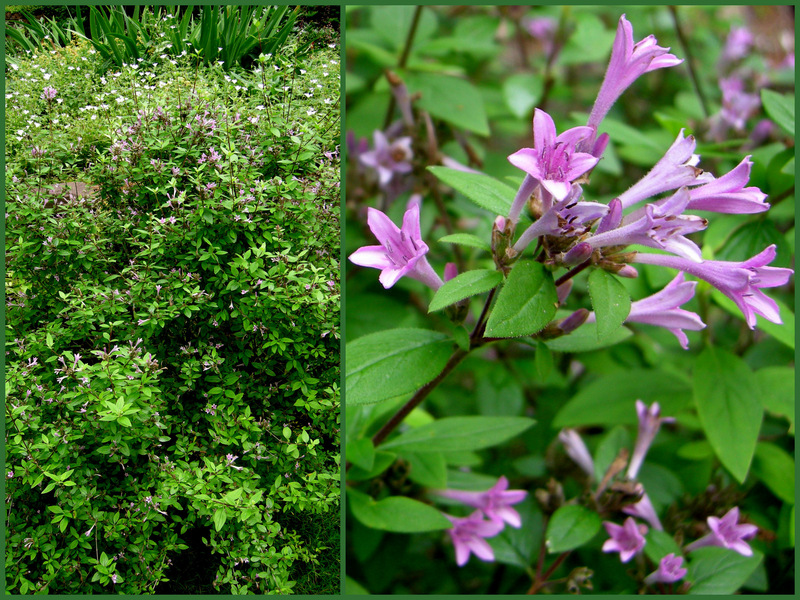 And Pennsylvania’s native plants really come into their own in the fall eliminating the need for dressing with mums! To read Part 1, A Few Fall Favorites for Foliage and Fruit, click here. Stay tuned for Part 3, Hostas for Fall. 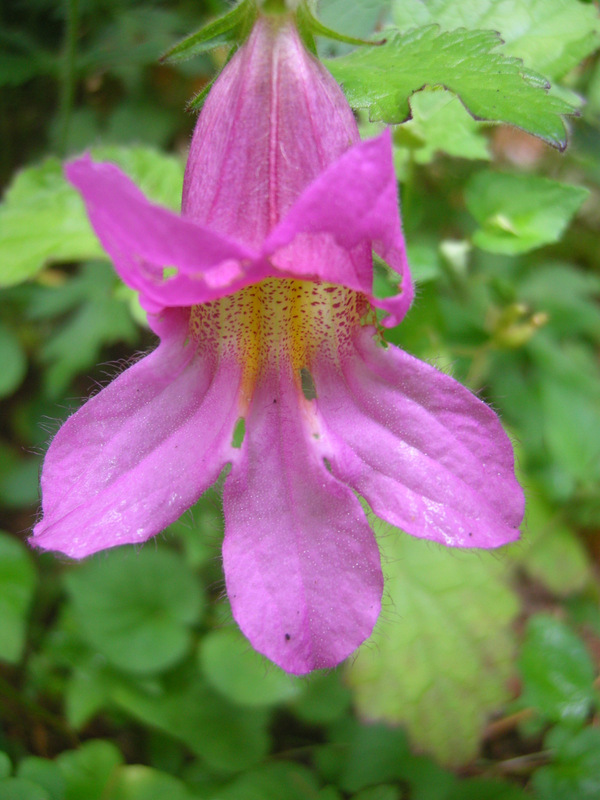 In the interest of full disclosure, I must confess that sadistic botanists have recently changed the botanical names of many of the native plants that I highlighted to completely unpronounceable and unspellable but “botanically proper” names. At this point, I refuse to follow. Nursery Happenings: The nursery closes for the year on October 16. 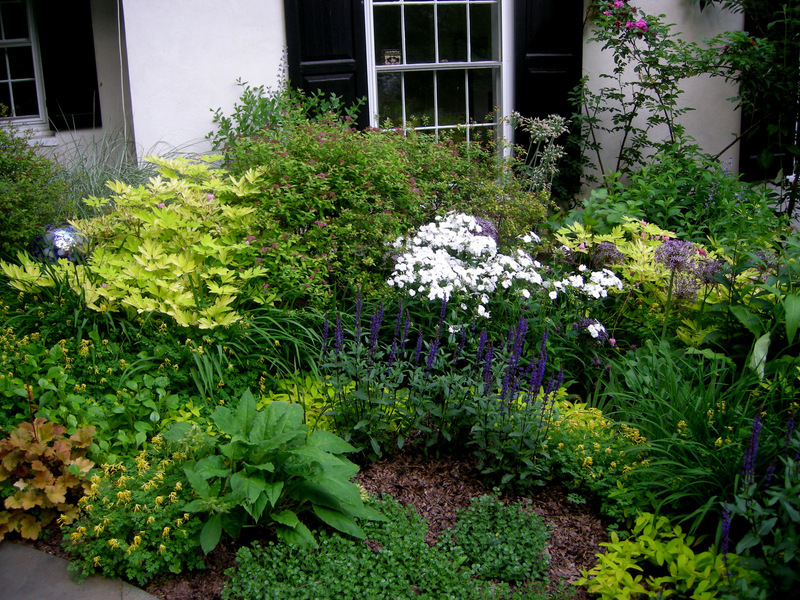 Summer is here, and we have reached the middle of the month when I encourage each of you to walk around your garden and assess what you need to add to make this season an exciting time in your landscape. This time of year I like to focus on the “energizer bunnies” of the garden: plants that bloom or rebloom from late spring through fall. Plants in this category will have “EB” following their caption description. They give me a reason to stroll in my garden when the weather is not as inviting as spring. 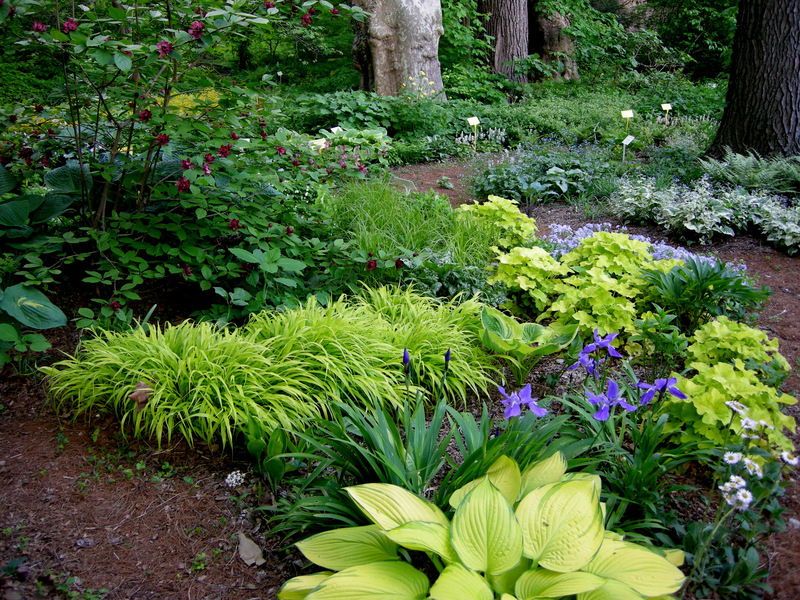 Make sure your garden doesn’t end with the spring rush by adding plants that bloom through summer. 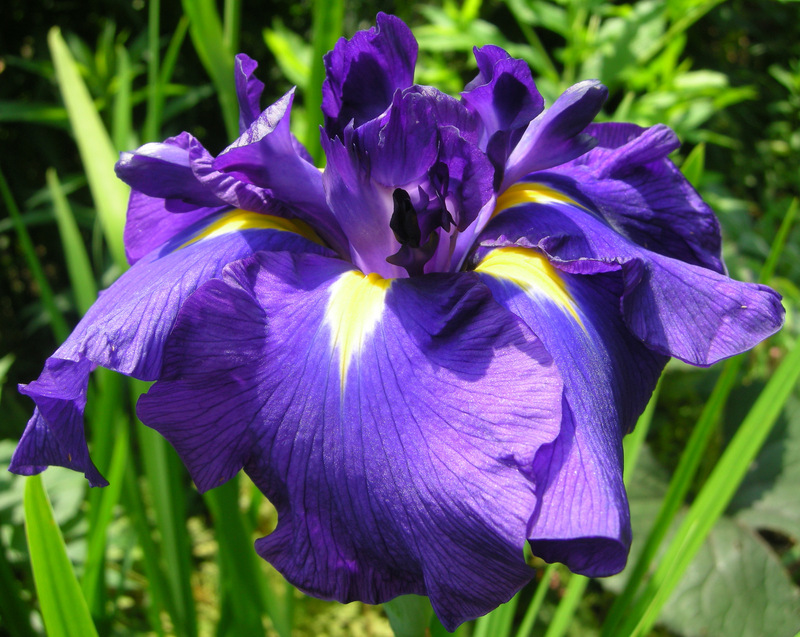 I love irises, and I think Japanese iris, I. kaempferi, is my favorite. The colors and the flower shapes are magical. Make a list and take photographs so that when you are shopping for plants you know what you need and where it should go. 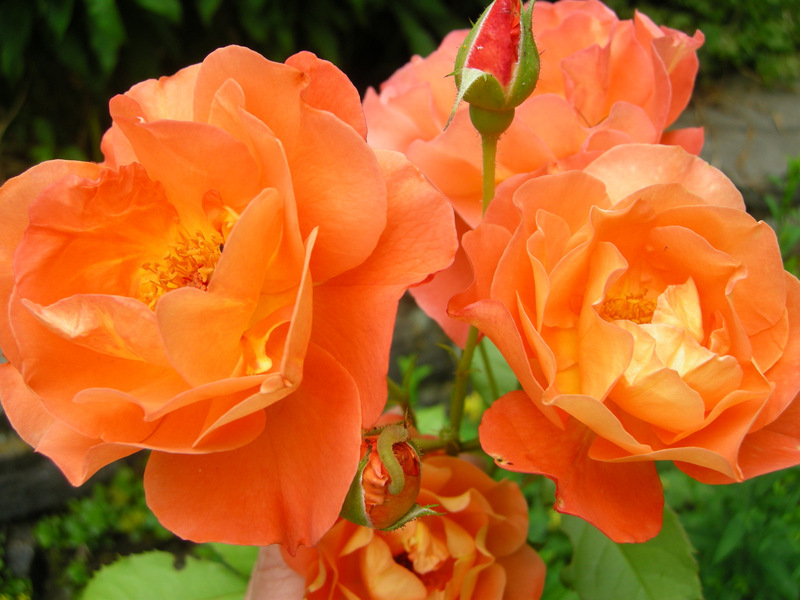 You never know what you might find waiting in your garden like new blooms on my ‘Westerland’ rose (photo at top), which I photographed during my own inventory. 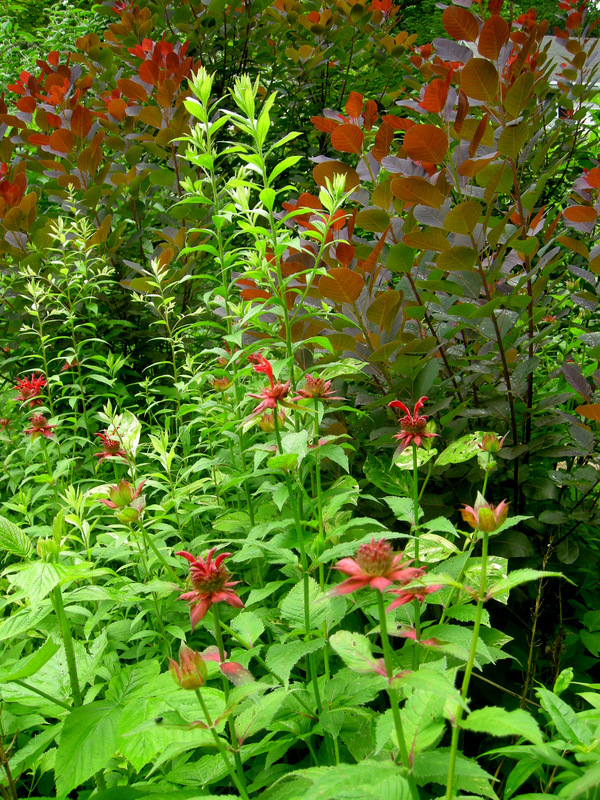 I cut back my ‘Purple Robe’ smokebush, Cotinus coggygria ‘Purple Robe’, every year to improve the leaf color so it never blooms, but I think the red beebalm, Monarda didyma, compliments it nicely. 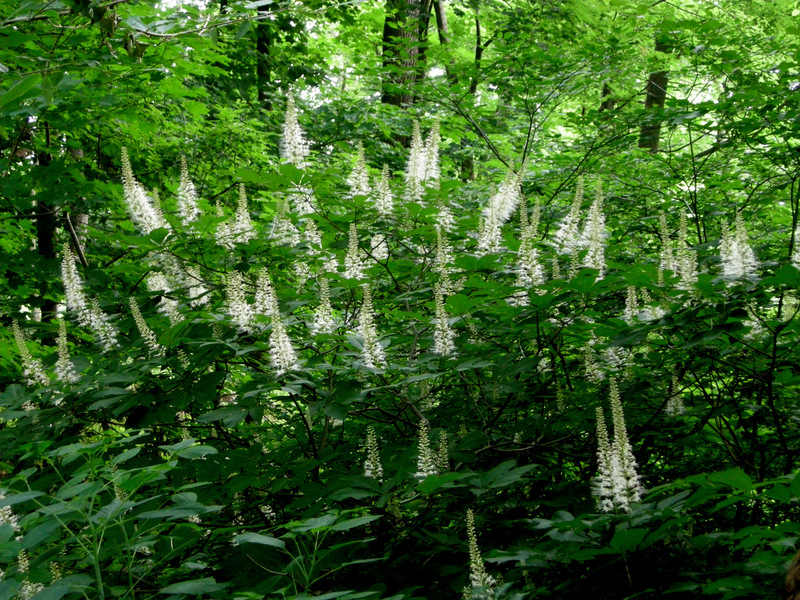 My grove of native bottlebrush buckeye, Aesculus parviflora, is stunning in bloom in full shade. 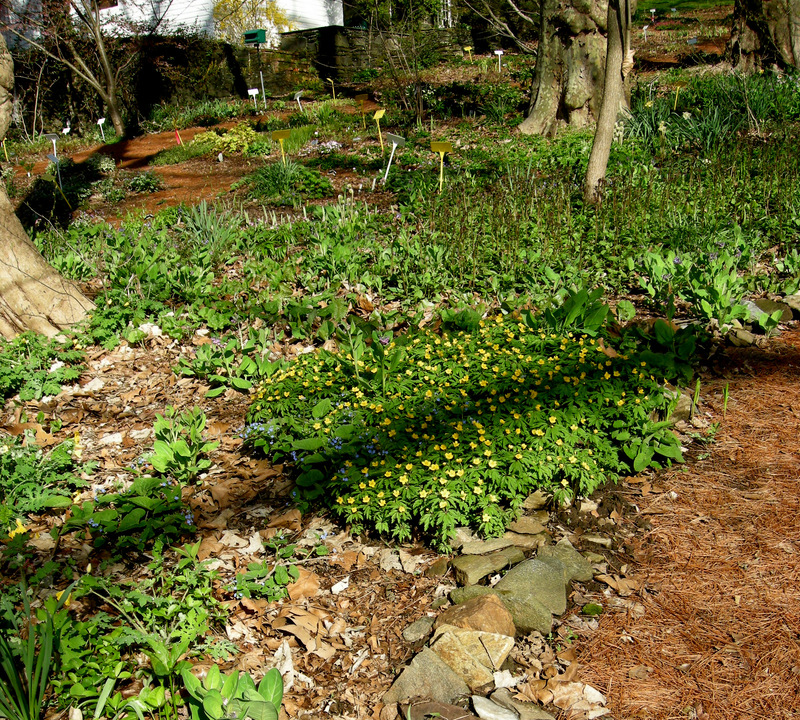 St. John’s wort is a woody subshrub that I cut back almost to the ground in the spring when I see signs of new growth. 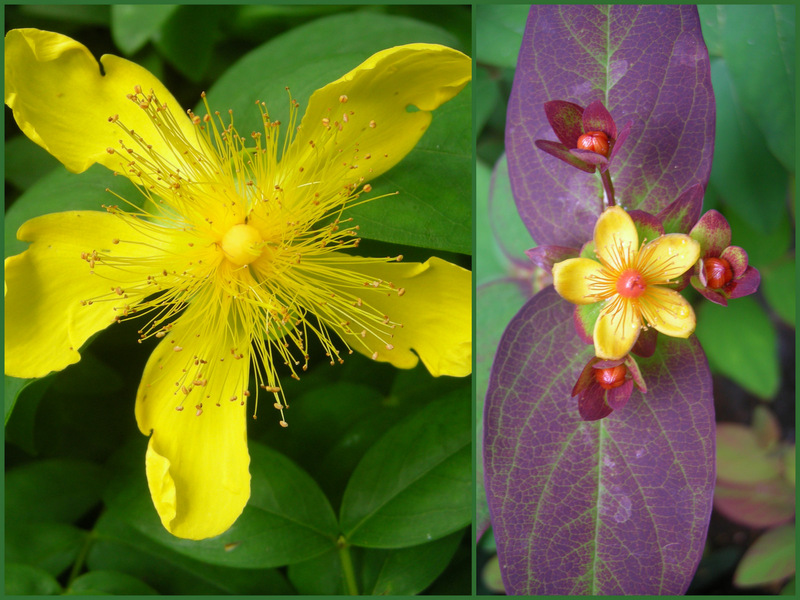 Hypericum calycinum on the left and H. androsaemum ‘Albury Purple’ on the right. 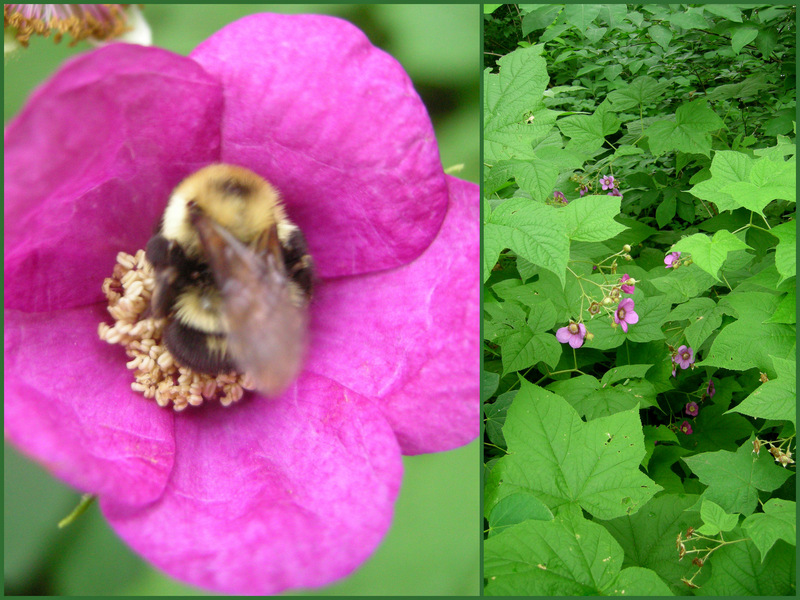 I am surprised that more gardeners do not grow native flowering raspberry, Rubus odoratus. 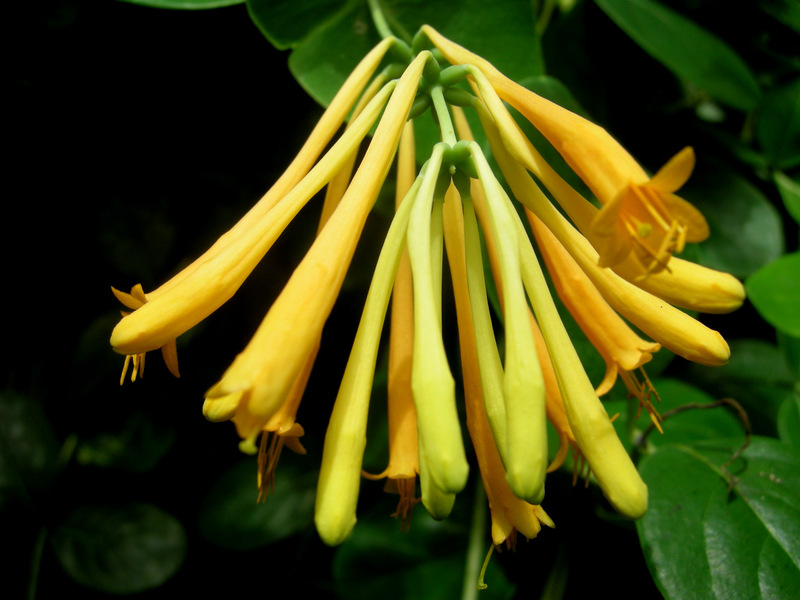 It is a gorgeous tropical looking shrub for full shade with brightly colored raspberry flowers. The native bees love it. This rare and unusual plant, Chinese foxglove, Rehmannia elata, appeared in my rock garden without my help, but I am glad it did. 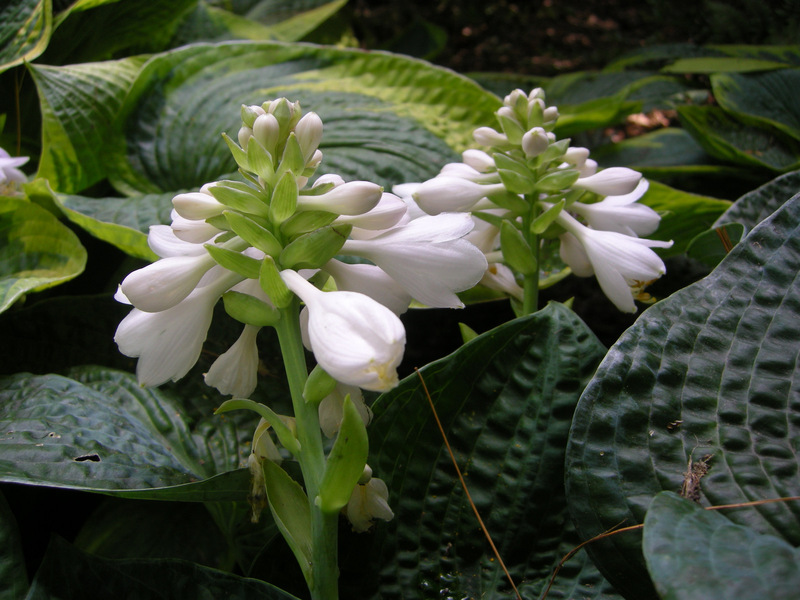 Many hosta have quite beautiful flowers, especially if they are compact and white, here the species Hosta tokudama. 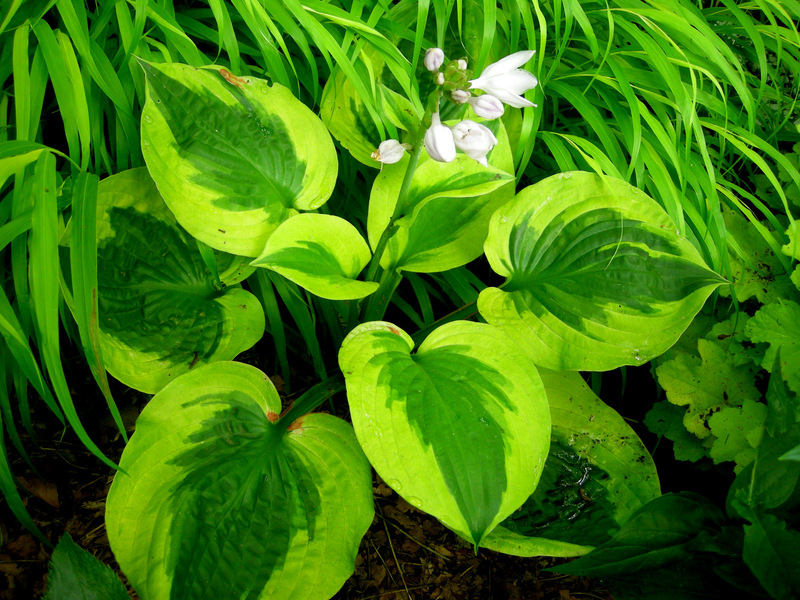 The gorgeous corrugated blue leaves, white flowers, and elegant habit of Hosta ‘Blue Angel’ have stood the test of time. 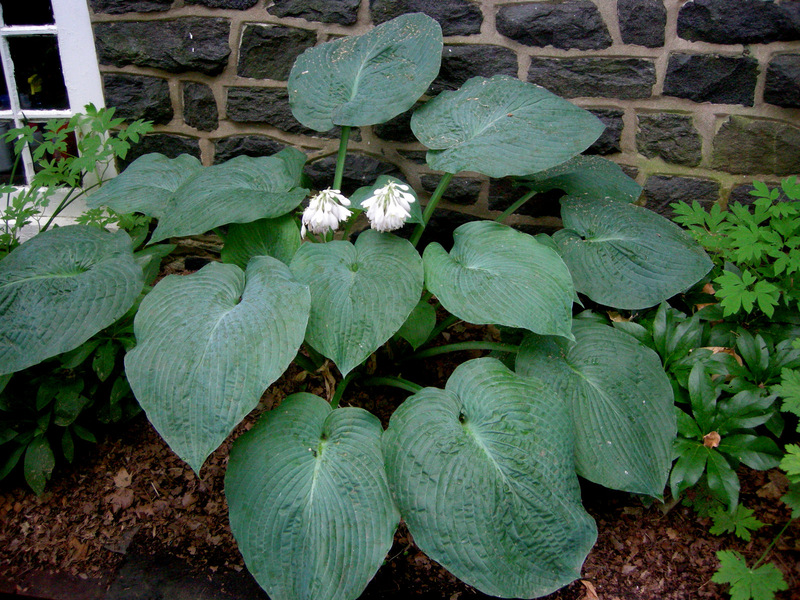 Hosta ‘Great Expectations’ is also a classic with white flowers. I am infatuated with the mouse ears series of miniature hostas, and one of their wonderful attributes is that their flowers are compact and proportional to their size, here ‘Holy Mouse Ears’. 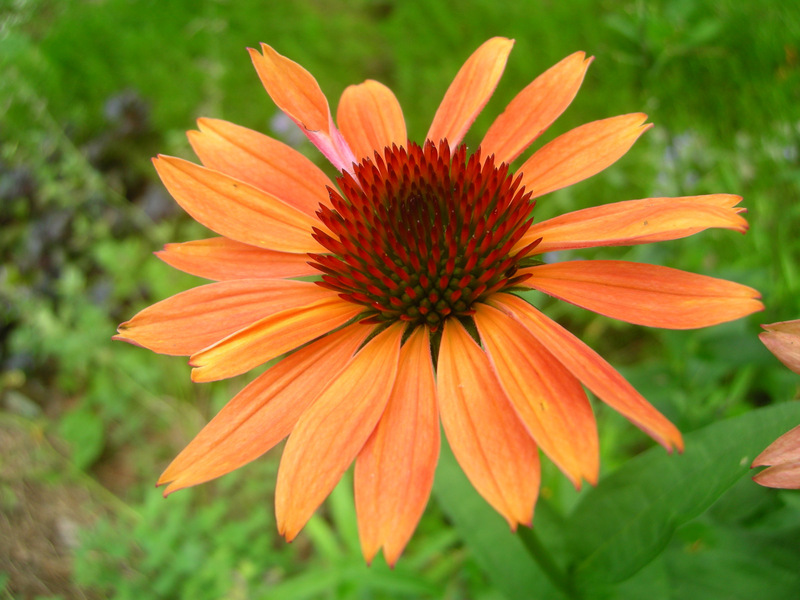 I have tried so many of these orange coneflowers, Echinacea cultivar, only to have them die, revert, or display a virus. This is the only one that survived and, of course, I lost its tag. 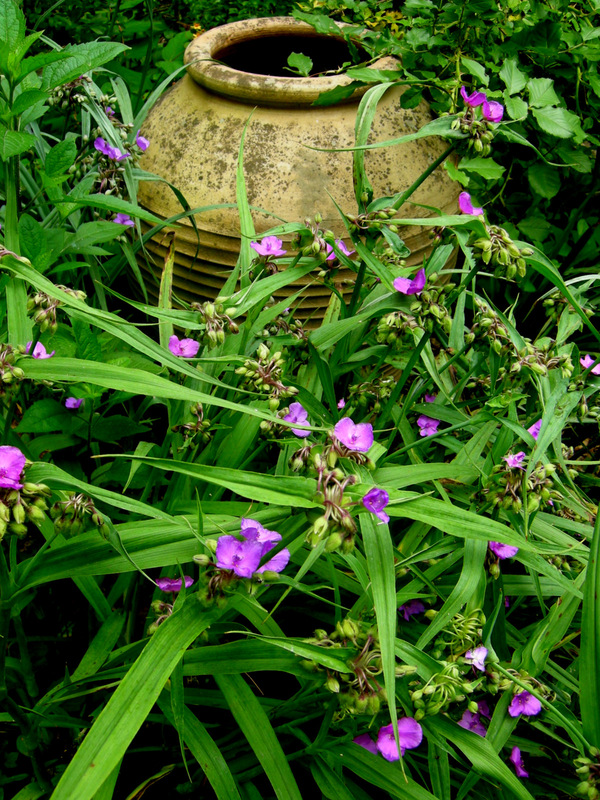 ‘Concord Grape’, Tradescantia ‘Concord Grape’, is my favorite cultivar of US native spiderwort. 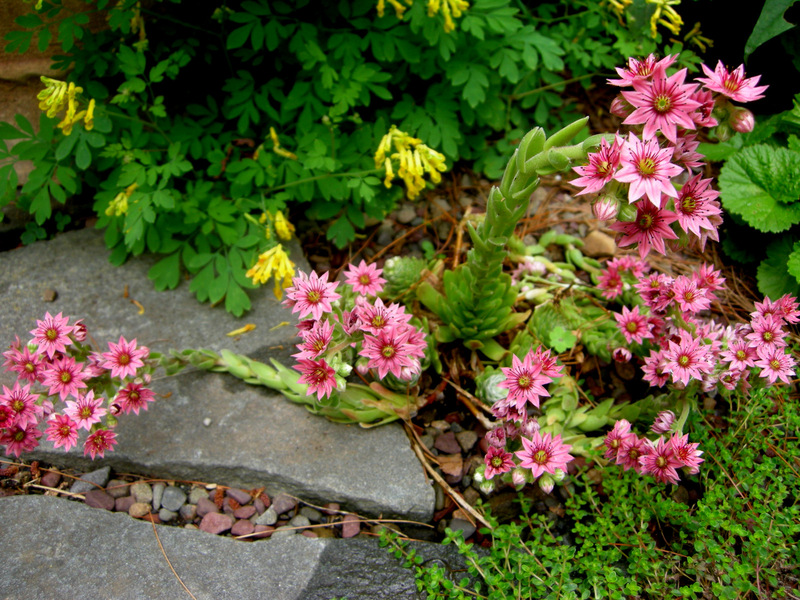 I cut it to the ground completely after flowering to rejuvenate the plant. 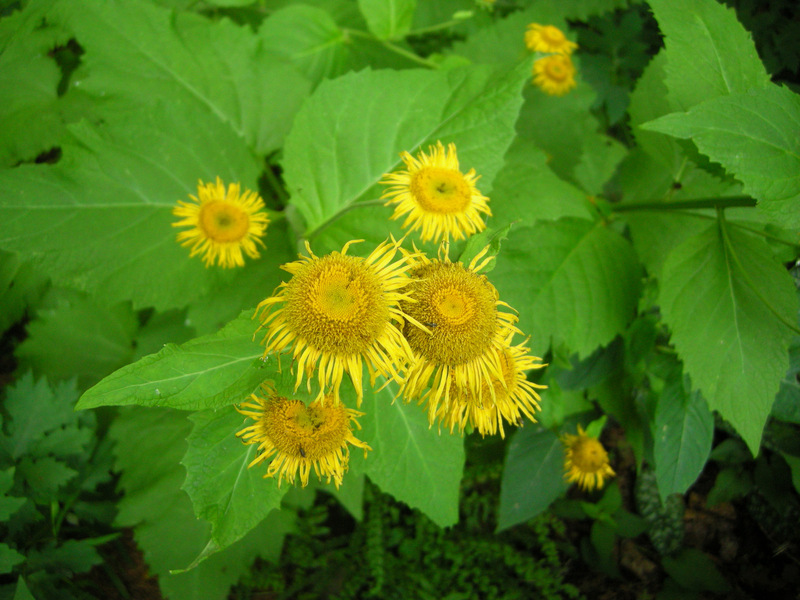 Giant ox eye, Telekia speciosa, is an unusual sunflower-like perennial that reaches 4 to 6 feet tall and 2 to 3 feet wide in the full shade of my London plane trees. I have a collection of hens and chicks, but I think this is my favorite: Sempervivum arachnoideum ‘Red Cobweb’. When not in bloom, the chicks are red and covered with cobwebs. 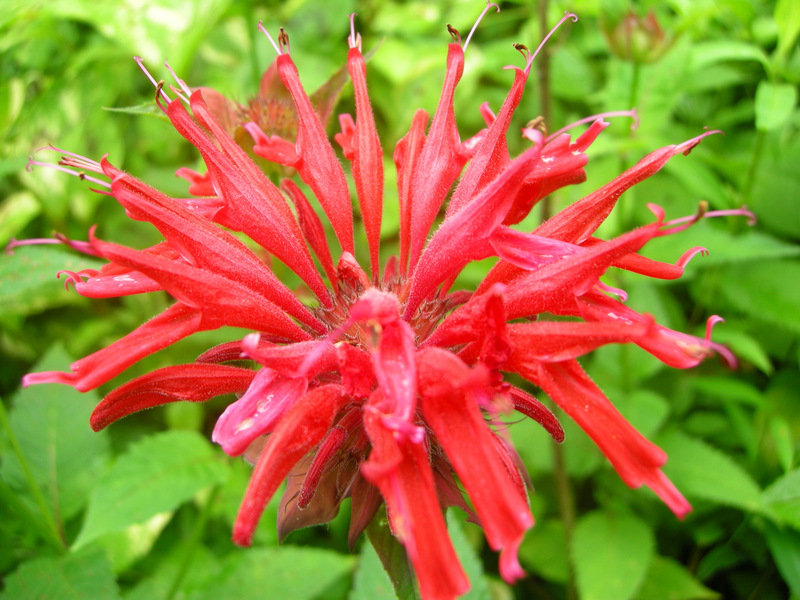 I devote a large space in my meadow (you have to, it spreads) to beebalm, Monarda didyma, the flowers are so spectacular. 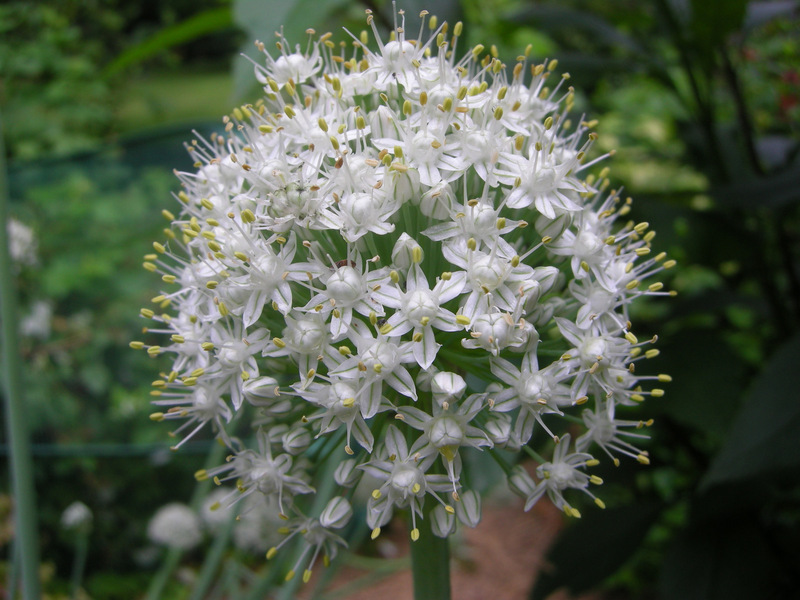 I always let some of my onion sets get away from me so they will produce this beautiful flower after all my other alliums are done. 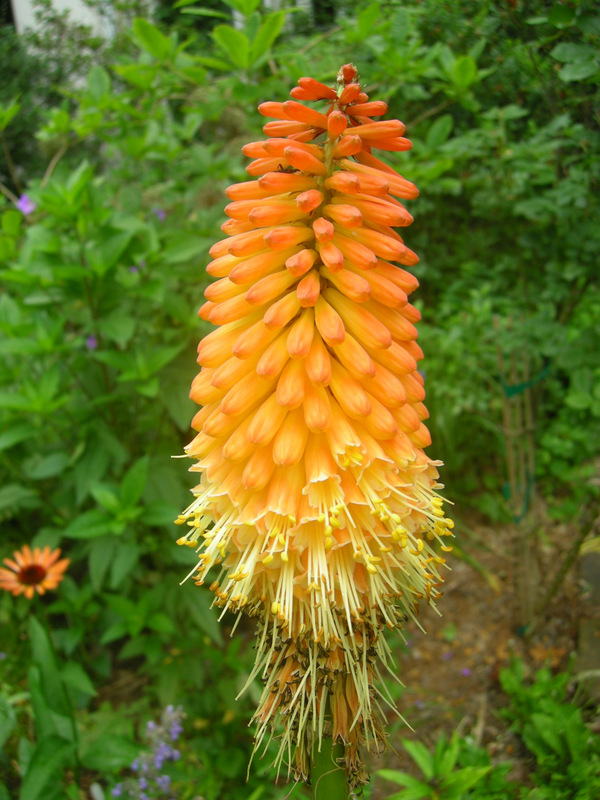 If I had the right growing conditions for red hot pokers, Kniphofia ‘Alcazar’, I would have every cultivar, but sunny, hot, dry, well drained conditions are few and far between at Carolyn’s Shade Gardens. 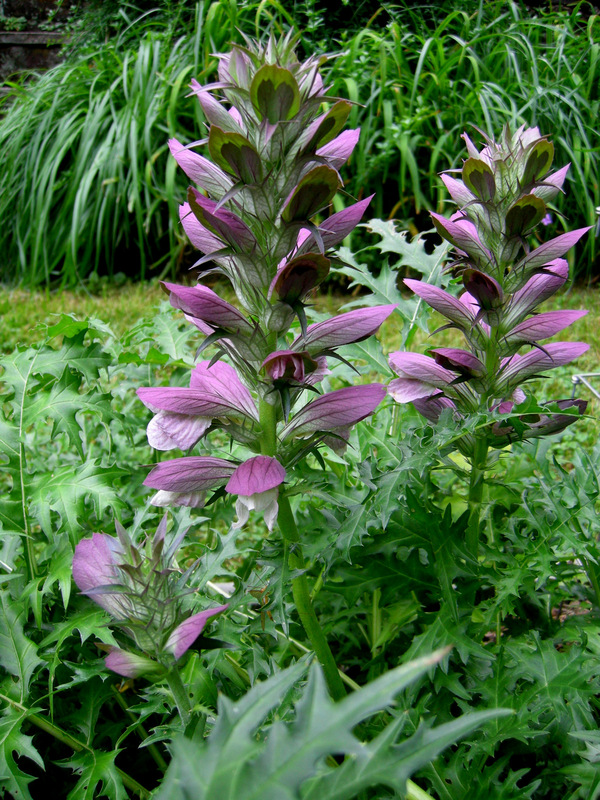 Please let me know in a comment/reply which flowers are “energizer bunnies” in your summer garden. If you participated in GBBD, please provide a link so my nursery customers can read your post. Notes: Click on any photo to enlarge. Every word that appears in orange on my blog is a link that you can click for more information. If you want to return to my website’s homepage to access the sidebar information (catalogues, previous articles, etc. ), just click here. Nursery Happenings: The nursery is closed until it cools off in the fall around the middle of September. If you are on my customer email list, look for an email. If not, sign up by sending an email to carolynsshadegardens@verizon.net with your name and phone number. Yes, it really is that color: herbaceous peony ‘America’. Even though it is not technically summer yet, we have been hit with weather that my twenty-year-old son informed me is more suitable for August. Six of the last eleven days (as of June 10) have been over 90 degrees, and on June 9 it topped 97 degrees (36 degrees C). 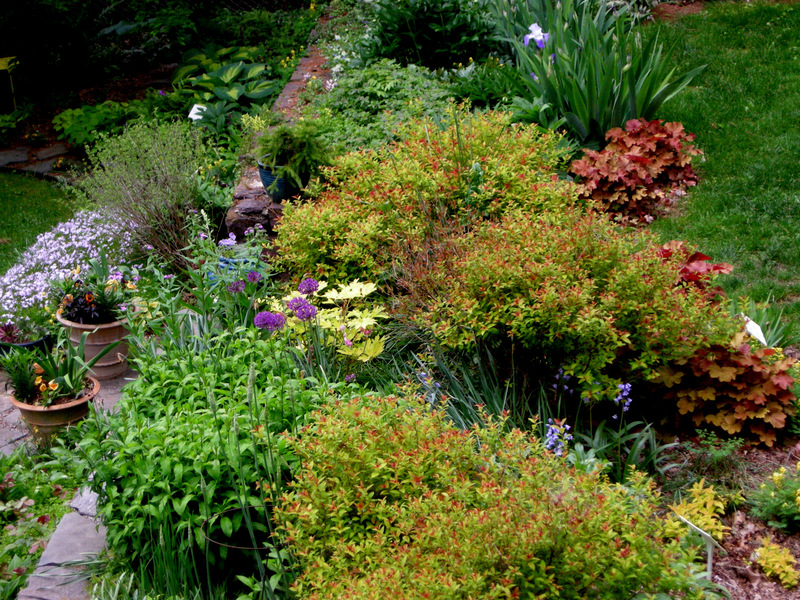 Nevertheless, we have reached the middle of the month when I encourage each of you to walk around your garden and assess what you need to add to make early summer an exciting time in your landscape. 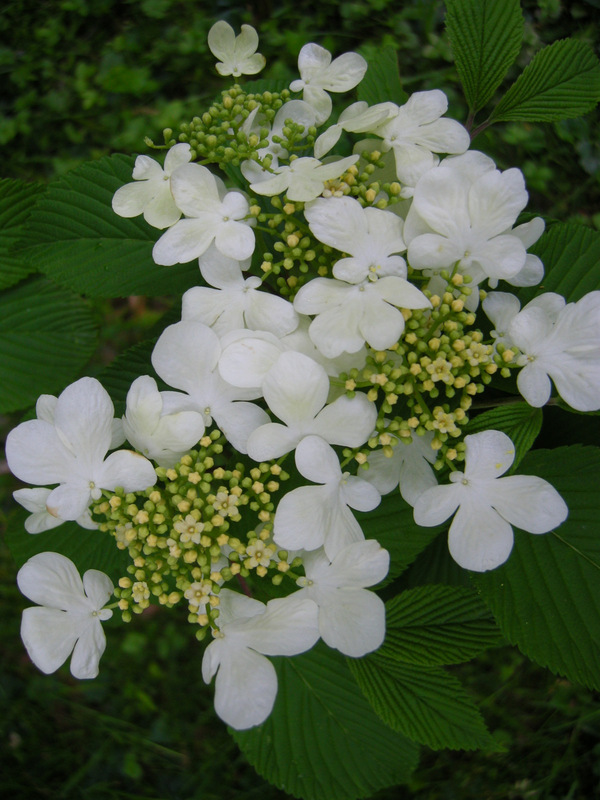 Do you need more flowering trees, shrubs, and vines to give you a reason to stroll in your garden? 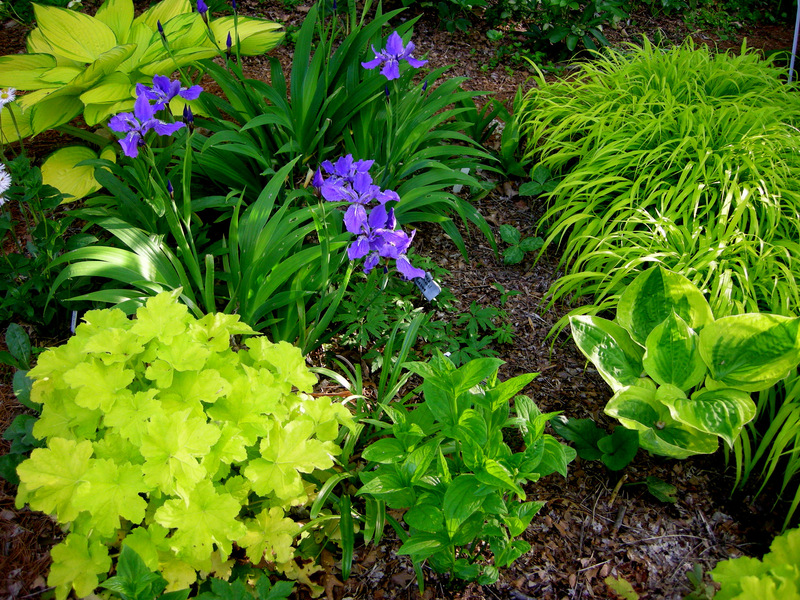 Could your garden benefit from more perennials that bloom in June after the spring rush? 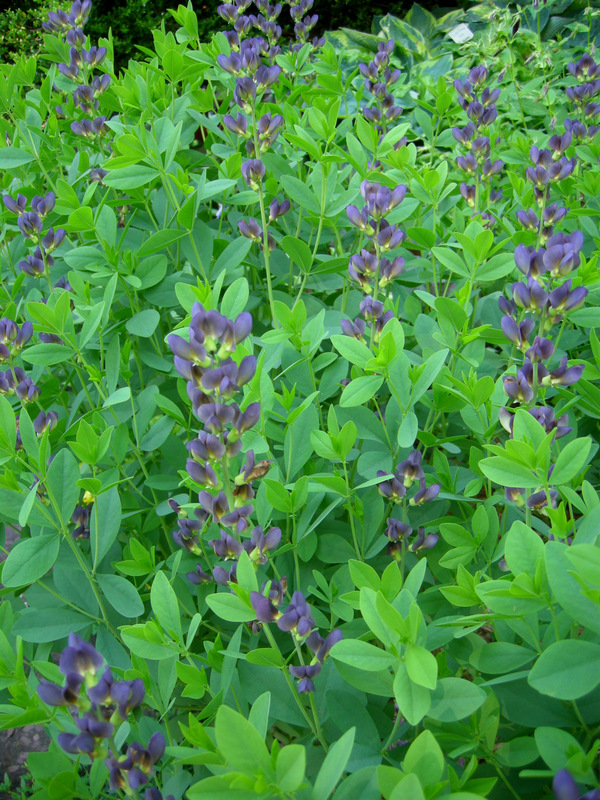 Native hybrid false indigo, Baptisia x variicolor ‘Twilite Prairieblues’, provides a cool oasis for the eyes. Make a list and take photographs so that when you are shopping for plants you know what you need and where it should go. 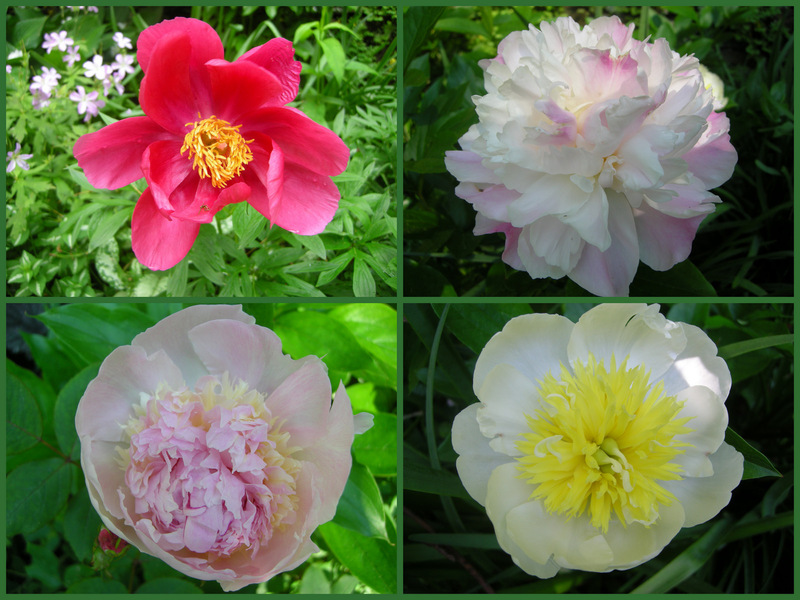 It’s beautiful outside now that the temperatures have dropped back into the 70s and low 80s (June 11), and you never know what you might find waiting in your garden like the jaw-droppingingly beautiful red peony (photo at top), which I photographed during my own inventory. 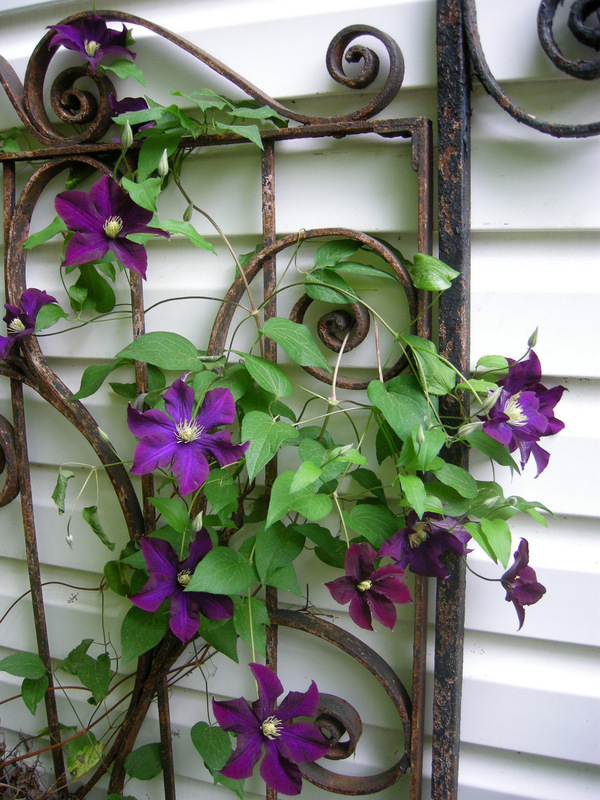 Clematis ‘Warsaw Nike’ on an antique church gate. 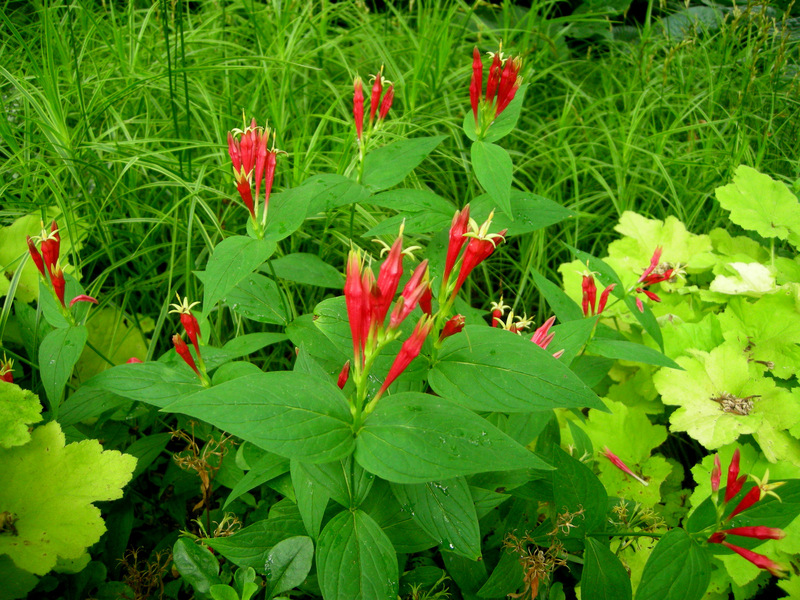 Native hummingbird magnet Indian pink, Spigelia marilandica. Sicilian honey lily, Nectaroscordium siculum ssp. bulgaricum, just appeared in my garden one day, but I am glad it did. 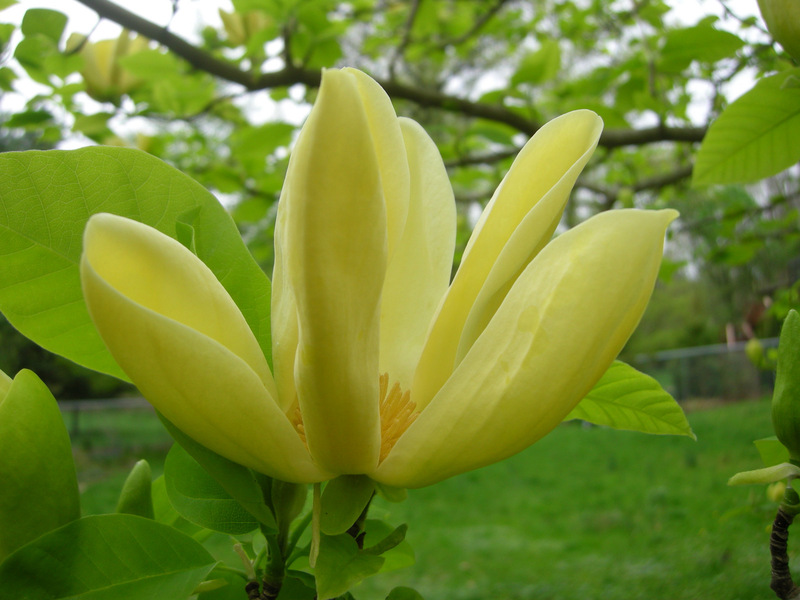 Oyama magnolia, M. sieboldii, was still in bud on May 15, but came into bloom shortly thereafter. It is a great tree for part shade. I can’t decide whether I like the bud just before it opens or the flower better. The gorgeous flowers point down and are best viewed from below. 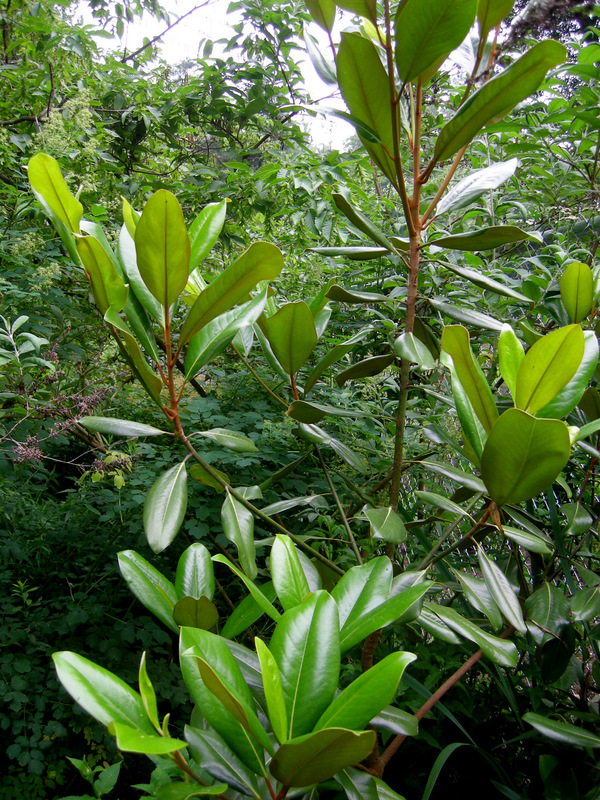 Native sweetbay magnolia, M. virginiana, also grows in the shade. 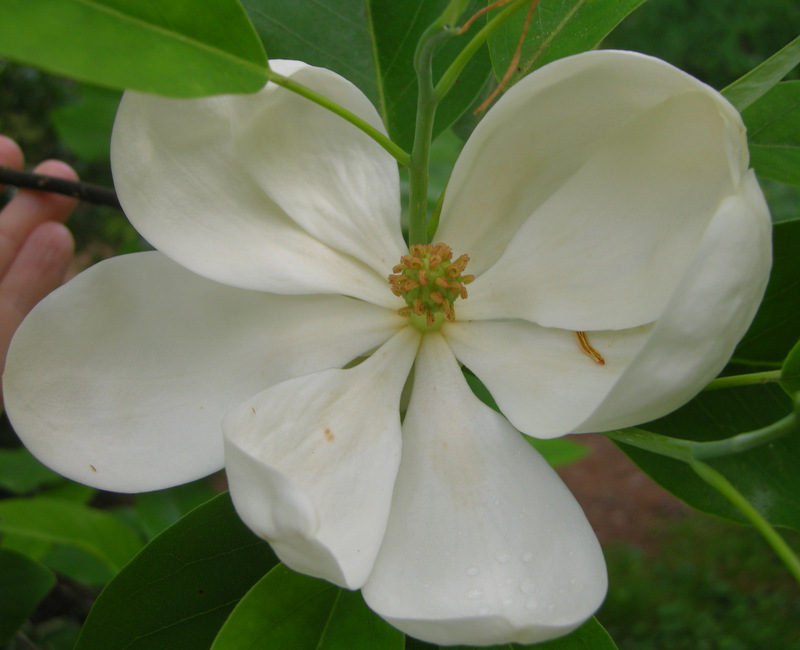 The flowers of sweetbay magnolia have the best fragrance of any magnolia I grow. My native southern magnolia, M. grandiflora, will never compare to specimens growing in the south, but it is still a beautiful evergreen tree suitable for part shade. 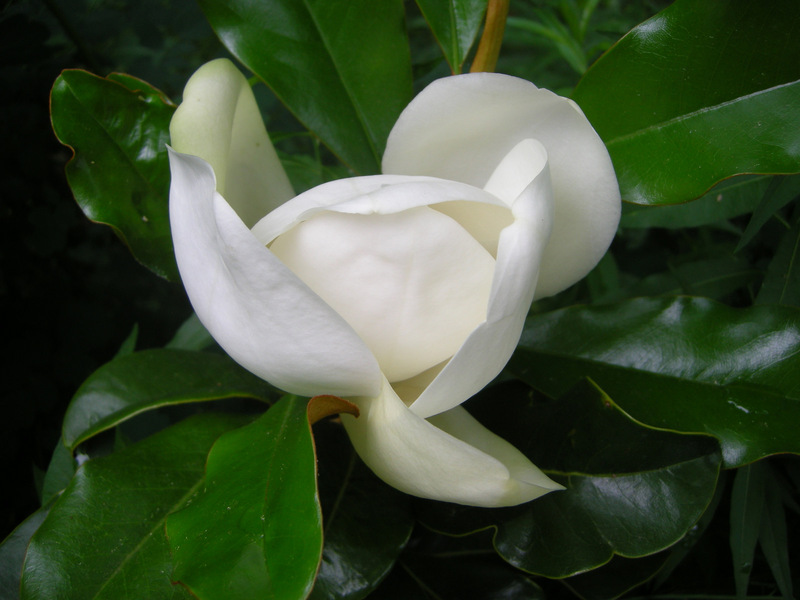 Southern magnolia starts blooming in mid-June. Native pagoda dogwood, Cornus alternifolia, suckers to form a colony. 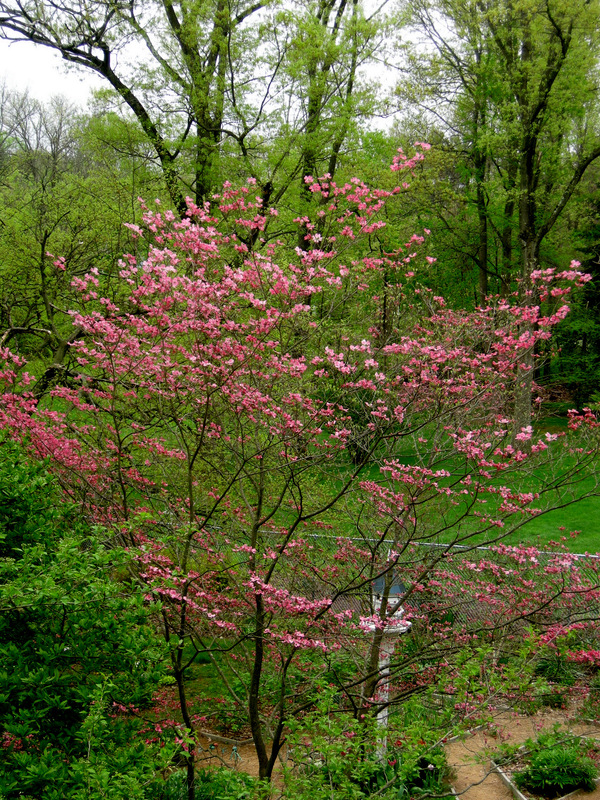 The flowers of pagoda dogwood produce beautiful pink-stemmed blue berries loved by birds. 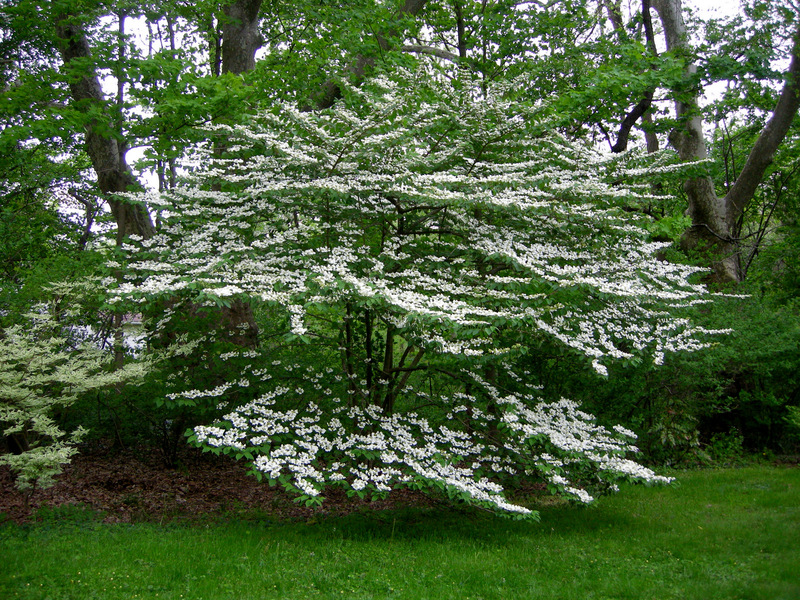 The Rutger’s hybrid dogwood, Cornus x ‘Constellation’, is a cross between Kousa dogwood and our native flowering dogwood. 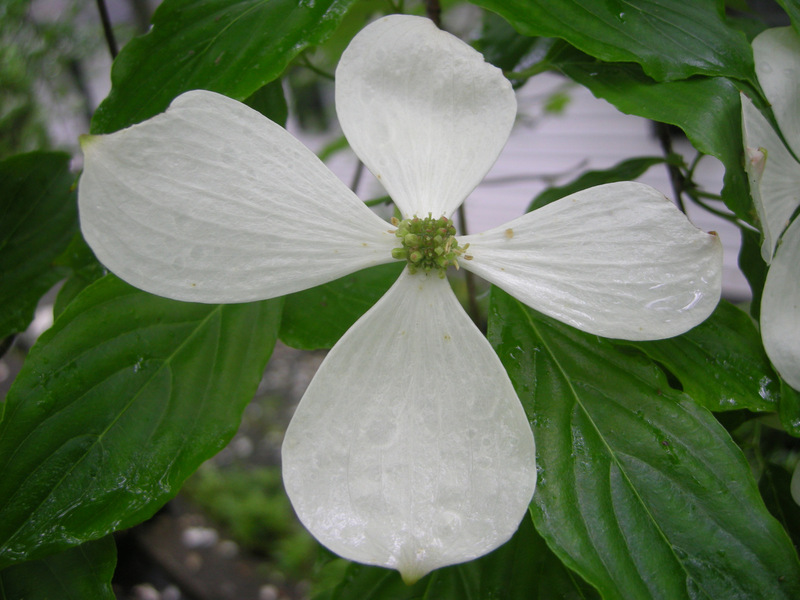 ‘Constellation’ flowers between its two parents–great for extending the dogwood season– and is disease resistant. 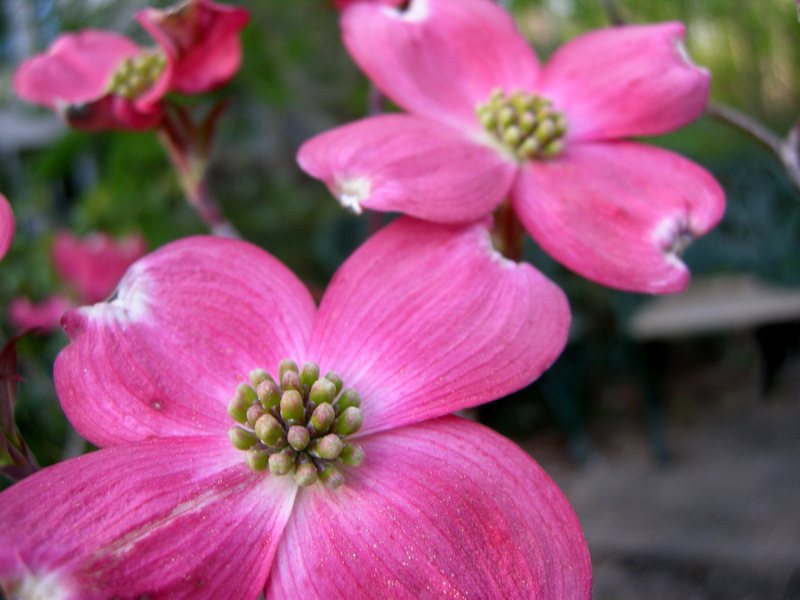 Kousa dogwood, Cornus kousa, flowers the latest of all my dogwoods. 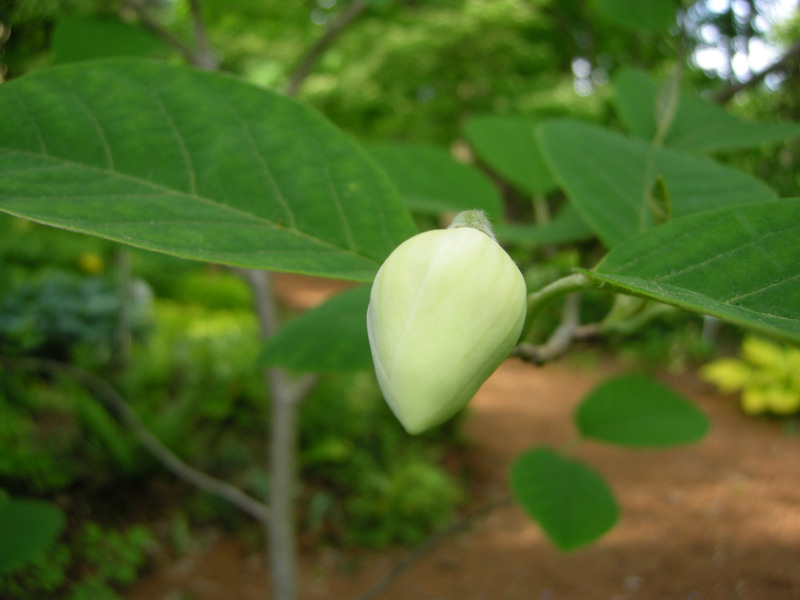 The flowers of kousa dogwood are followed by very showy cherry-like fruit. 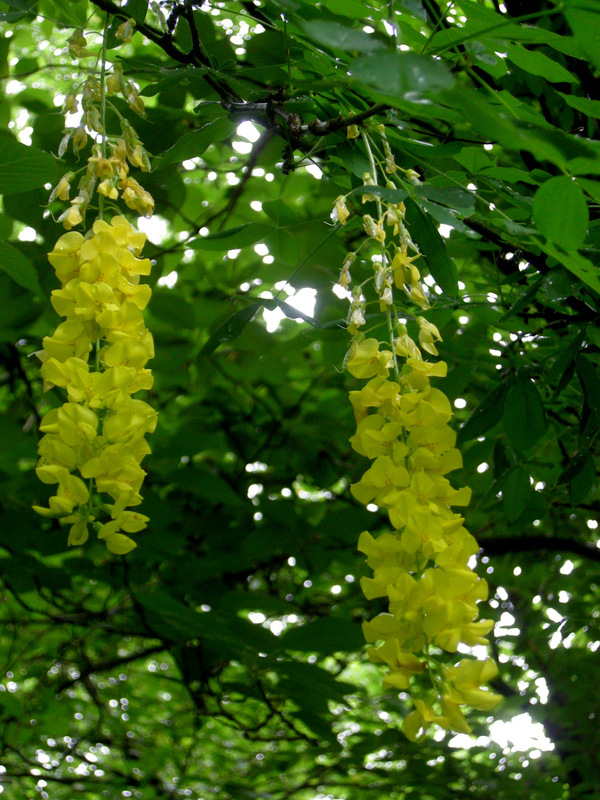 I have a very old golden-chain tree, Laburnum wateri, which I love but really should replace. 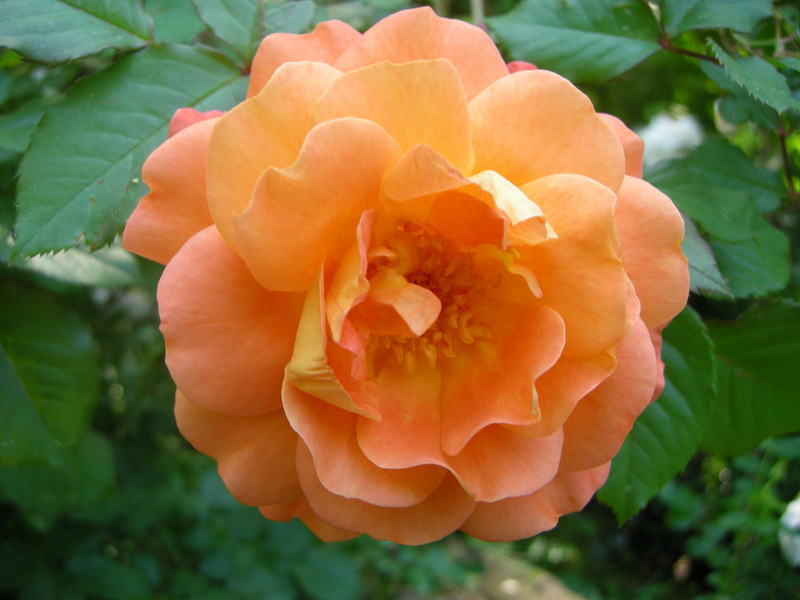 The shrub rose ‘Westerland’ is truly magical. 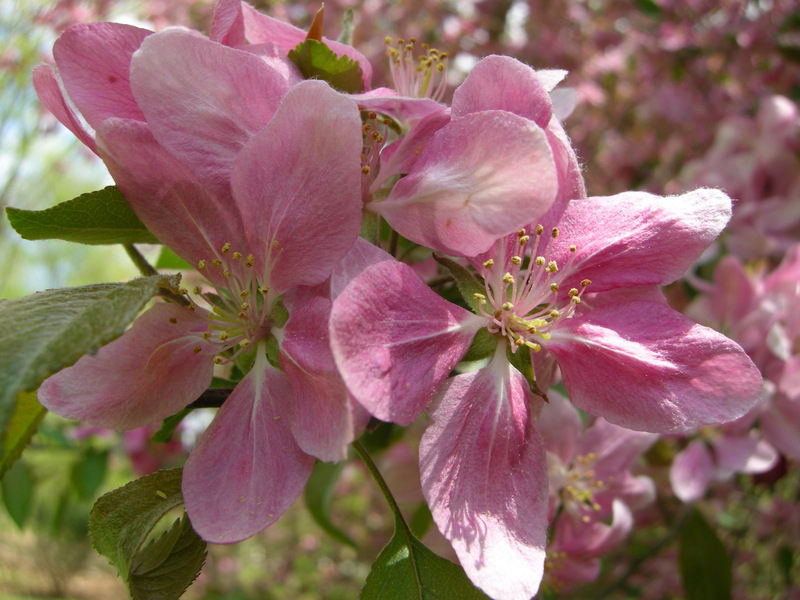 The deep red buds open to this gorgeous apricot flower, which ages to a peachy pink. Rugosa roses are completely foolproof, just requiring occasional pruning. 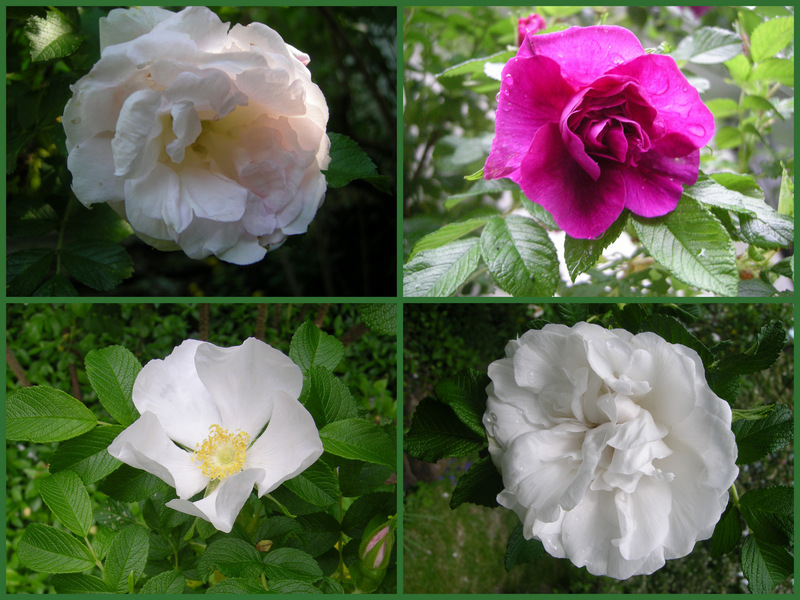 Clockwise from upper left: Rosa rugosa ‘Polar Ice’, ‘Hansa’, ‘Alba Plena’, ‘Alba’. I guess Knock Out roses are considered passe in rose circles, but I can’t help thinking I am going to my first prom every time I look at ‘Blushing Knock Out’. 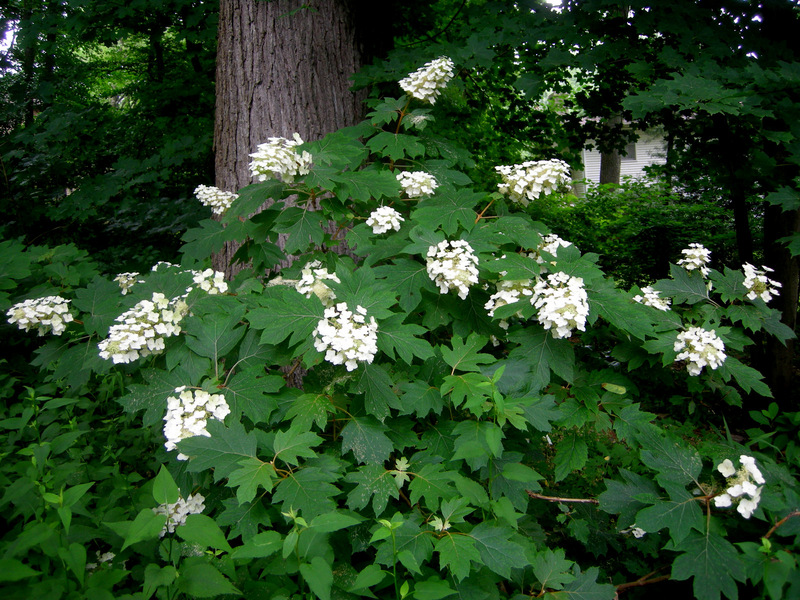 Native oakleaf hydrangea, H. quercifolia, nestled in full shade at the base of my huge black walnut. 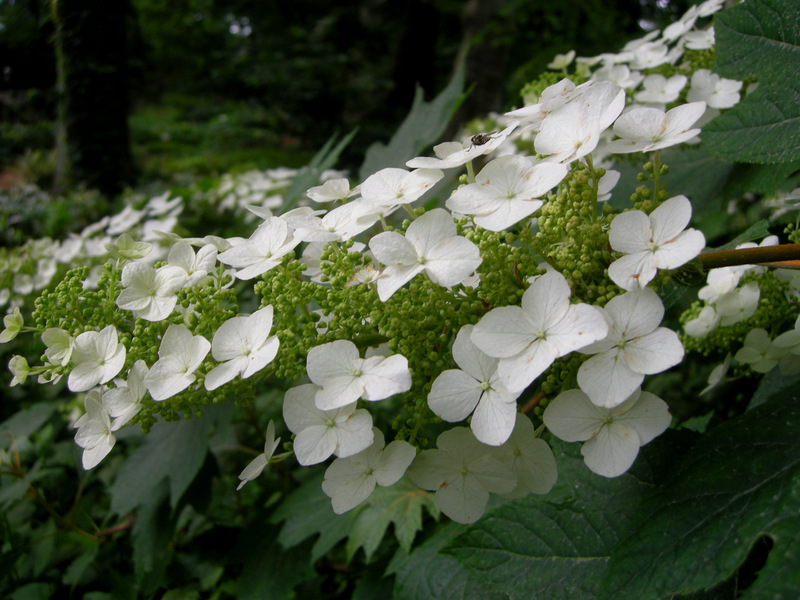 Oakleaf hydrangeas are ornamental 365 days a year, but nothing is more spectacular than their gigantic conical flowers. 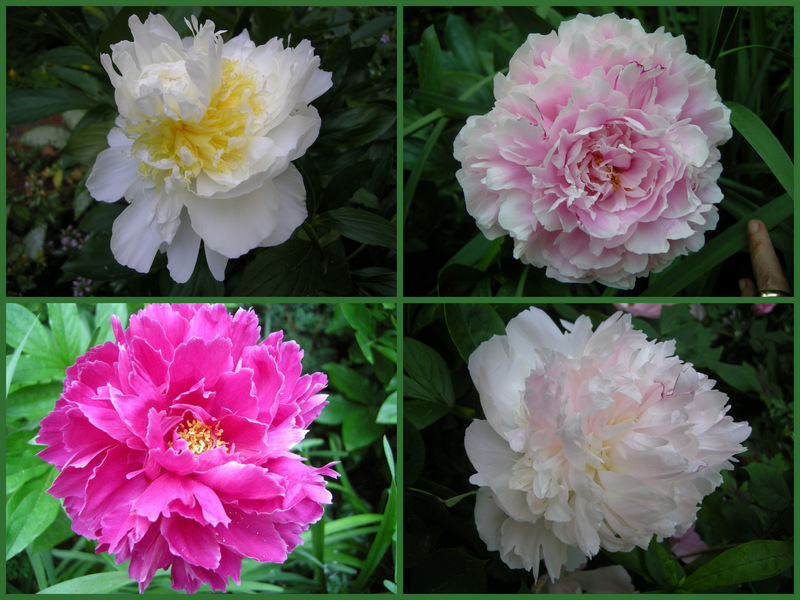 Peonies remind me of my childhood, and I love their fragrance. 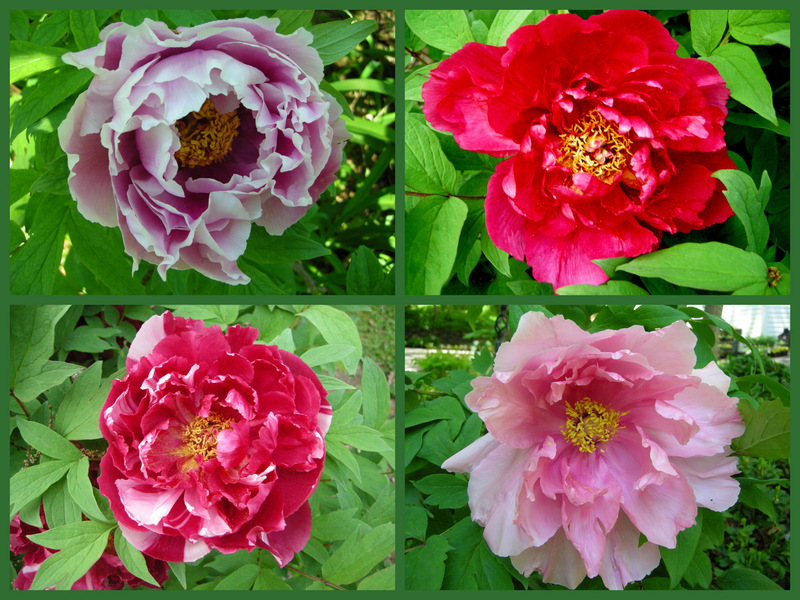 Clockwise from upper left: ‘Coral Fay’, unknown, unknown (dug from a friend’s grandmother’s garden), ‘Raspberry Sundae’. Clockwise from upper left: ‘Cheddar Cheese’, ‘Sarah Bernhardt’, ‘Angel Cheeks’, ‘Karl Rosenfeld’. 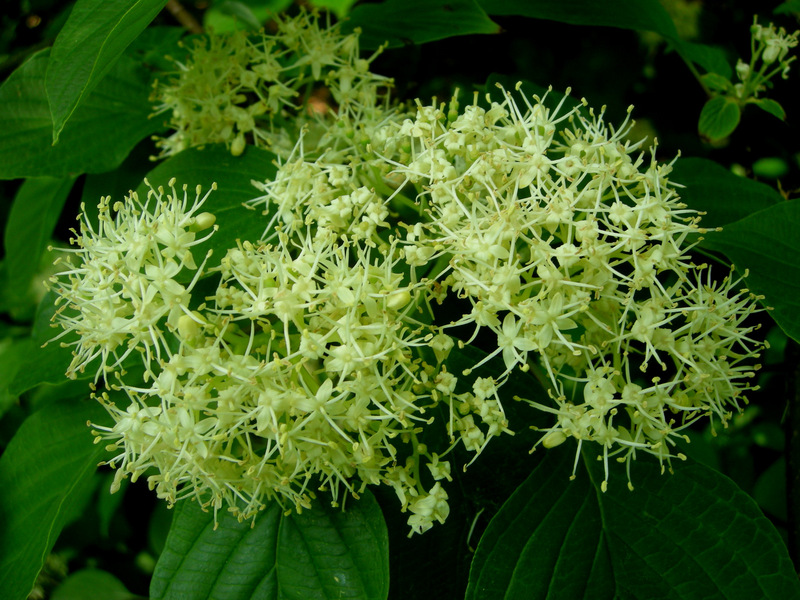 The flowers of my linden viburnum never produce berries. 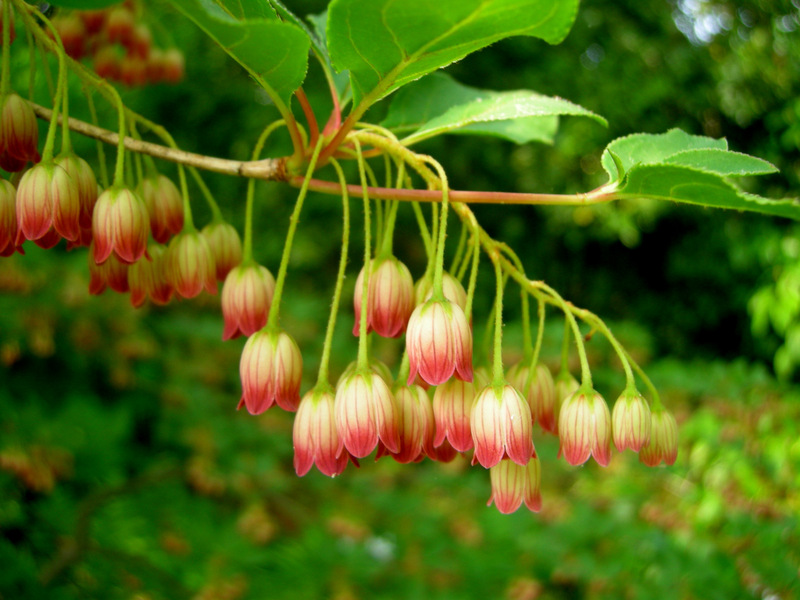 Redvein enkianthus, E. campanulatus, grows in full shade. 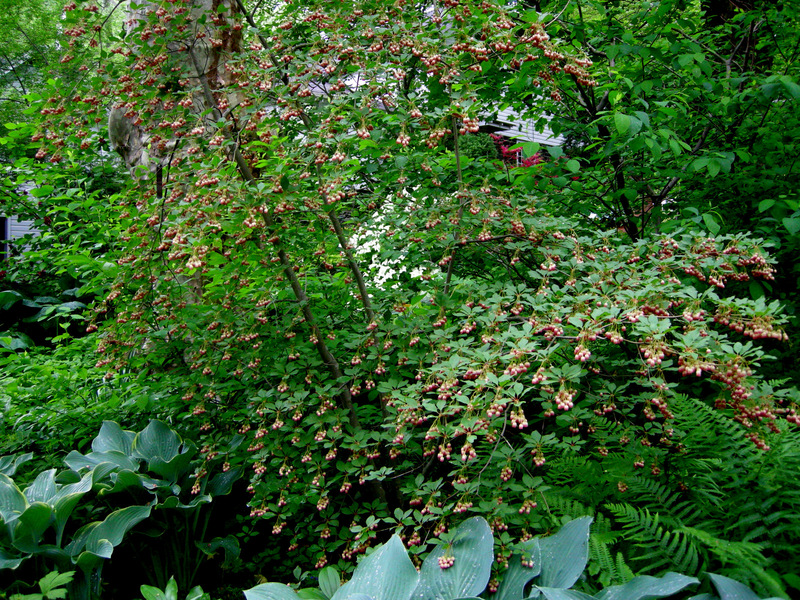 The exotic flowers of redvein enkianthus cover the shrub completely. 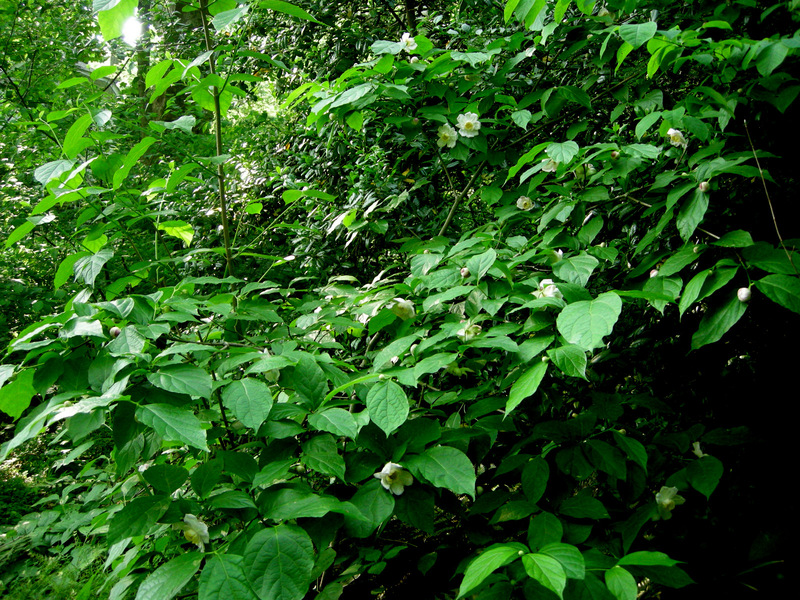 Chinese sweetshrub, Sinocalycanthus chinensis, grows in full shade too. 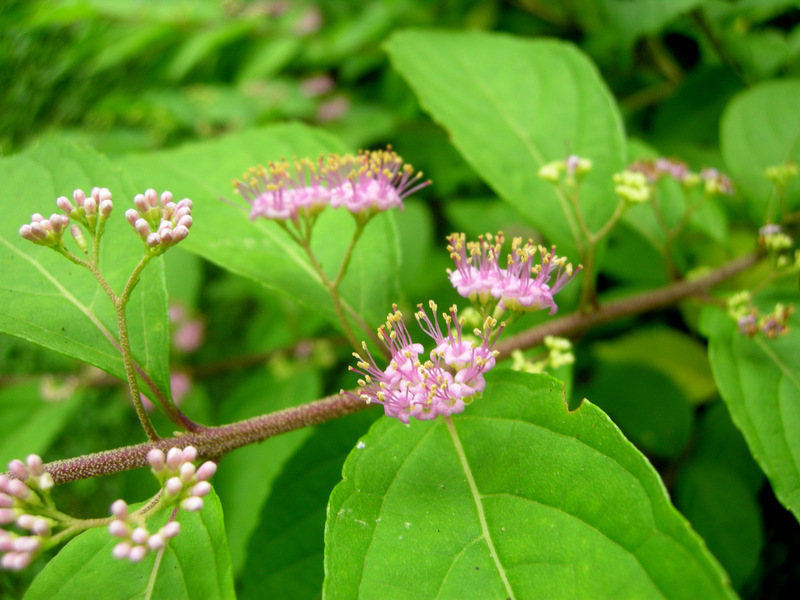 Its flowers are plentiful and gorgeous but not fragrant like our native. 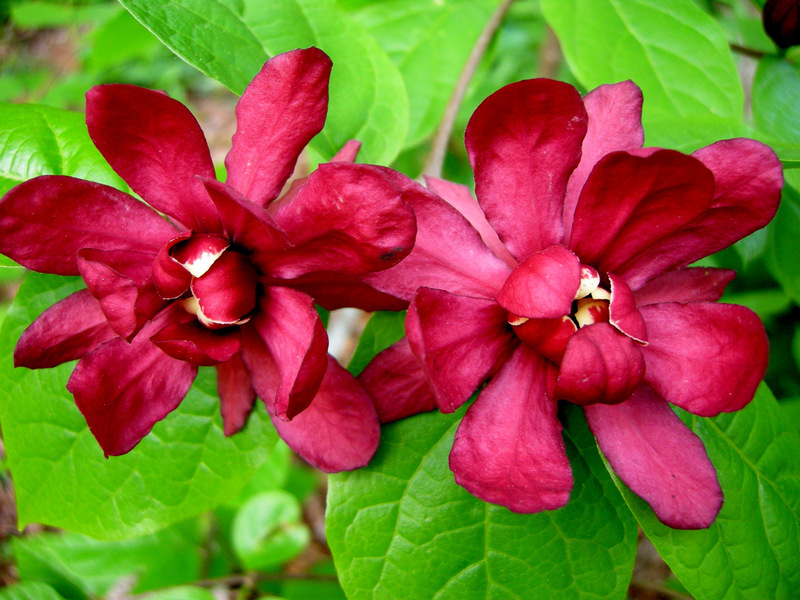 Native hybrid sweetshrub, Calycanthus x ‘Hartlage Wine’, is a cross between the Chinese sweetshrub above and our native. 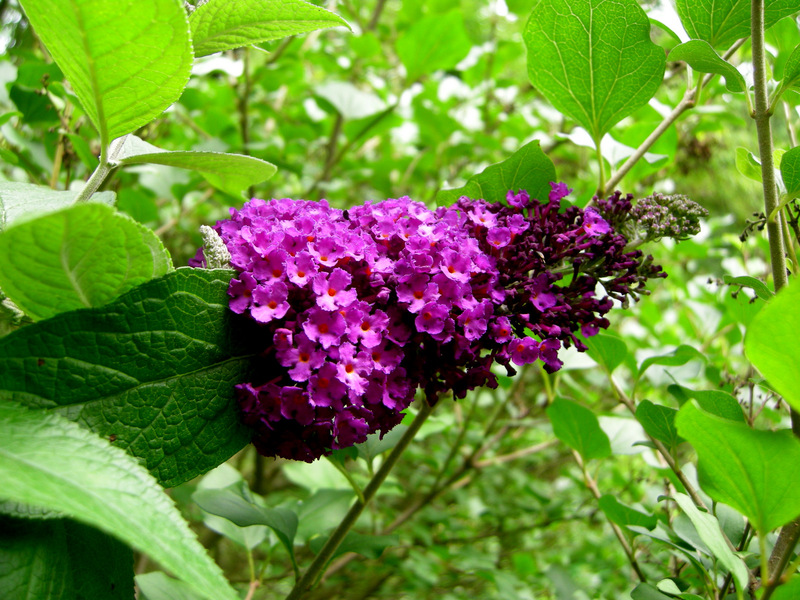 Its flowers and foliage are more beautiful than its parents, but it has no fragrance. Still it is one of my top five favorite shrubs. 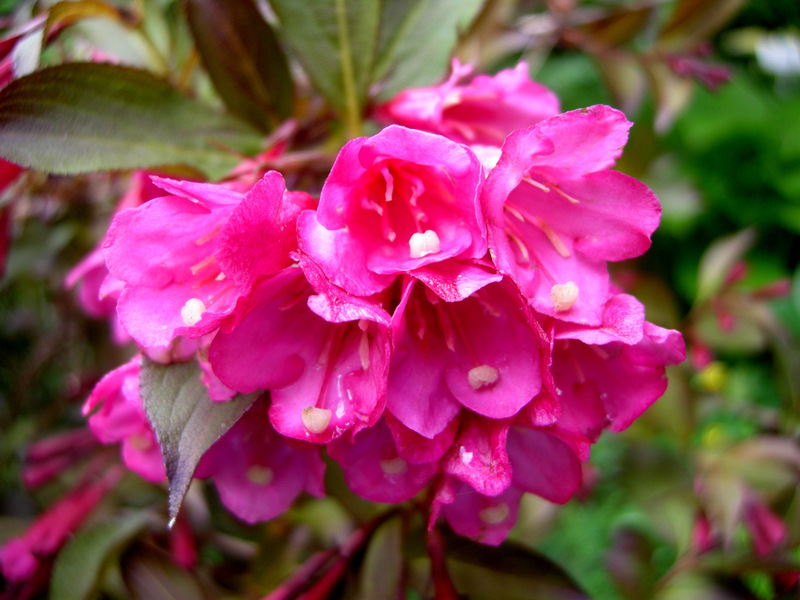 Old-fashioned weigela, W. florida ‘Wine and Roses’, has deep burgundy leaves. 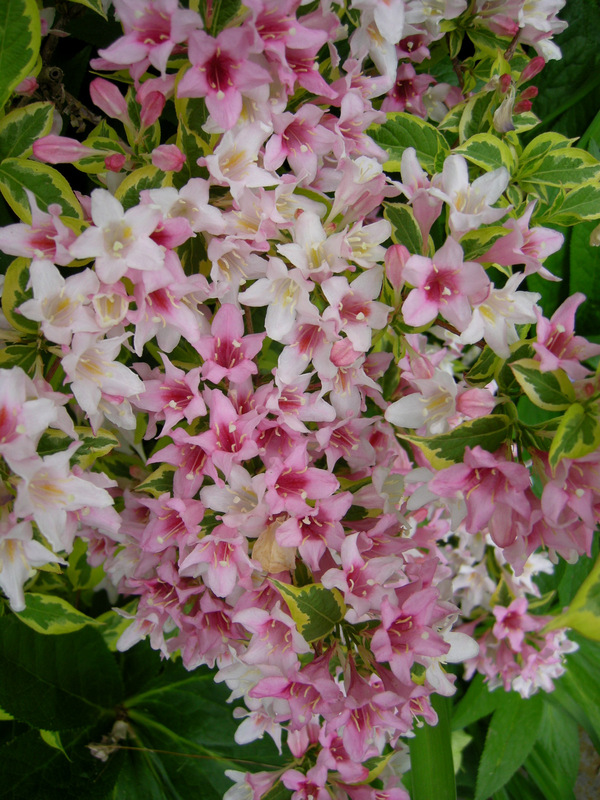 It flowers later than my other weigela cultivars. 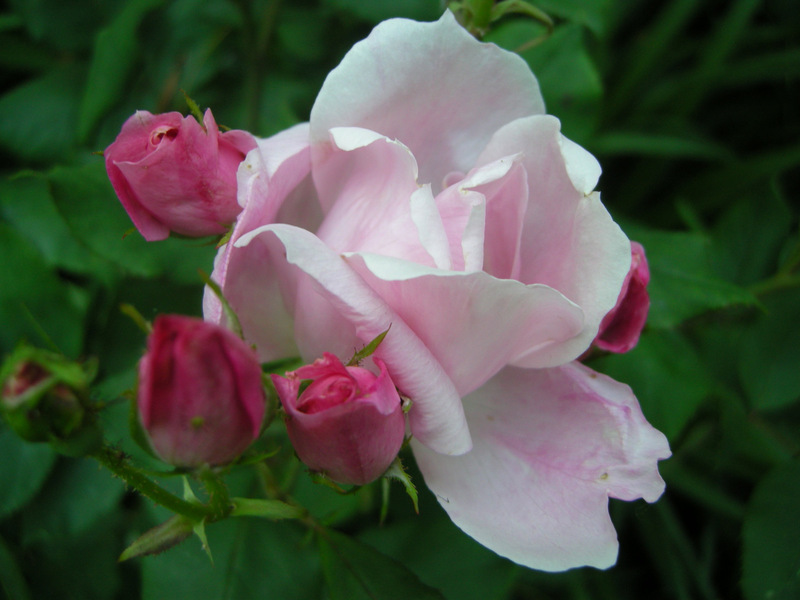 The showy pink flowers of ‘Wine and Roses’. 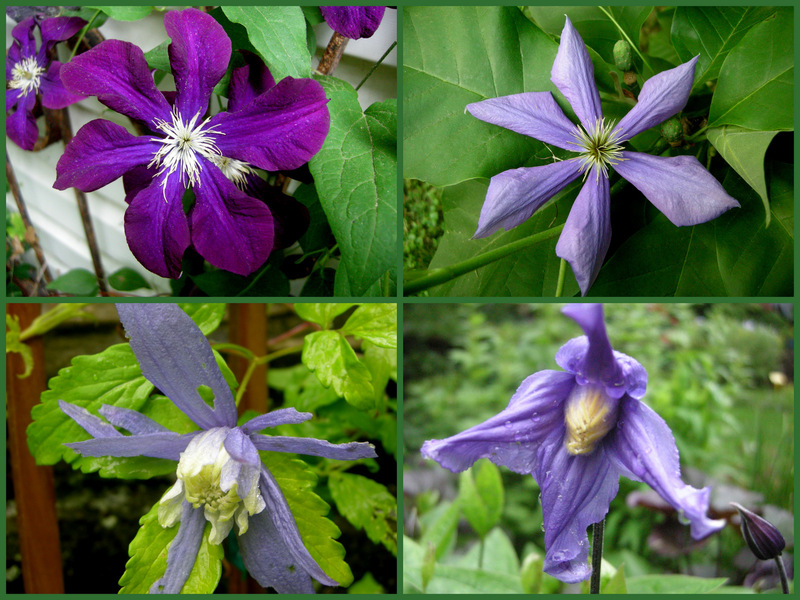 Clematis clockwise from upper left: ‘Warsaw Nike’, ‘General Sikorski’, solitary clematis (C. integrifolia, really a perennial not a vine), alpine clematis (C. alpina ‘Stolwijk Gold’). I grow ‘General Sikorski’ up through my ‘Yellow Bird’ magnolia, and I grow gold-leafed ‘Stolwijk Gold’ up the ‘General Sikorski’–you can never have too many vines. 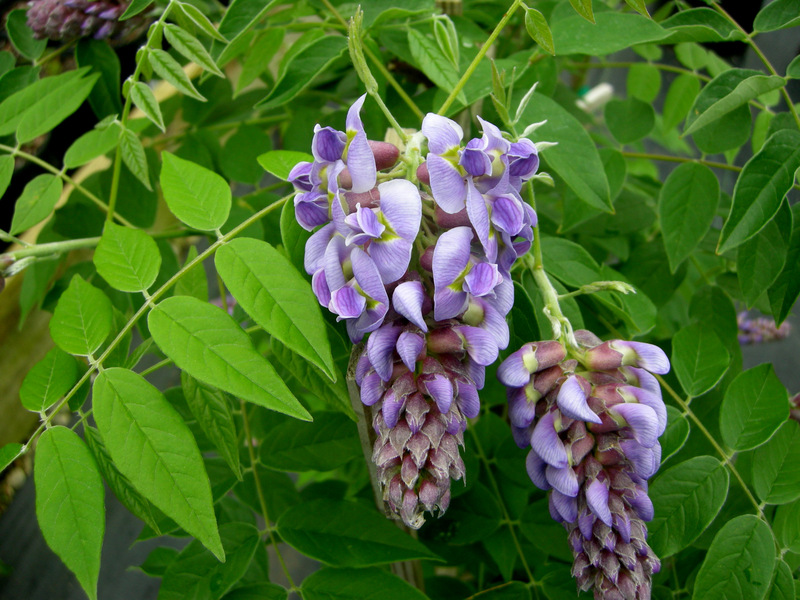 American wisteria, W. frutescens ‘Amethyst Falls’, flowers after the Asian varieties. The tightly packed flowers of ‘Amethyst Falls’ American wisteria. 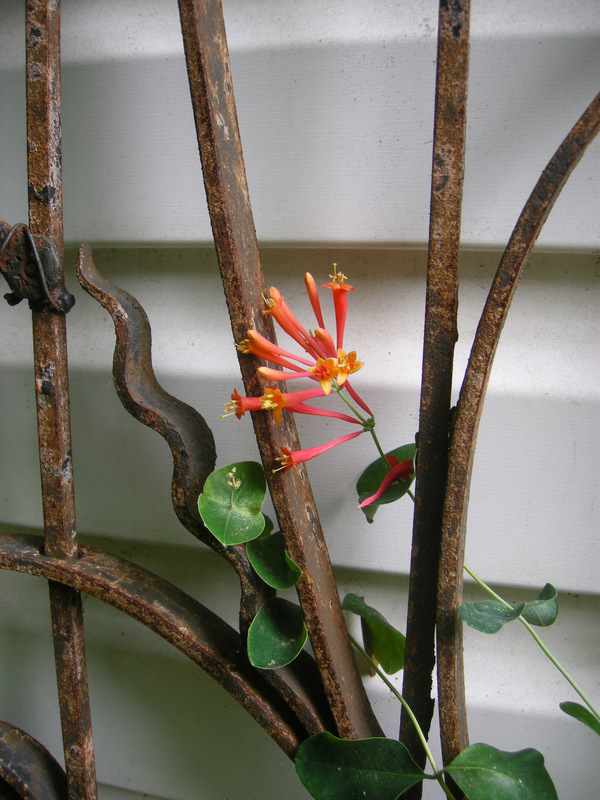 I adopted this vine as a tiny plant at a rock garden society sale. 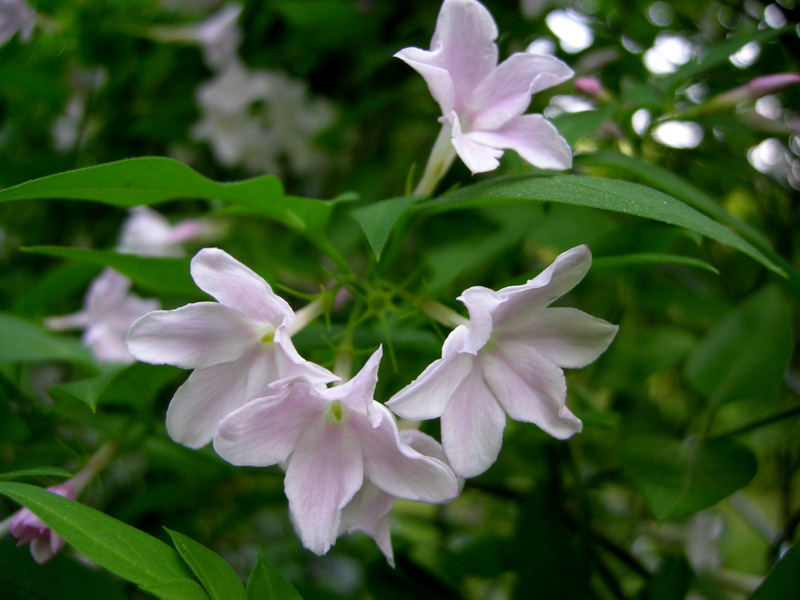 It turned out to be a rare hardy jasmine, Jasminum x stepanense. 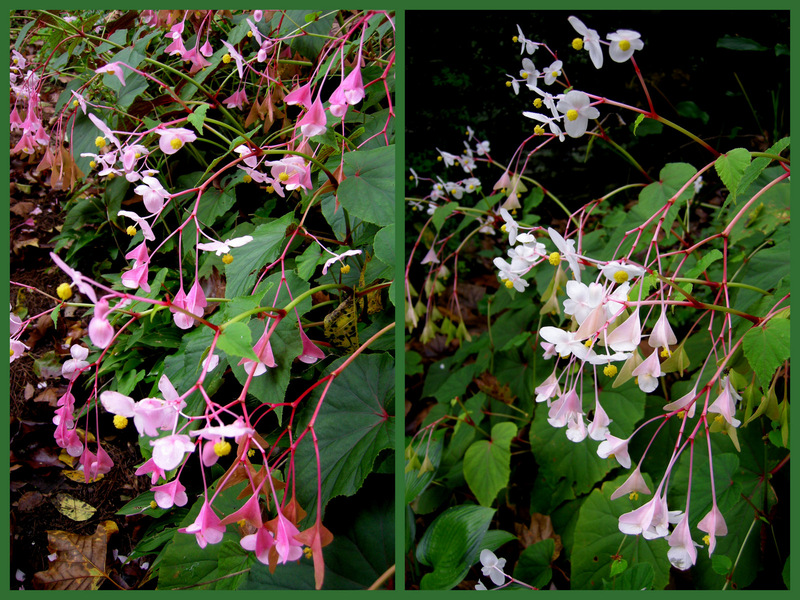 Two years later it was covered with these fragrant pale pink trumpets–what a deal! 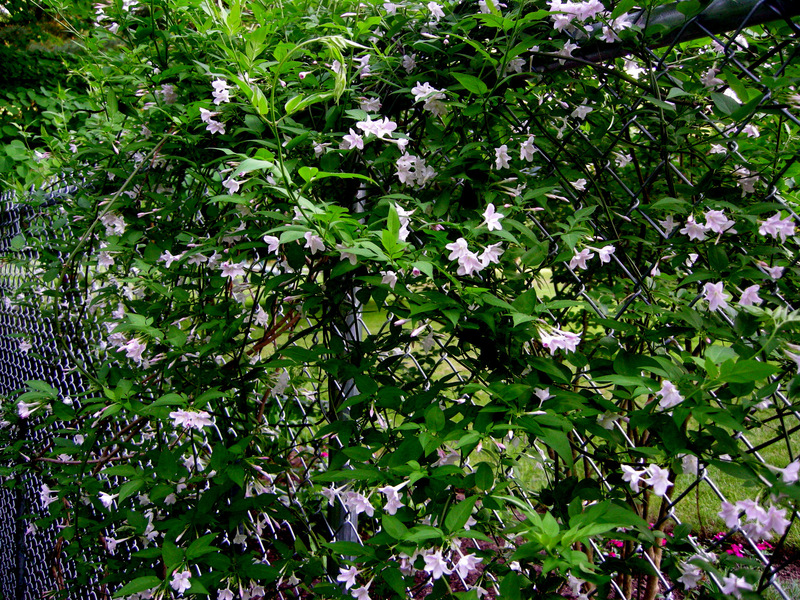 The charming flowers of hardy jasmine vine. 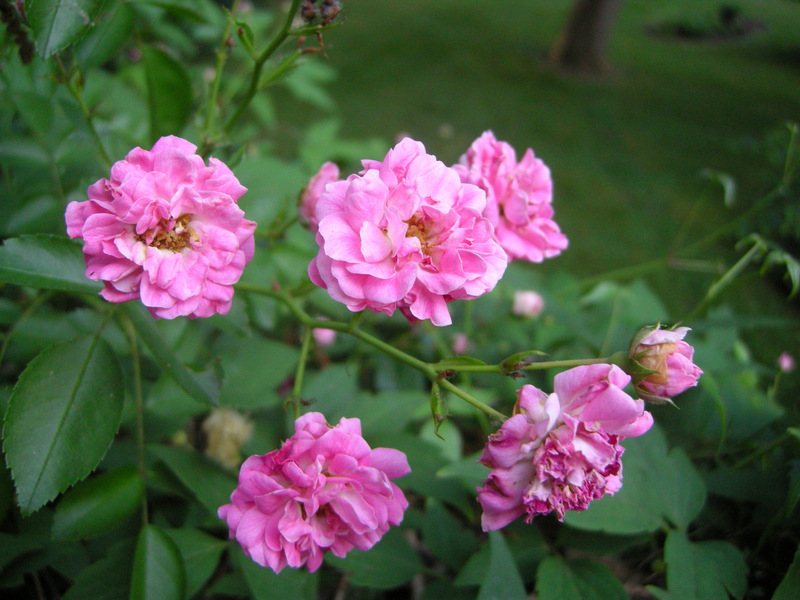 This climbing rose with a multitude of small pink flowers in bloom right now came without a name. 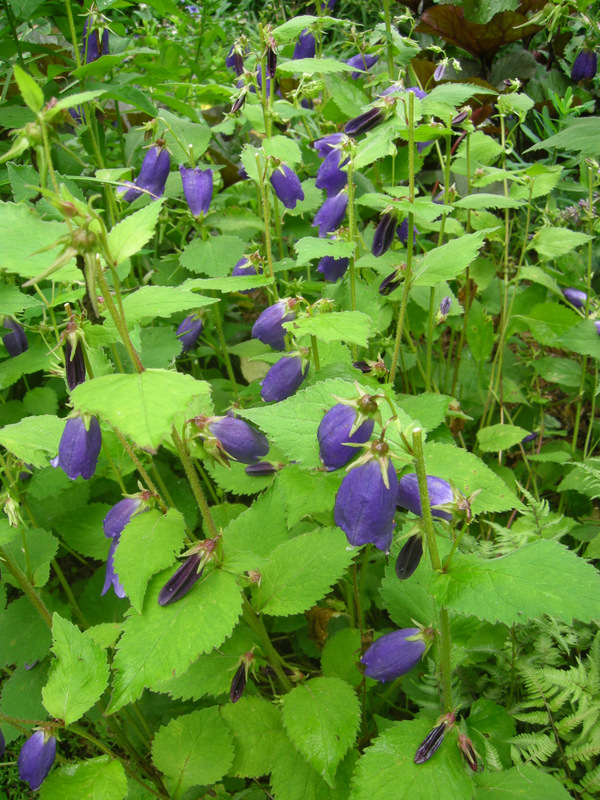 I grow it around and through my anemone clematis, C. montana var. rubens, which flowers earlier. If anyone knows the name of the rose, please let me know. Main sunny perennial border: not a full day but as sunny as it gets at Carolyn’s Shade Gardens. The shady gold garden under a 120-year -old London plane tree. 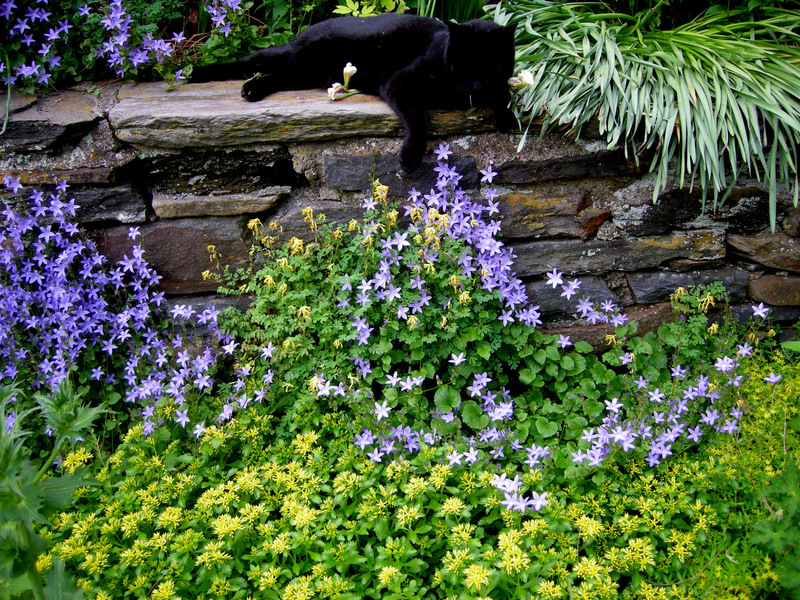 Our cat Otto enjoying the wall garden. Please let me know in a comment/reply what flowers are blooming in your spring garden. If you participated in GBBD, please provide a link so my nursery customers can read your post. Notes: Every word that appears in orange on my blog is a link that you can click for more information. If you want to return to my website’s homepage to access the sidebar information (catalogues, previous articles, etc. ), just click here. 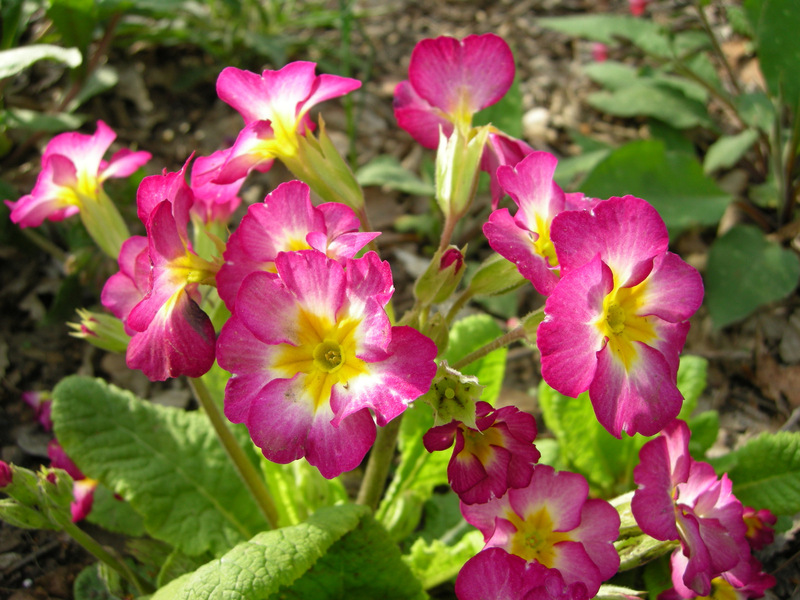 English primrose, Primula x polyantha ‘Cherry Pinwheels’, from Garden Vision Epimediums, one of my favorite nurseries. 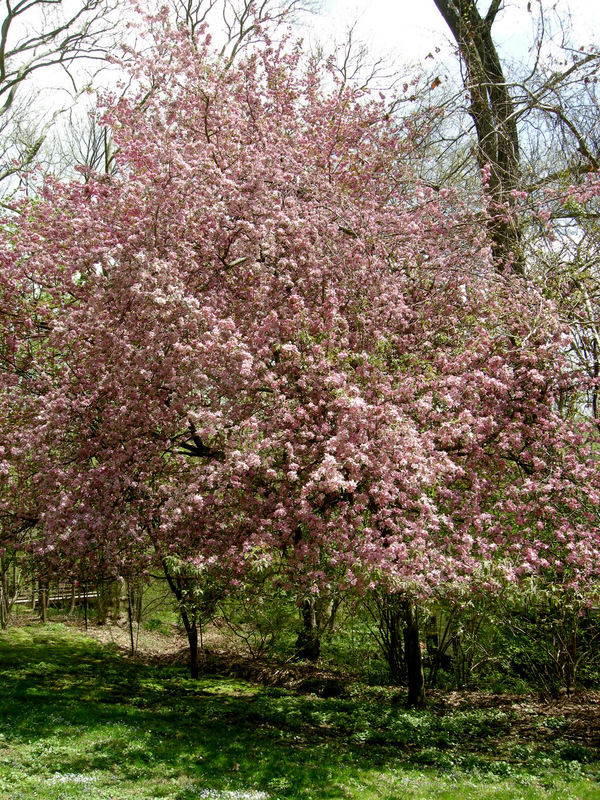 Spring is with us in all its glory, and we have reached the middle of the month when I encourage each of you to walk around your garden and assess what you need to add to make mid-spring an exciting time in your landscape. 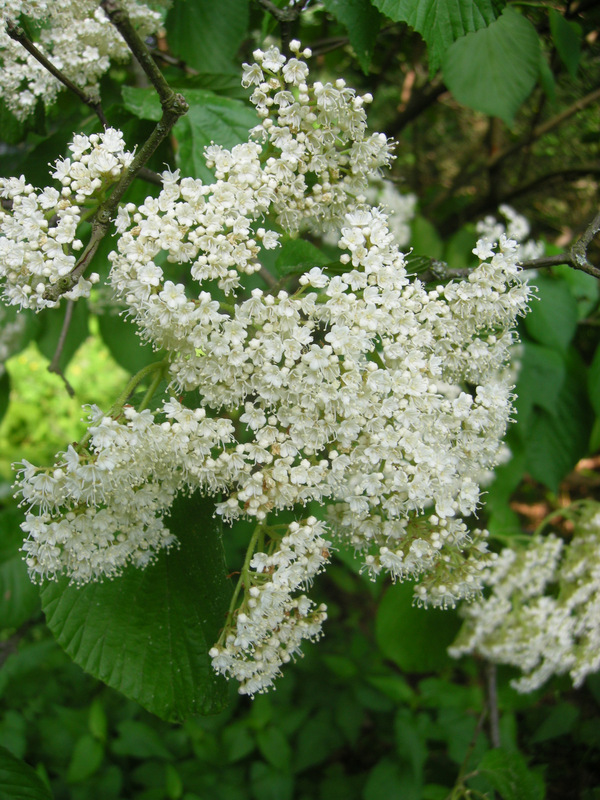 Do you need more flowering trees, shrubs, and vines to give you a reason to stroll in your garden? 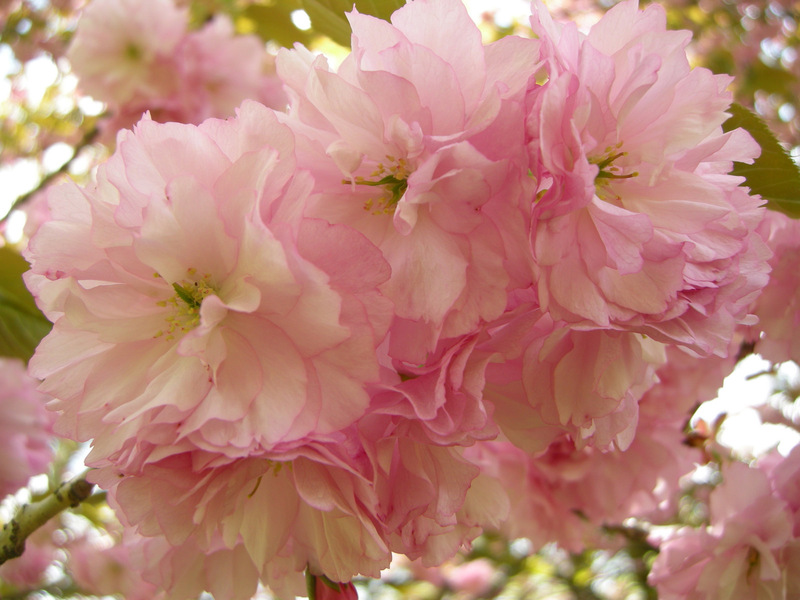 Could your garden benefit from more flowers that bloom in May? 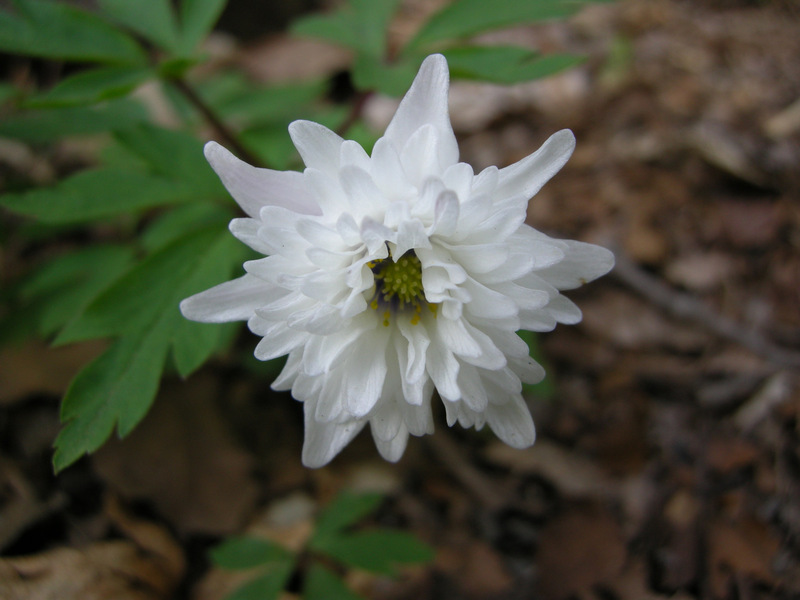 Late-blooming European wood anemone, Anemone nemorosa ‘Blue Eyes’: can you see its blue eye peeking out? Make a list and take photographs so that when you are shopping for plants you know what you need and where it should go. It’s beautiful outside, and you never know what you might find hiding in your garden like the cheerful English primrose (photo at top), which I discovered during my own inventory. 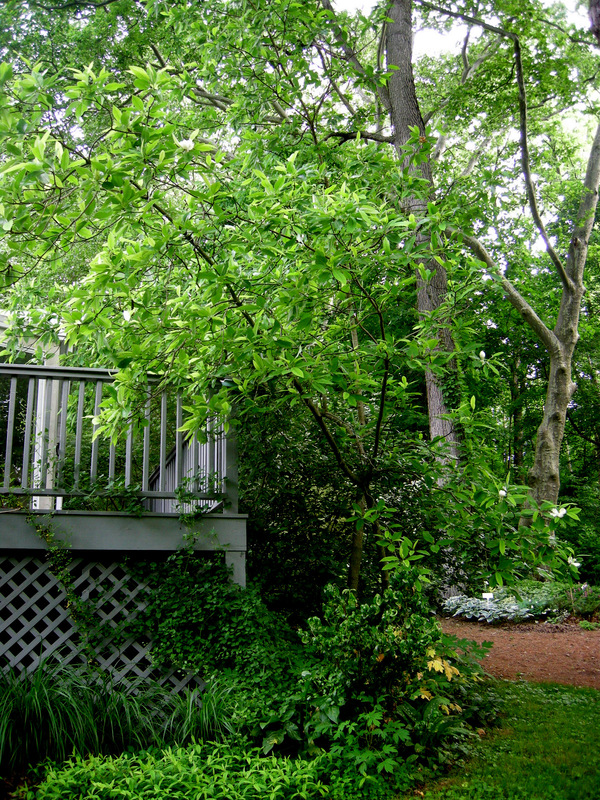 Come visit Carolyn’s Shade Gardens to find even more inspiring ideas! 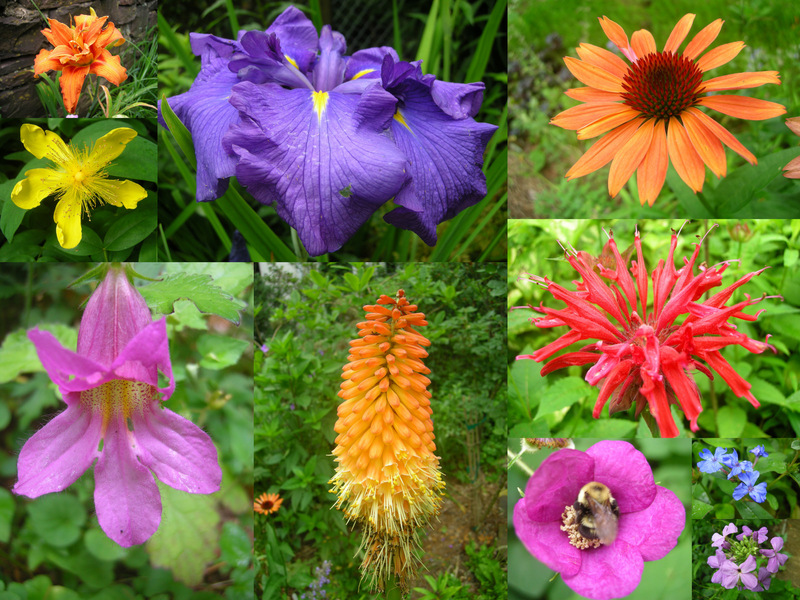 Today is Garden Blogger’s Bloom Day for May when gardeners around the world show photos of what’s blooming in their gardens (follow the link to see photographs from other garden bloggers assembled by Carol at May Dreams Gardens). 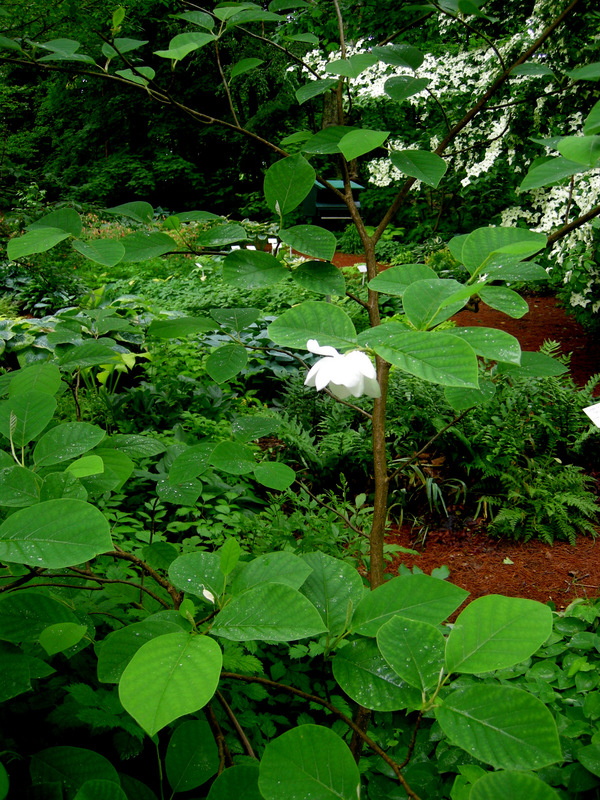 Here are some more highlights from my mid-May stroll through Carolyn’s Shade Gardens, but to see it all you will have to visit. Japanese roof iris, Iris tectorum, in my gold garden. 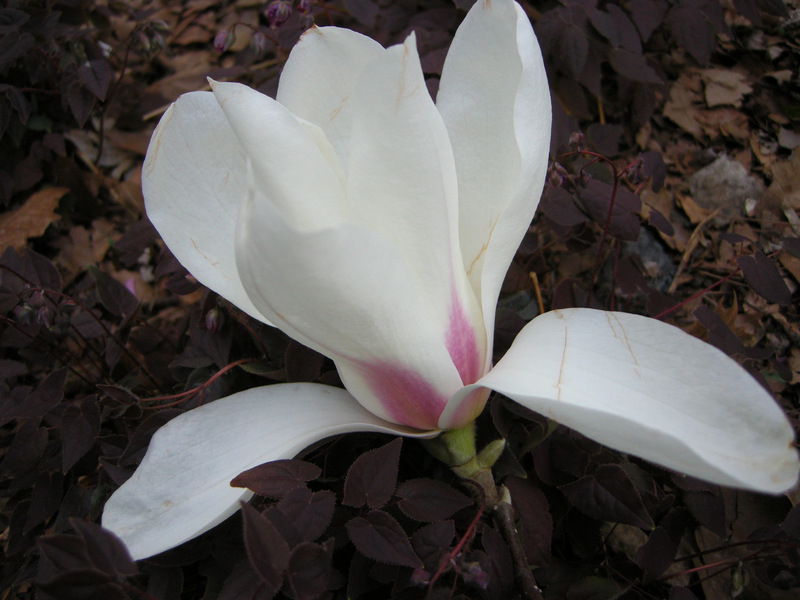 Saucer magnolia, Magnolia x soulanginana: this magnolia was done blooming in the beginning of May, but magnolias are my favorite tree so I had to include it! 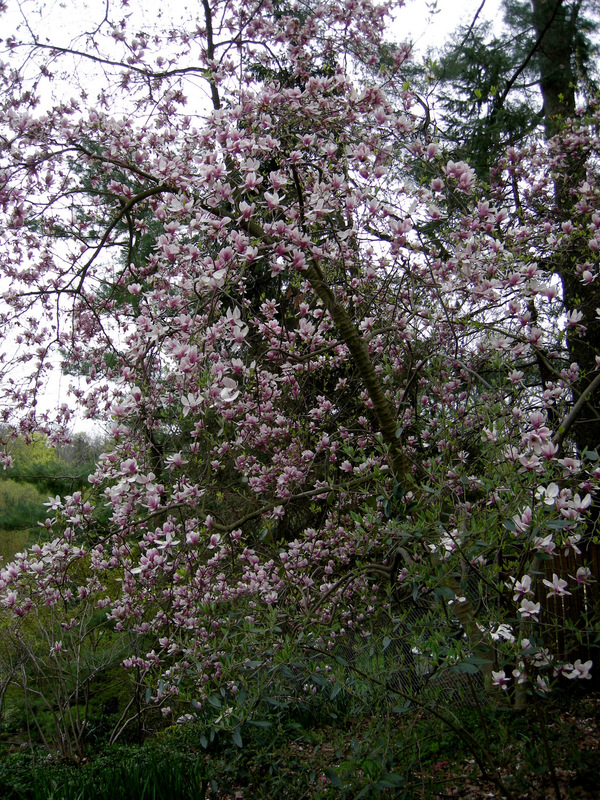 Ornamental crabapple, Malus species: this is my only ornamental crabapple and was here when we moved in so I am not sure of the variety. 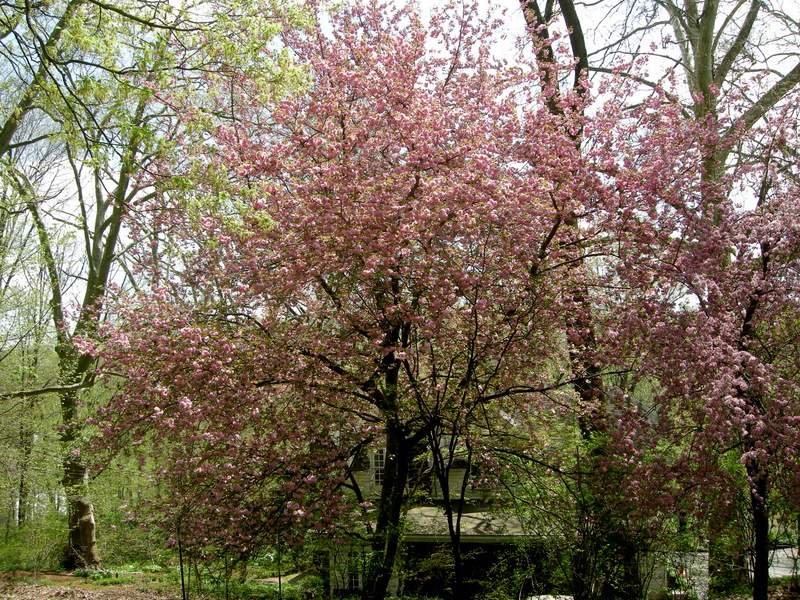 Kwanzan cherry, Prunus serrulata ‘Kwanzan’: also here when we moved in. Native Carolina silverbell, Halesia caroliniana ‘Rosea’: a beautiful small flowering tree with amazing orange-streaked bark. 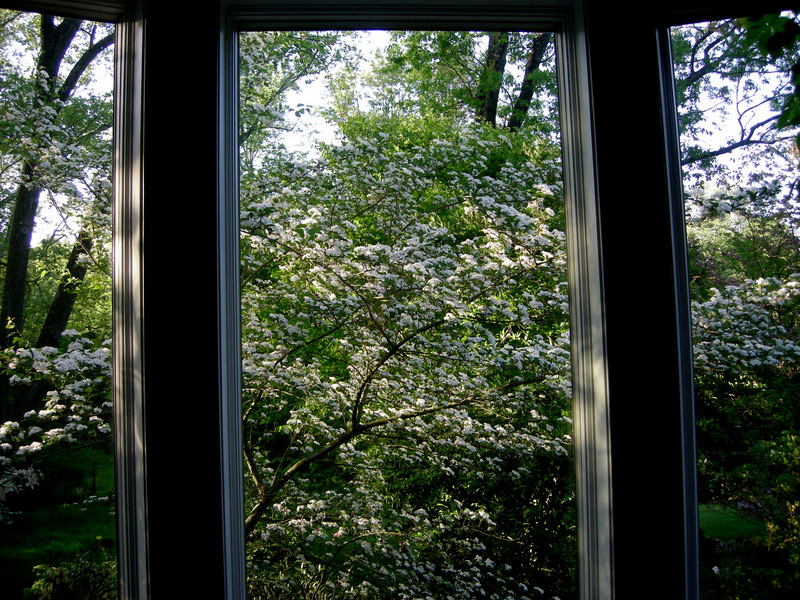 Native green hawthorn, Crataegus viridis ‘Winter King’: I thought it would be fun to see what this tree looks like from inside our house. 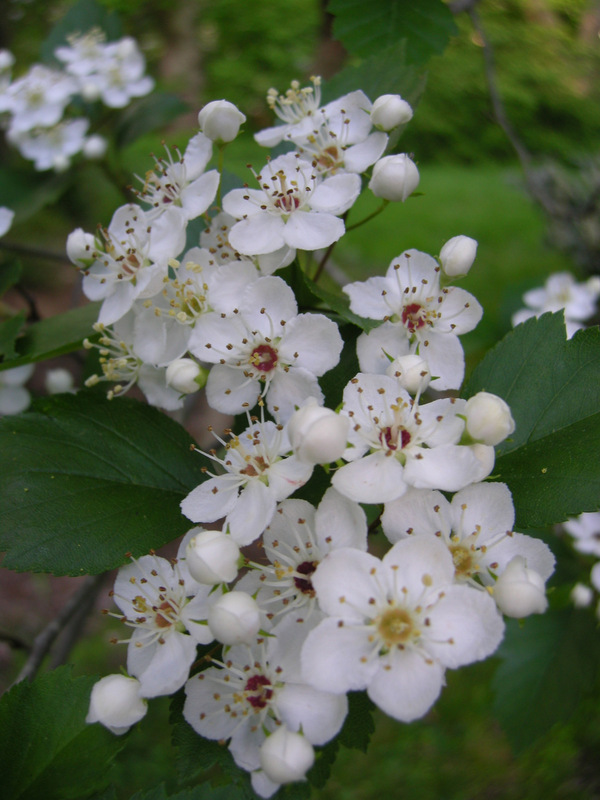 Flower of ‘Winter King’ hawthorn: it also has beautiful red berries. 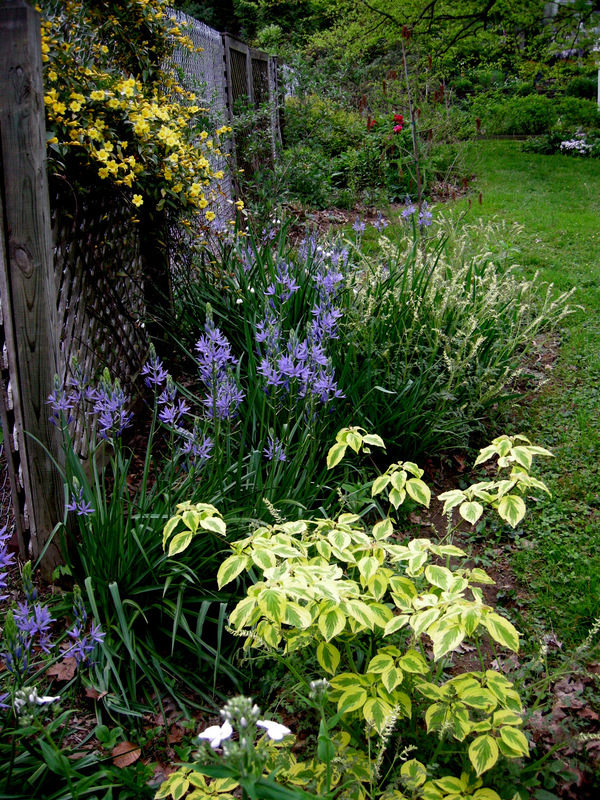 Native pagoda dogwood, Cornus alternifolia ‘Golden Shadows’, with native vine Carolina jessamine, Gelsemium sempervirens ‘Margarita’, and native (to the U.S.) camassia, Camassia leichtlinii ‘Caerulea’. 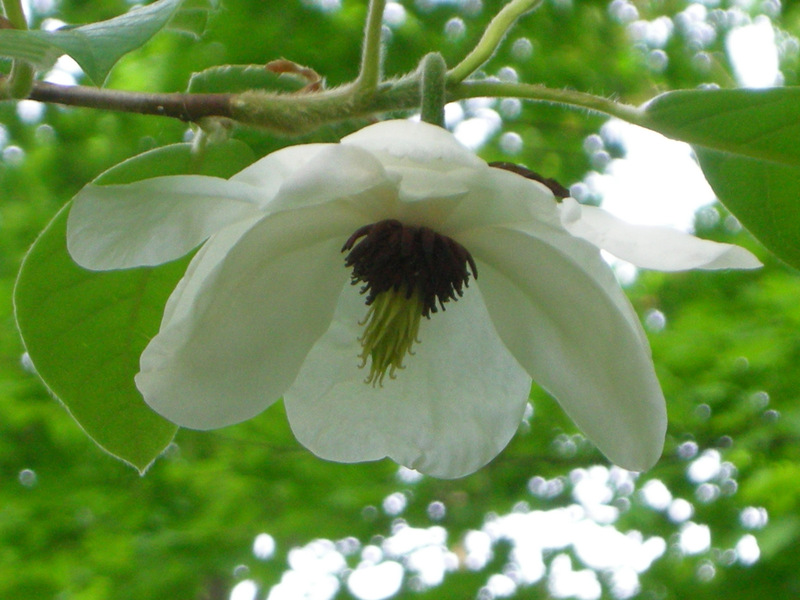 Wilson’s magnolia, Magnolia wilsonii: a real favorite because it grows and flowers in the shade. I can’t show you the whole tree because a London plane tree branch fell on it and destroyed its shape. 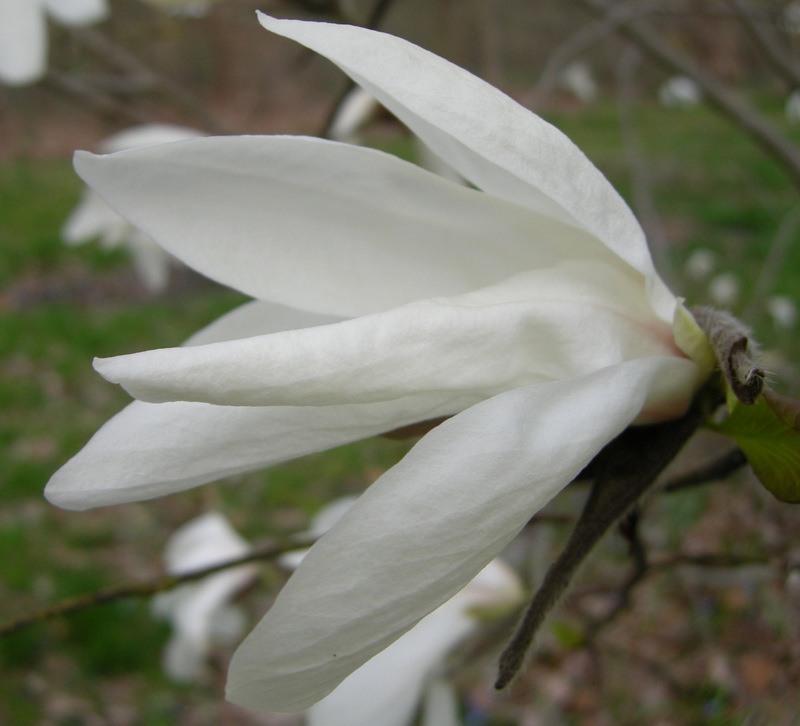 Oyama magnolia, Magnolia sieboldii, has flowers similar to M. wilsonii but does not tolerate as much shade and blooms later. Both trees should be planted so that you can view the flowers from below. 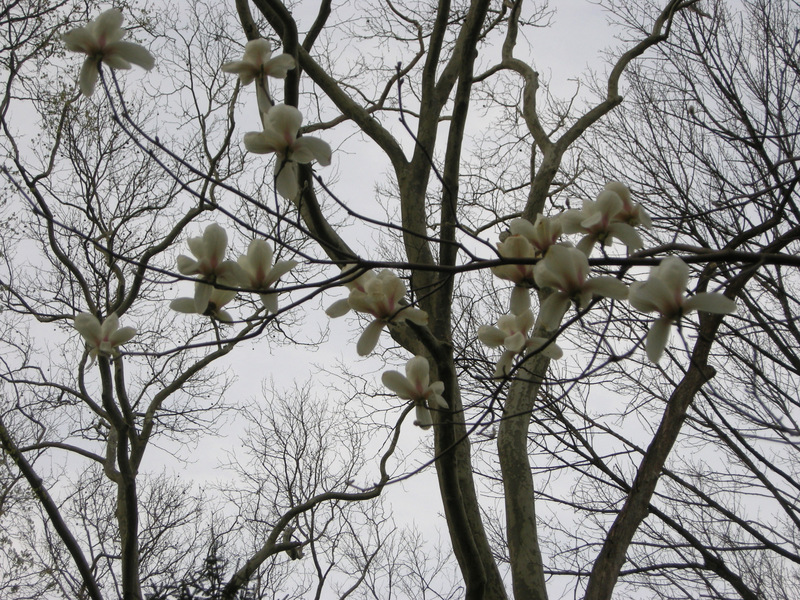 I love the buds of both these magnolias: they look like eggs hanging on the tree. 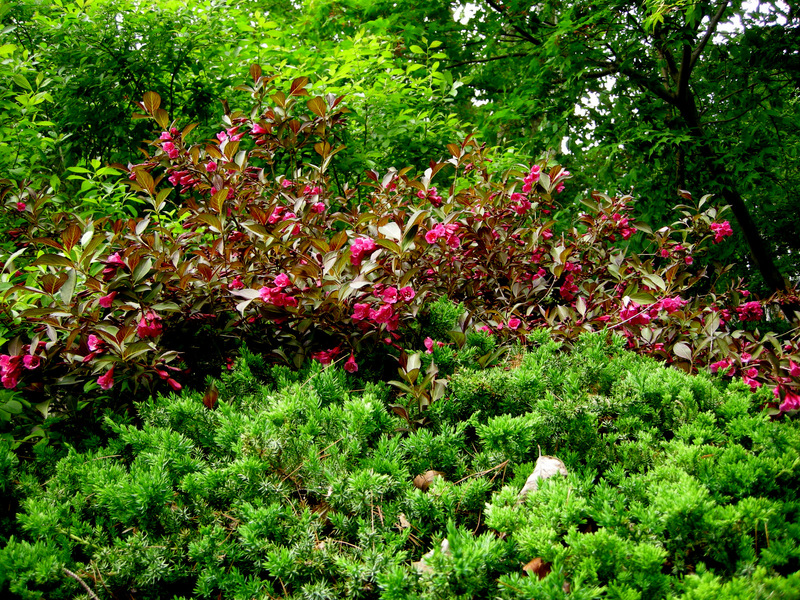 Are you ready for a few shrubs? 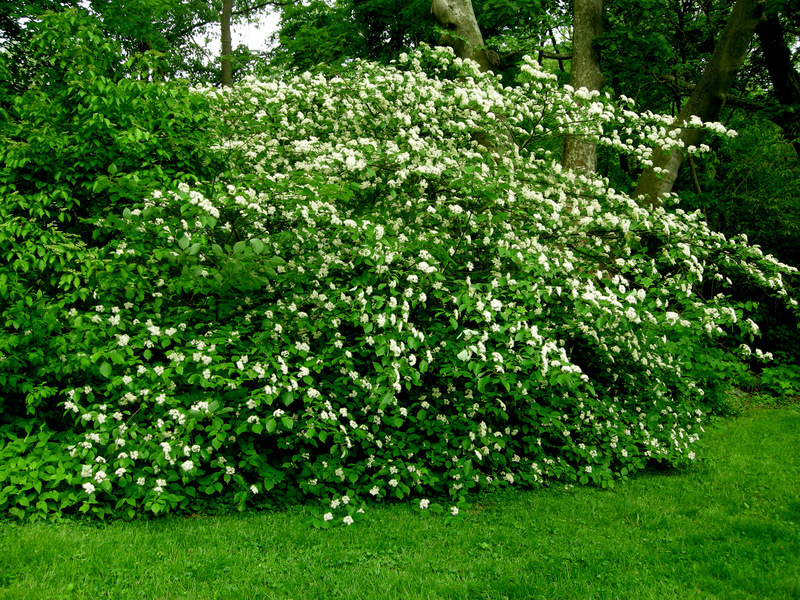 This is the biggest doublefile viburnum, Viburnum plicatum var. tomentosum, I have ever seen, and it started as a 3″ sprig. 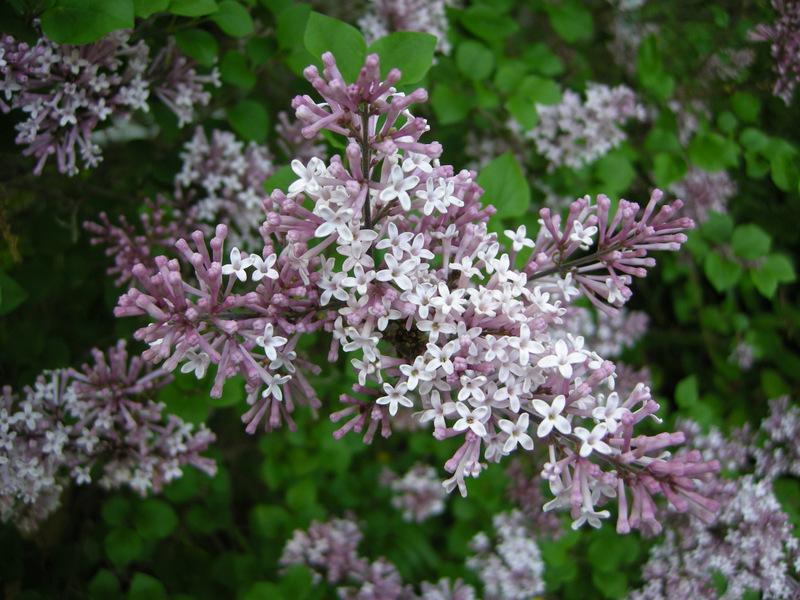 Dwarf Korean lilac, Syringa meyeri ‘Palibin’, with ‘Winter King’ hawthorn in the background. 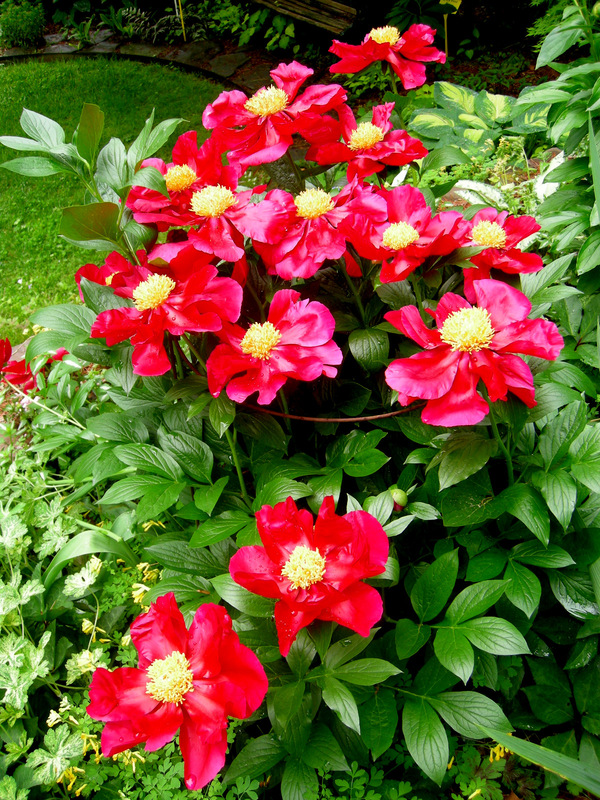 Tree peonies, Paeonia suffruticosa, take more shade than herbaceous peonies. These plants did not come with names other than the color. 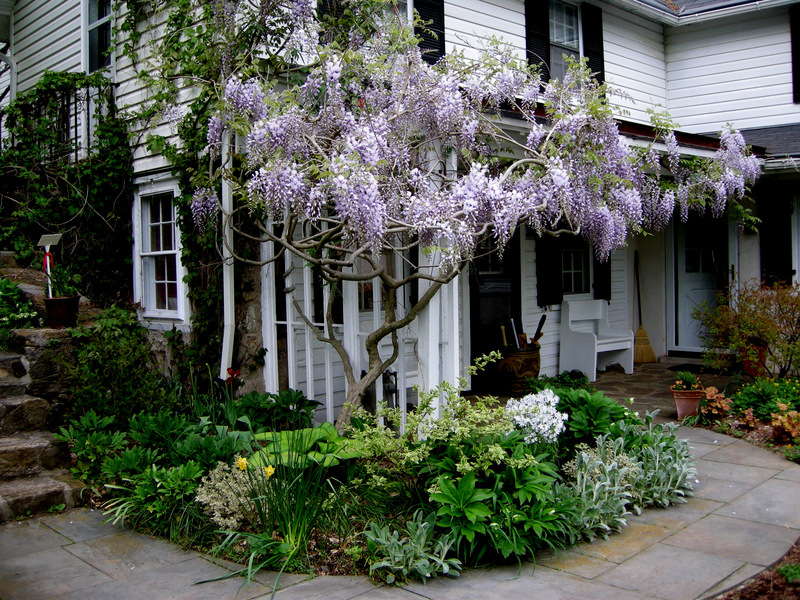 My husband’s dedication to training this Chinese wisteria, Wisteria sinensis, across our front porch has really paid off. 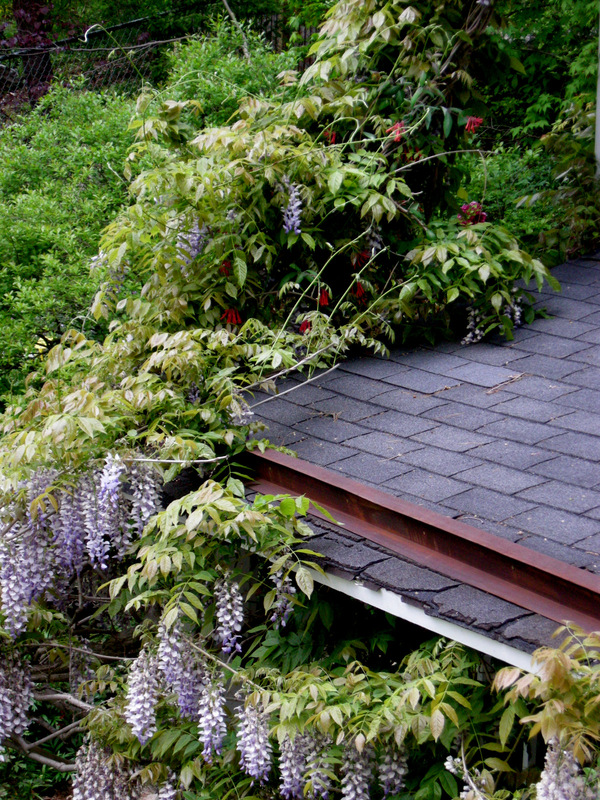 I have a native wisteria too, but it isn’t in bloom yet. 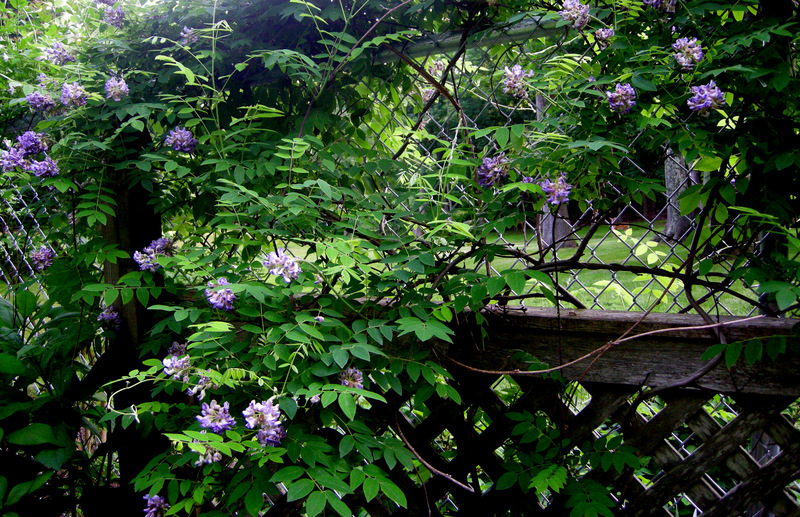 We grow the Chinese wisteria entwined with native honeysuckle, Lonicera sempervirens ‘Blanch Sandman’, and they both reach the second story. This photo is for Tina at In the Garden who also has this combination. 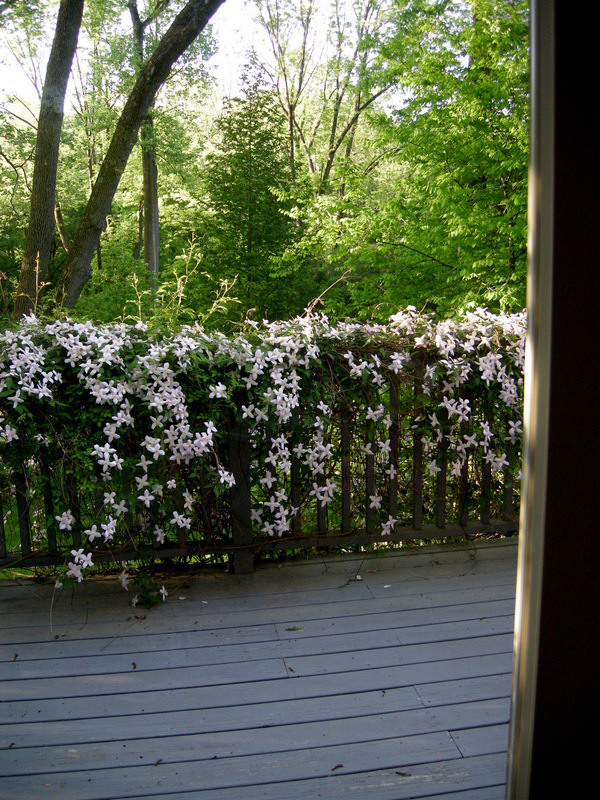 The view out our dining room window of the pink anemone clematis, Clematis montana var. rubens, growing on the deck railing. 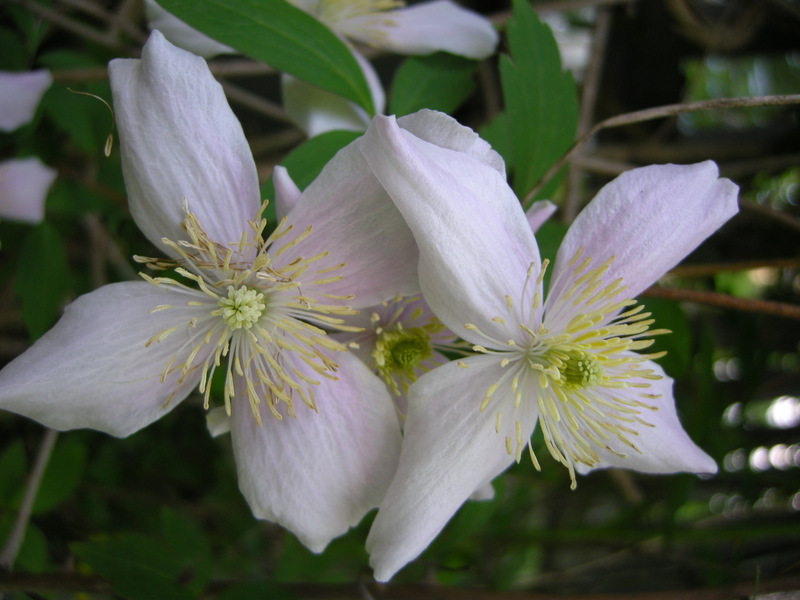 This is a very vigorous and long-blooming clematis that does well in part shade. 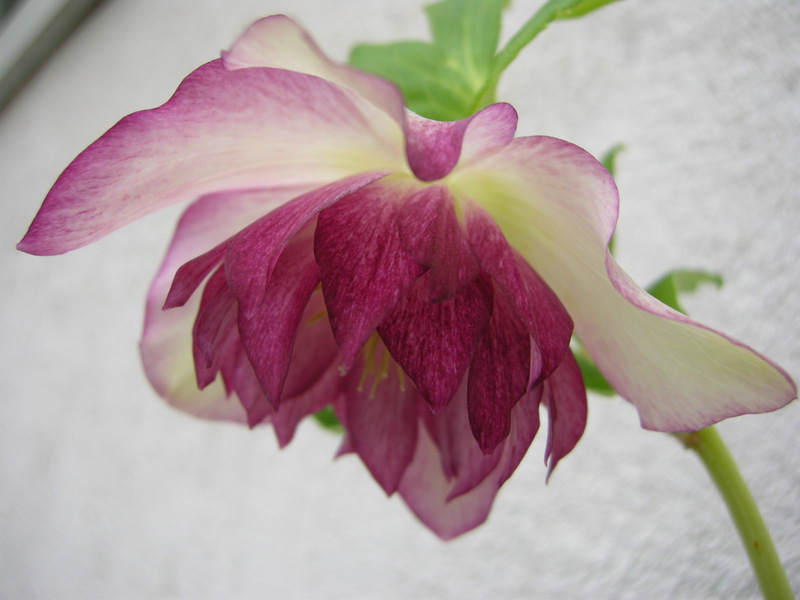 The flowers of pink anemone clematis start out pale pink (above) and deepen in color as they age. 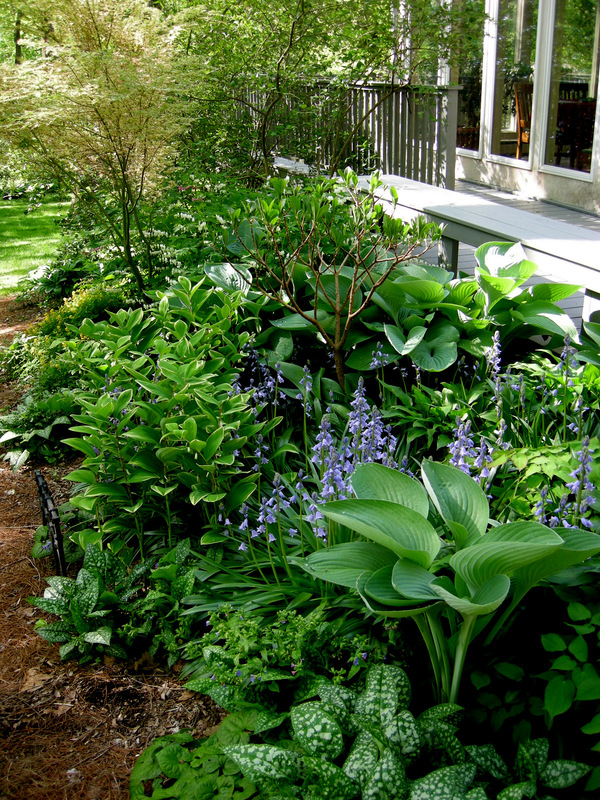 The garden surrounding our deck with Spanish bluebells, Scilla campanulata ‘Excelsior’, variegated Solomon’s seal, Polygonatum odoratum ‘Variegatum’, and white old-fashioned bleeding-heart, Dicentra spectabilis ‘Alba’, in bloom. The view from upstairs of our main perennial border by the front door. 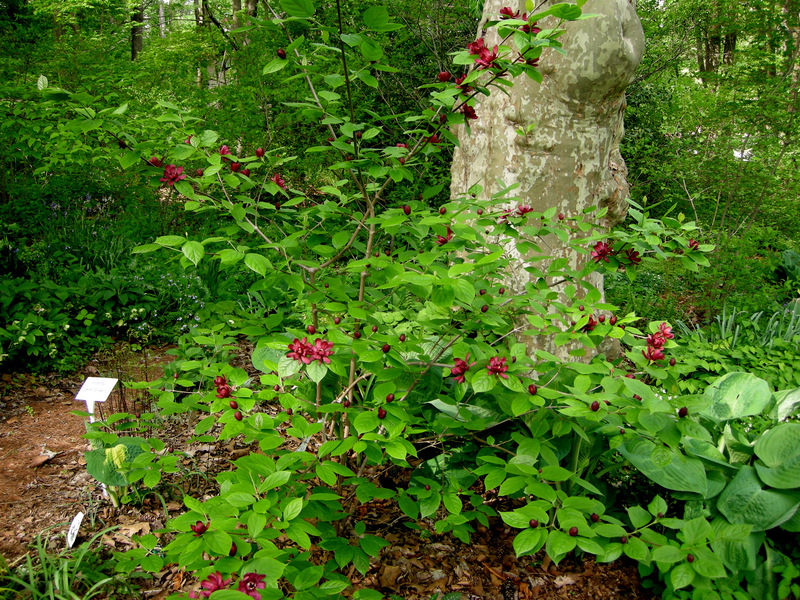 The woodland garden in mid-May with native hybrid sweetshrub, Calycanthus raulstonii ‘Hartlage Wine’ in bloom in the upper left. This post is dedicated to my husband, Michael, who plants most of the plants and does all the dirty jobs at Carolyn’s Shade Gardens. 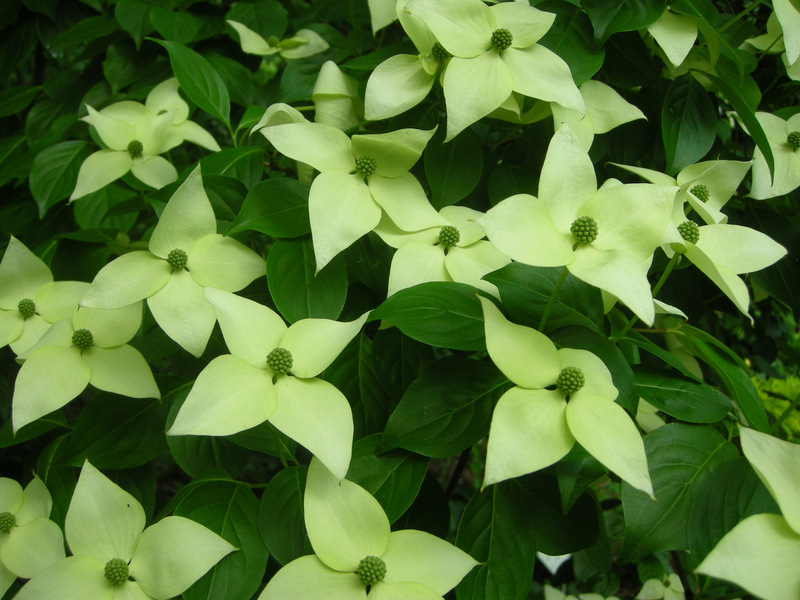 Nursery Happenings: We expect to have our traditional open hours over Memorial Day Weekend, but remember you can make an appointment to shop 24/7 by sending me an email at carolynsshadegardens@verizon.net. Saturday was one of my best open houses ever (thanks to everyone who came), but there is still a great selection of hostas, ferns, and hardy geraniums. 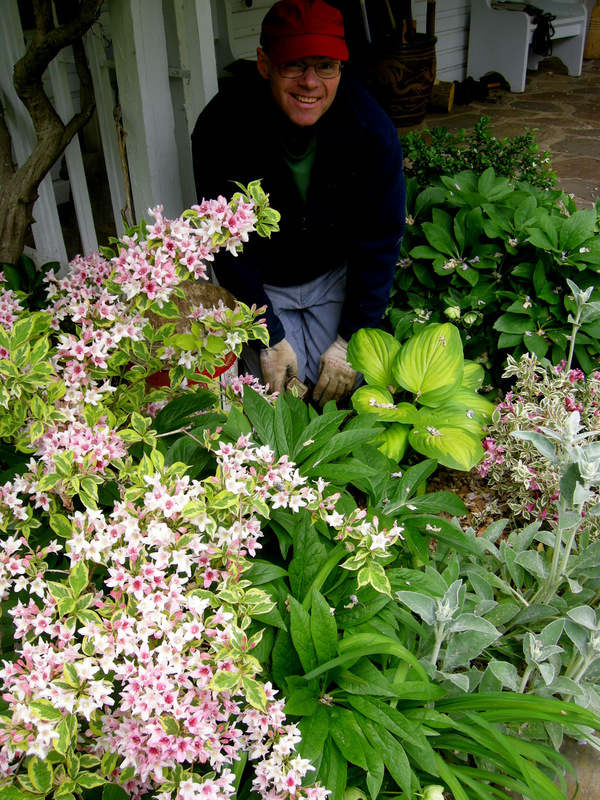 Time is just flying by, and we have reached the middle of the month when I encourage each of you to walk around your garden and assess what you need to add to make early spring an exciting time in your landscape. 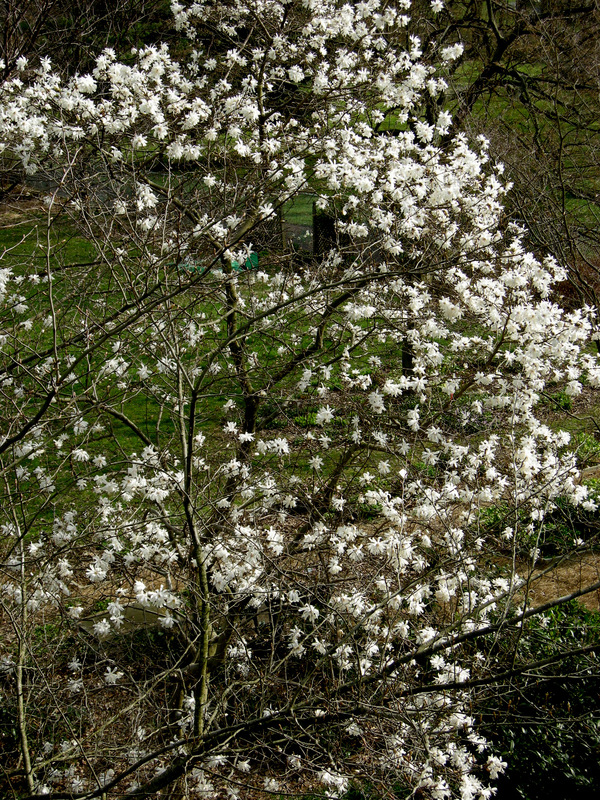 Do you need more early flowering trees like magnolias and cherries to give you a reason to stroll in your garden? 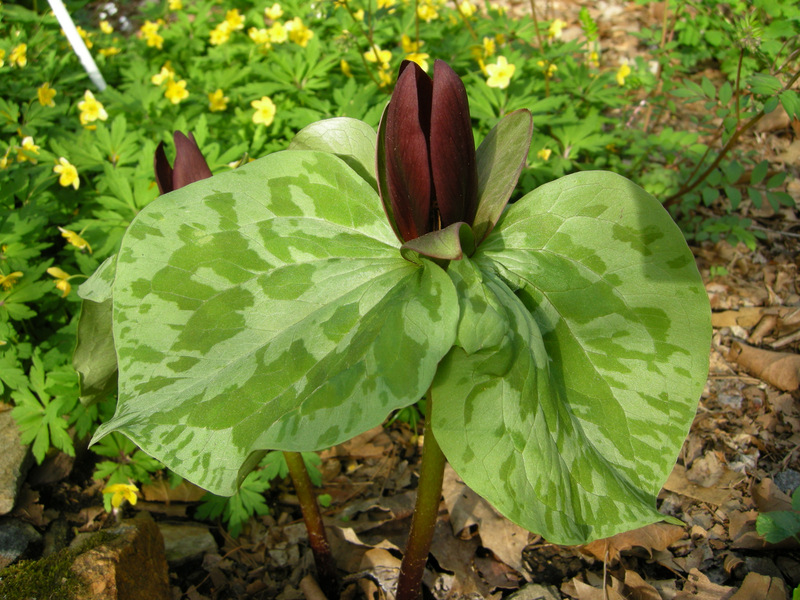 Could your garden benefit from flowers that bloom in early April like native spring ephemerals, bulbs, pulmonarias, and hellebores? Make a list and take photographs so that when you are shopping this spring you know what you need and where it should go. 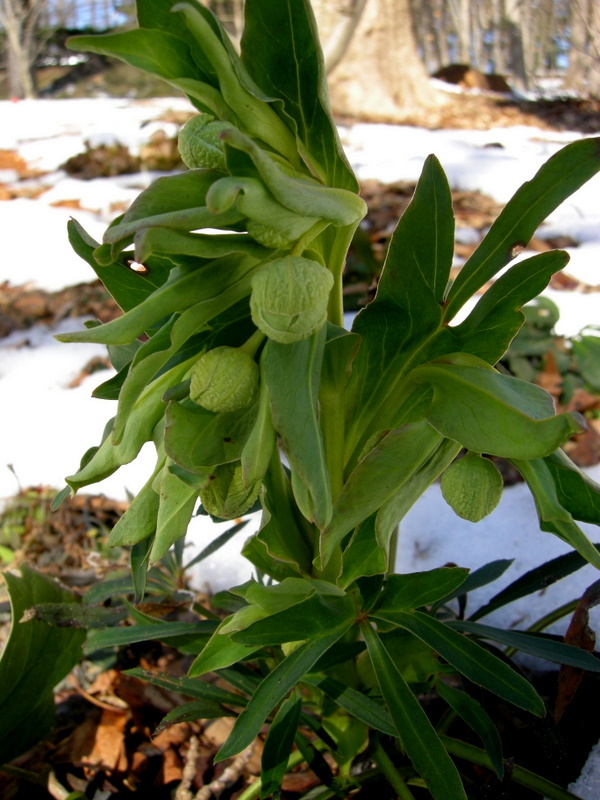 It’s beautiful outside, and you never know what you might find hiding in your garden like this ethereal double-flowered hellebore (pictured above), which I discovered during my own inventory. Usually I recommend a local garden to visit for inspiration, but I have to say Carolyn’s Shade Gardens is pretty inspiring right now! 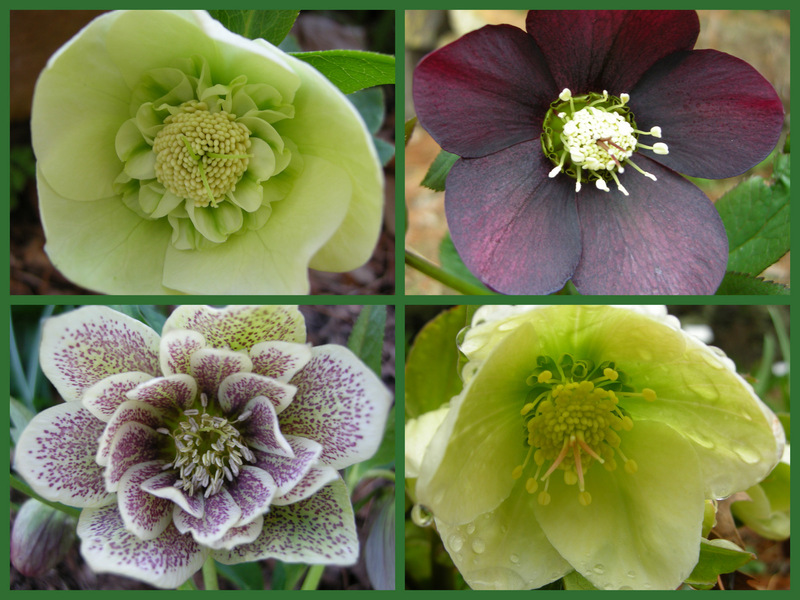 Today is Garden Blogger’s Bloom Day for April when gardeners around the world show photos of what’s blooming in their gardens (follow the link to see photographs from other garden bloggers assembled by Carol at May Dreams Gardens). 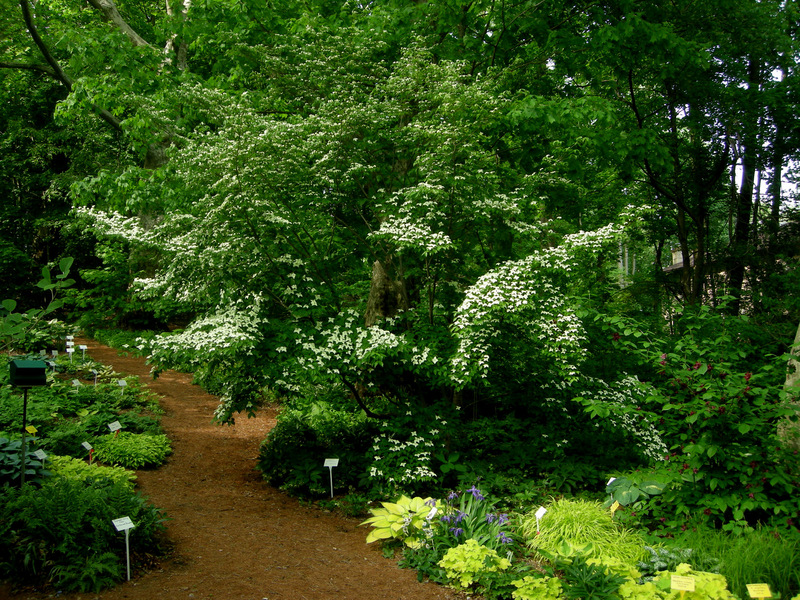 Here are some more highlights from my mid-April stroll through Carolyn’s Shade Gardens, but to see it all you will have to visit as Jean from Jean’s Garden and Jan from Thanks for Today are doing this Sunday. 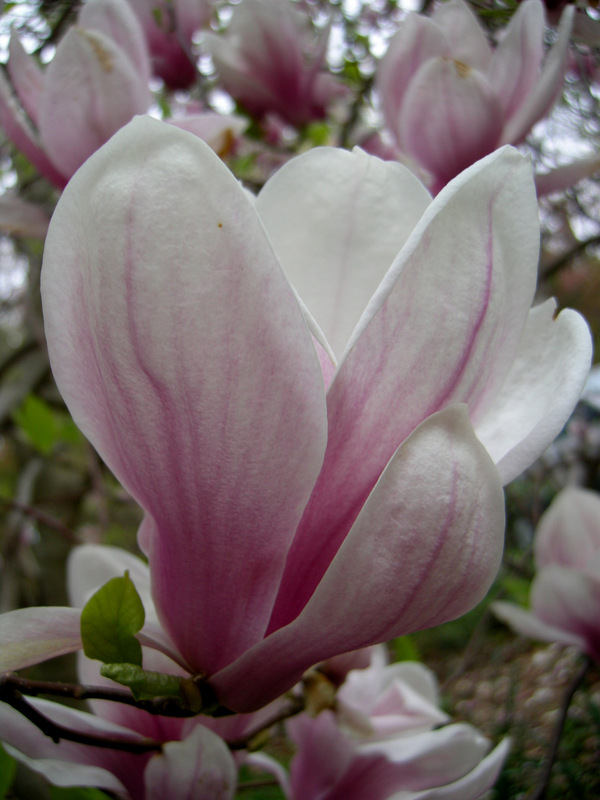 Northern Japanese Magnolia, Magnolia kobus ‘Wada’s Memory’, has the most beautiful form of any magnolia. The branches curve upwards to form an elongated pyramid, which is maintained even on mature plants. 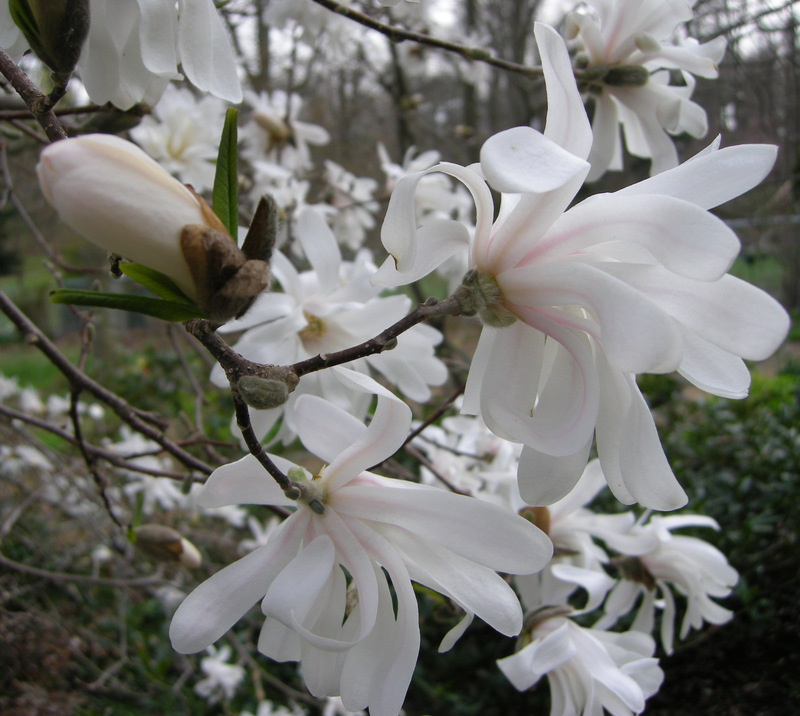 Star magnolia, Magnolia stellata, blooms so early that it often gets damaged by frost, but amazingly the flowers are magnificent this year. 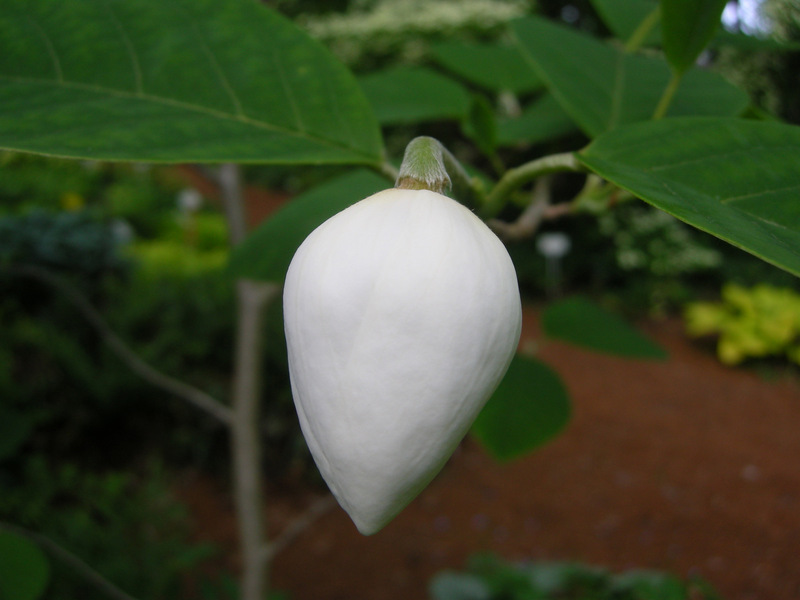 I have waited over 15 years for my Yulan magnolia, Magnolia denudata, to bloom, but once I saw mature trees at Longwood Gardens, I had to have one! It was worth the wait. 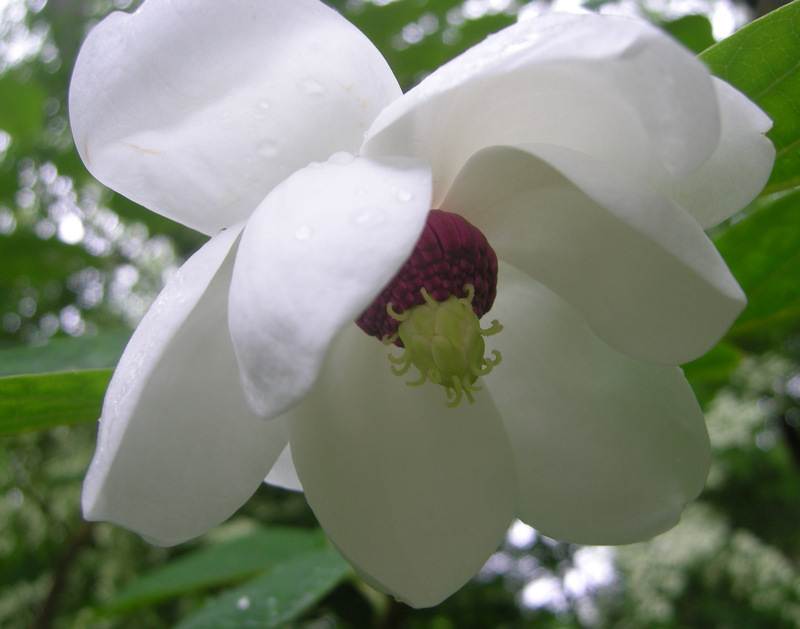 My ingenious 13-year-old son used a grappling hook to pull a branch down and clip a Yulan magnolia flower for me to photograph. 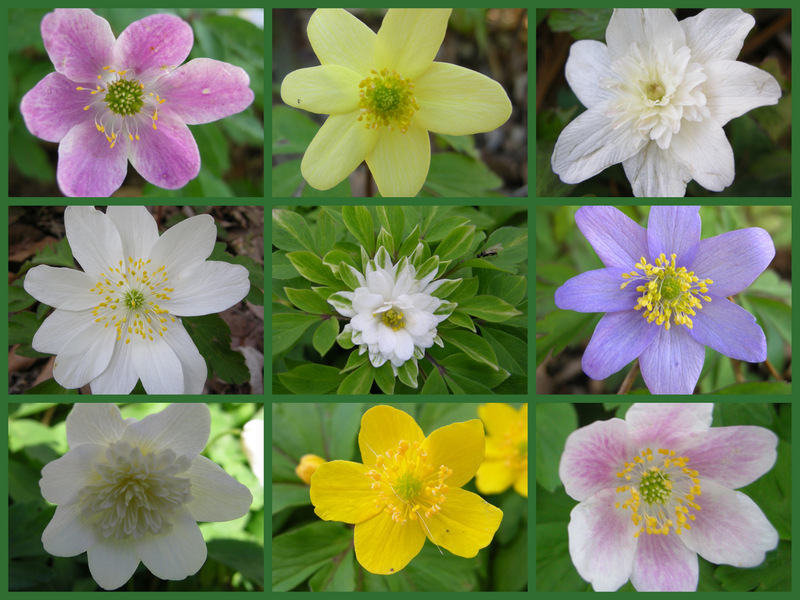 European wood anemones spread to form a sizable and eye-catching patch even in dry shade, photo above of the yellow flowers of Anemone ranunculoides. 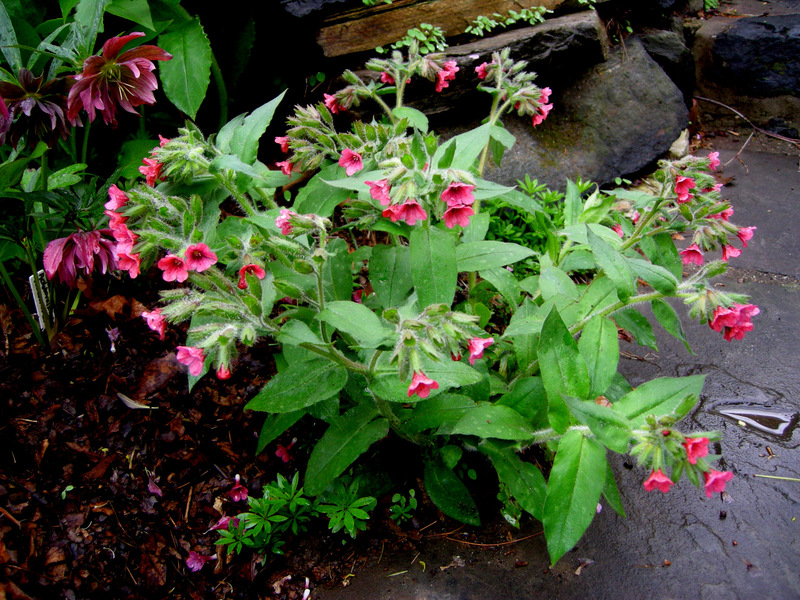 Red lungwort, Pulmonaria rubra ‘Redstart’, is a very unusual pulmonaria with green fuzzy leaves. 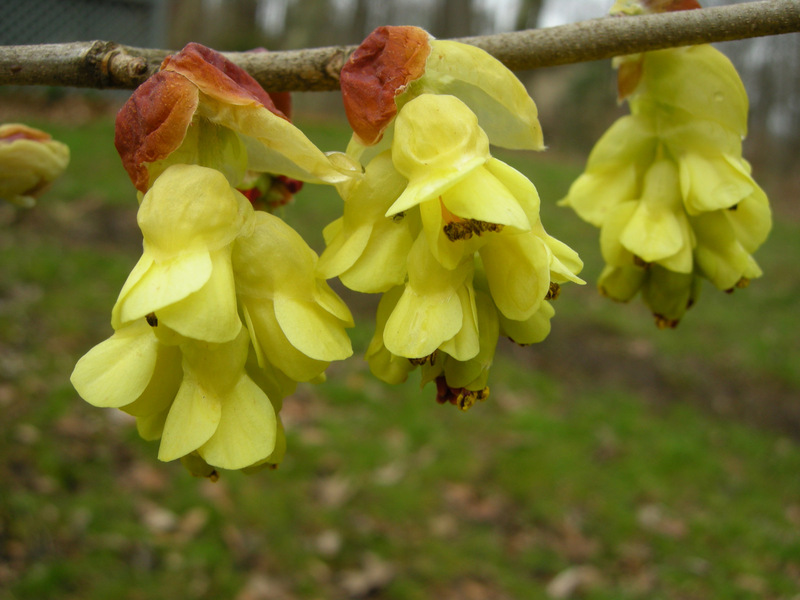 Winterhazel, Corylopsis species, unfortunately for the first time ever our late freezes damaged most of the flowers. Obviously not a bloom, but I wanted to show you the early color of native variegated dwarf Jacob’s ladder, Polemonium reptans ‘Stairway to Heaven’. 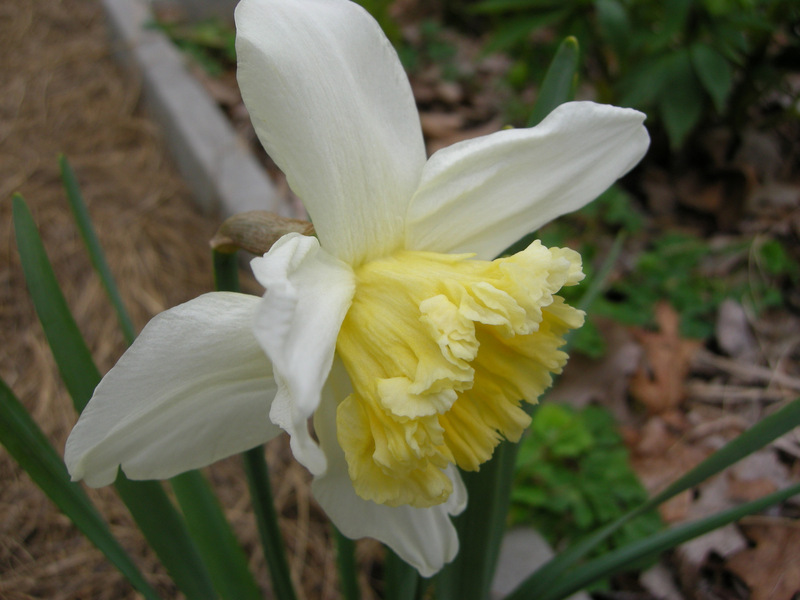 I planted a mixture of daffodils in the middle of my raised beds, and this lovely seedling appeared in the path. 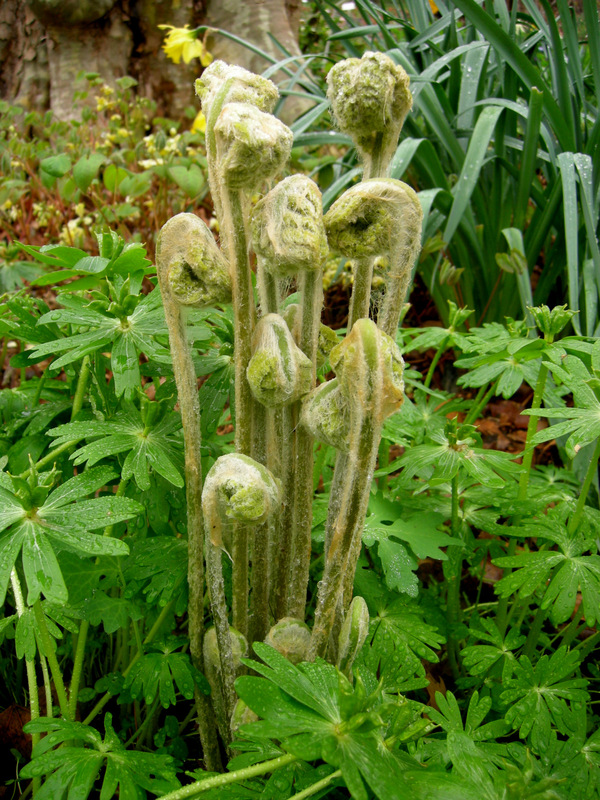 Native cinnamon fern, Osmunda cinnamomea, is gorgeous as it unfurls. 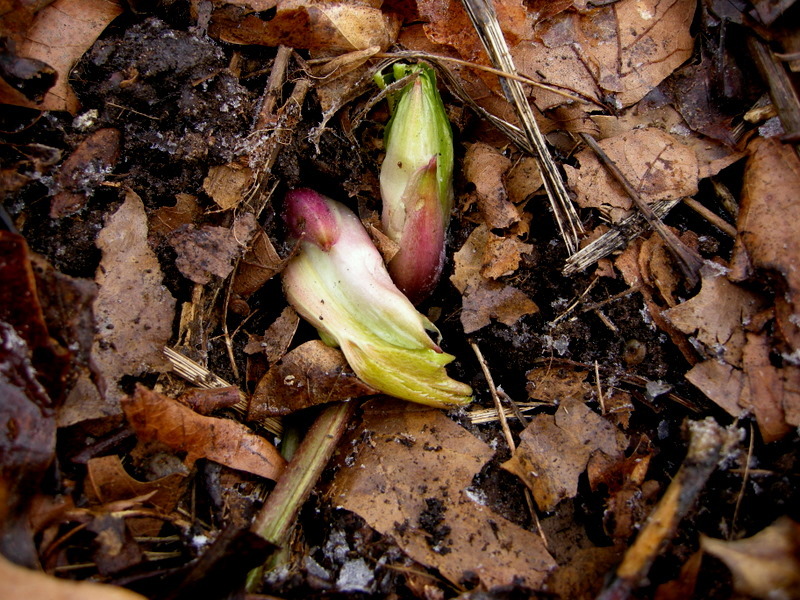 A seedling Helleborus multifidus underplanted with the spring ephemeral Cardamine quinquefolia. 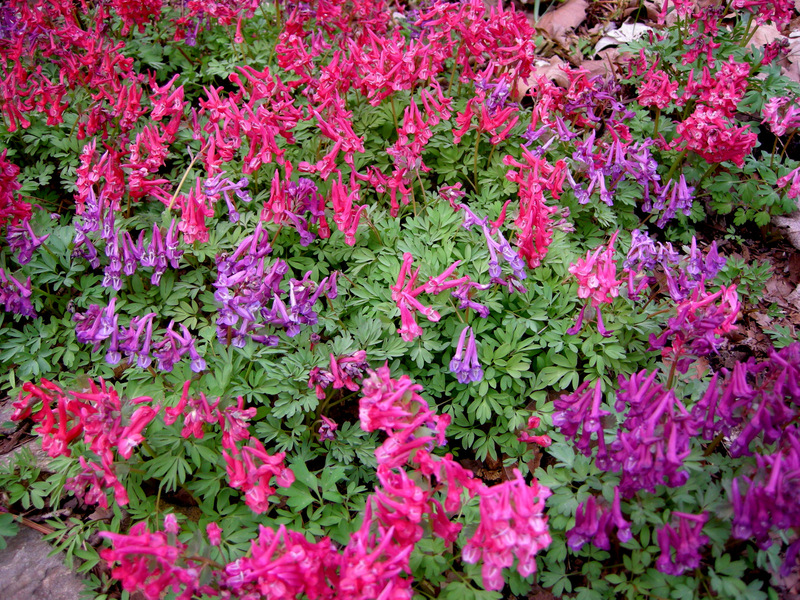 The many colors of Corydalis solida when allowed to seed. 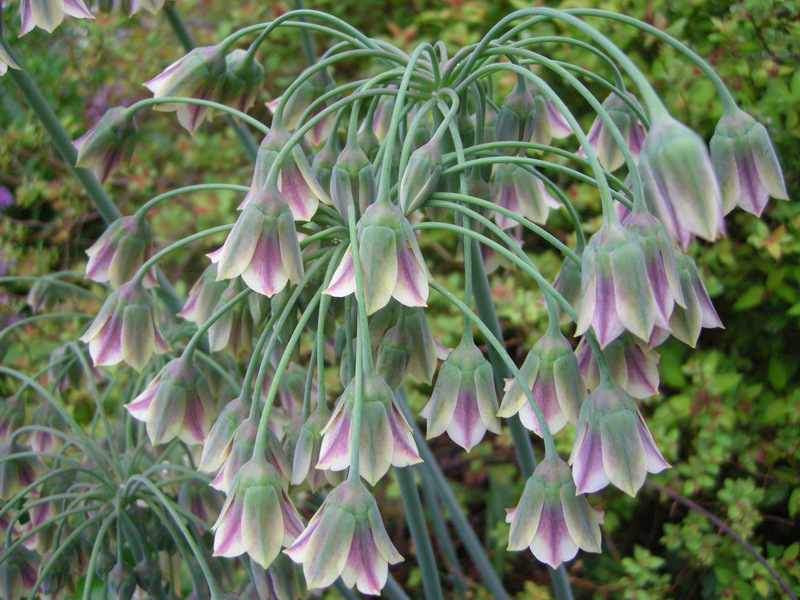 I am planning an article on this plant in the future. Who could have planned this combination? 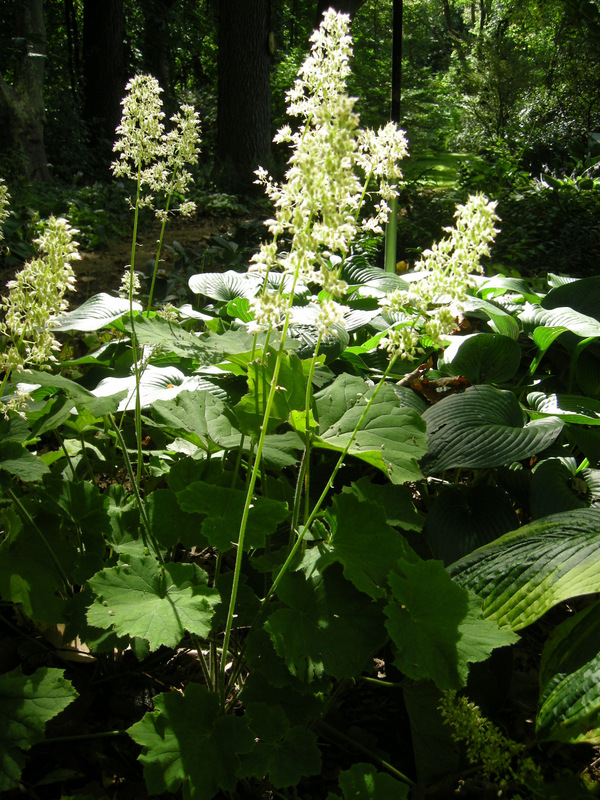 Native coral bells, Heuchera villosa ‘Caramel’, with a seedling glory-of-the-snow, Chionodoxa forbesii. 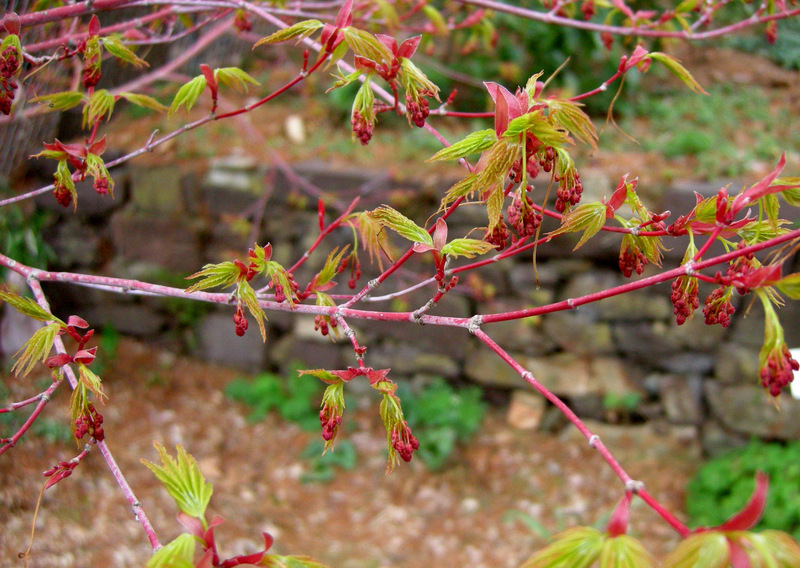 The new leaves and flowers of Japanese coral bark maple, Acer palmatum ‘Sango-kaku’, are breathtaking in early spring. For the full story on this four season tree, read my article Coral Bark Maple. 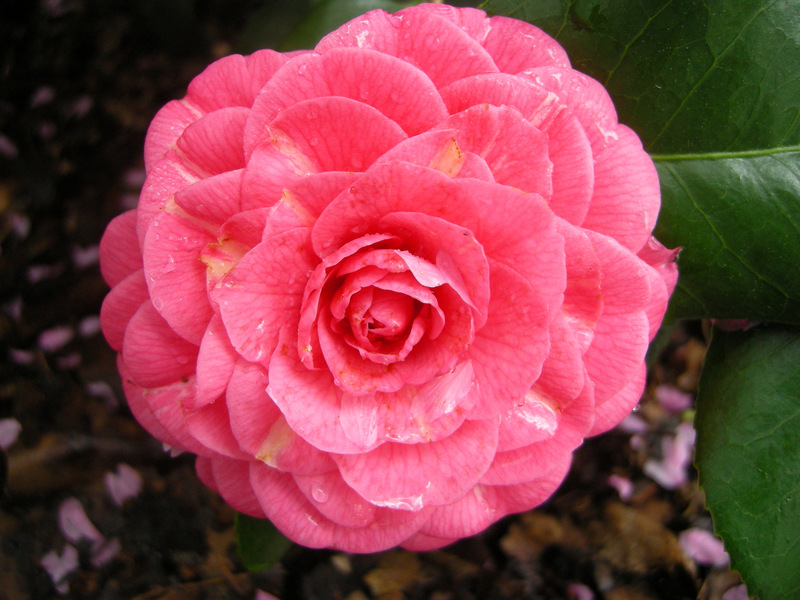 My latest spring-blooming camellia addition, Camellia x ‘April Rose’, a formal double. 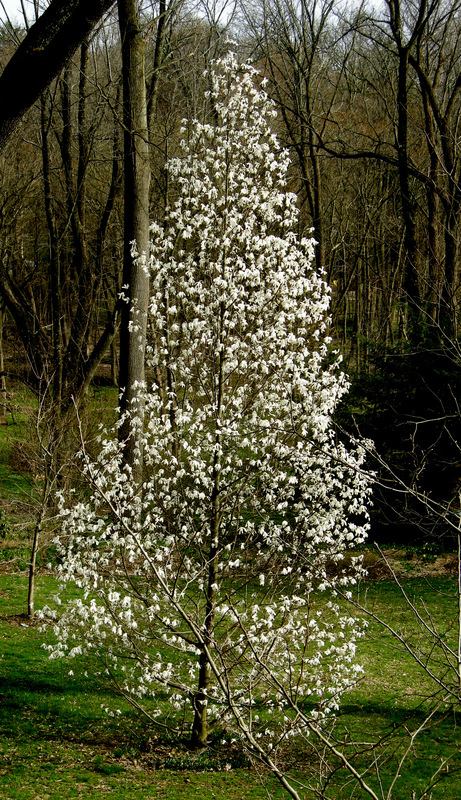 A very mature Yoshino cherry, Prunus x yedoensis, that came with our property. 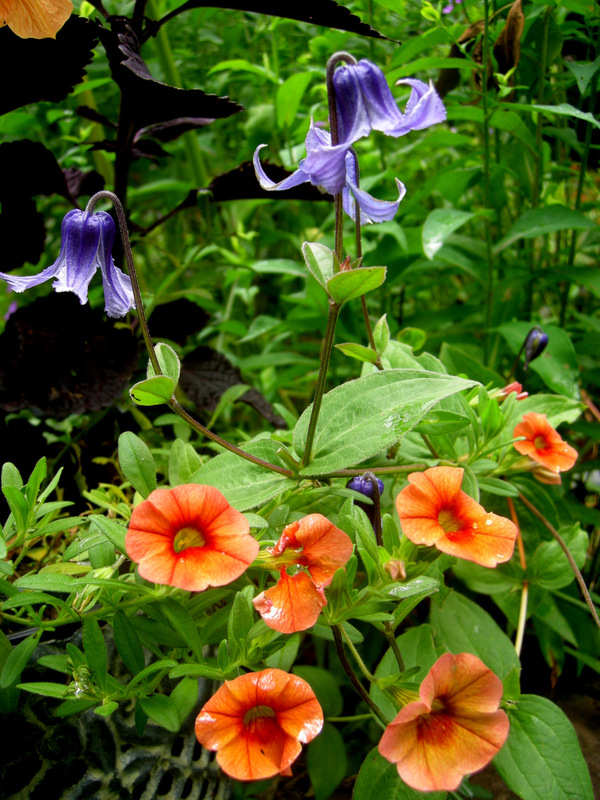 I love the fleeting nature of the flowers and look forward to the day every spring when it rains petals in my nursery. Its orange fall color is spectacular. 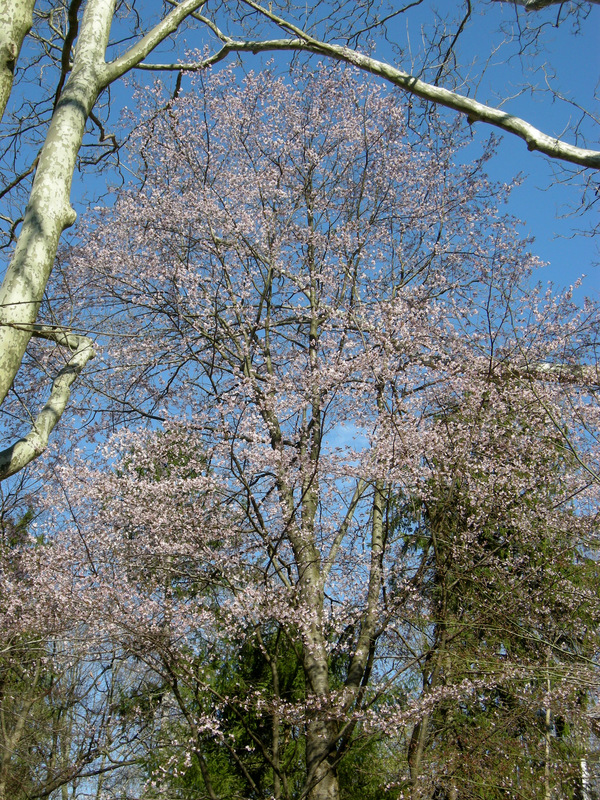 My favorite cherry (at least for today), Prunus x incam ‘Okame’, dominates my courtyard garden in early spring. 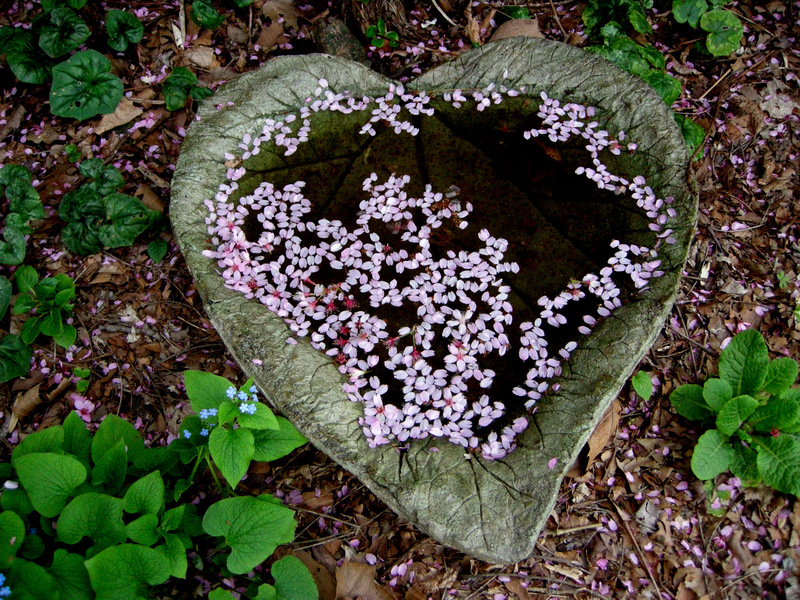 I will end with a heart full of cherry blossoms because I love early spring! Please let me know in a comment/reply what flowers are blooming in your early spring garden. If you participated in GBBD, please provide a link so my nursery customers can read your post. 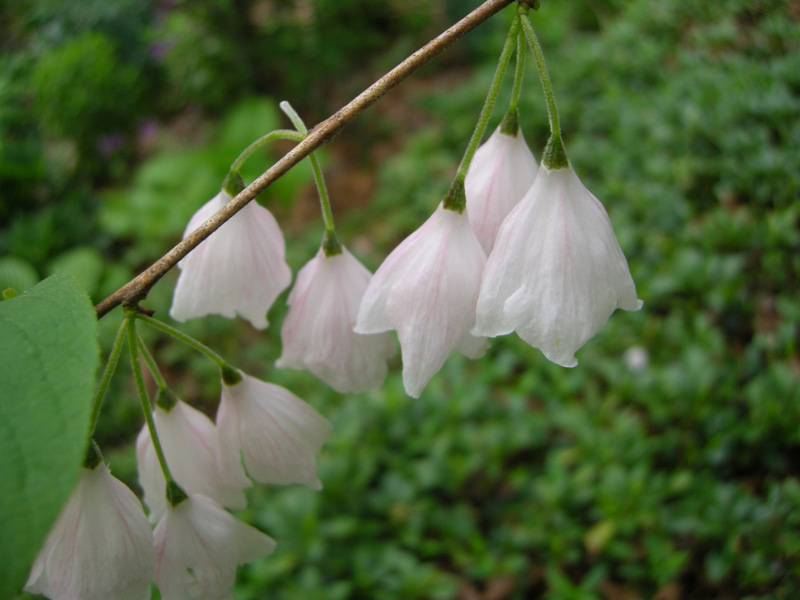 Nursery Happenings: My second open house sale is this Saturday, April 16, from 10 am to 3 pm, featuring early spring-blooming plants for shade. 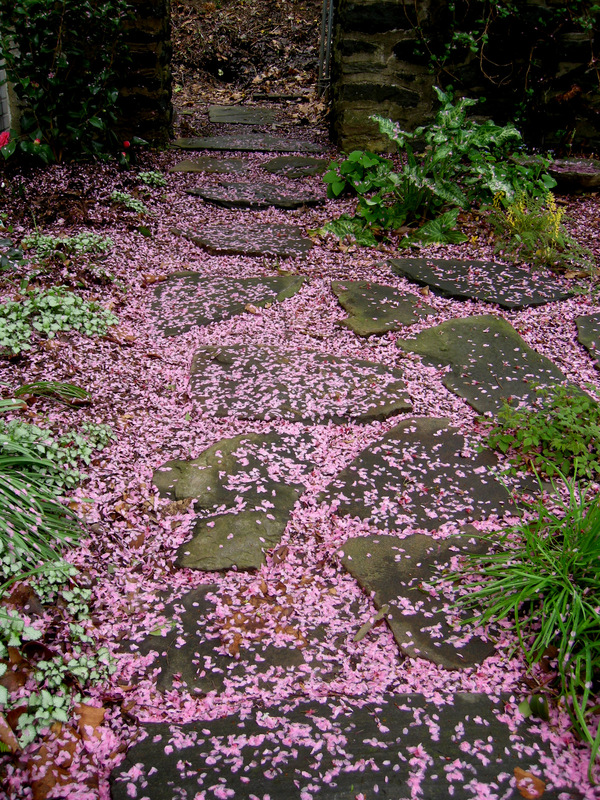 It is time to walk around your garden again and assess what you need to add to make the end of winter an exciting time in your landscape. 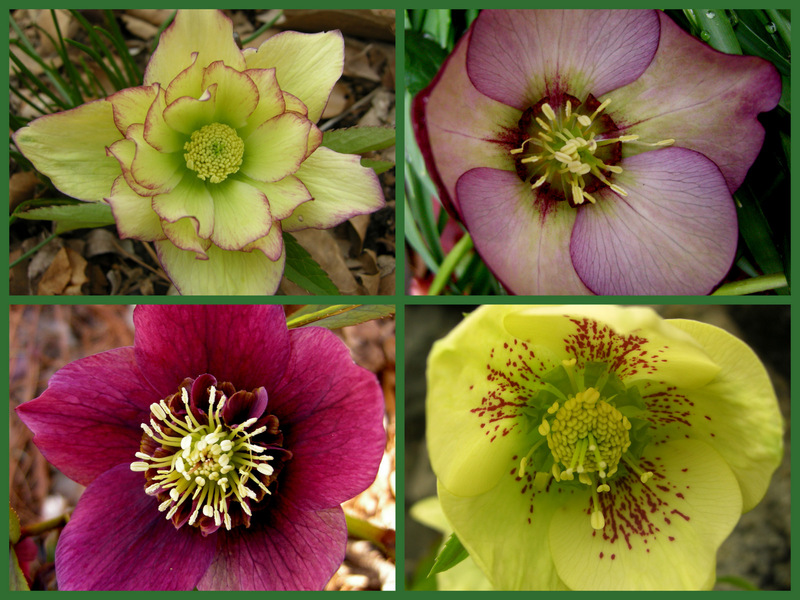 Do you need more early-blooming hellebores to give you a reason to go outside? 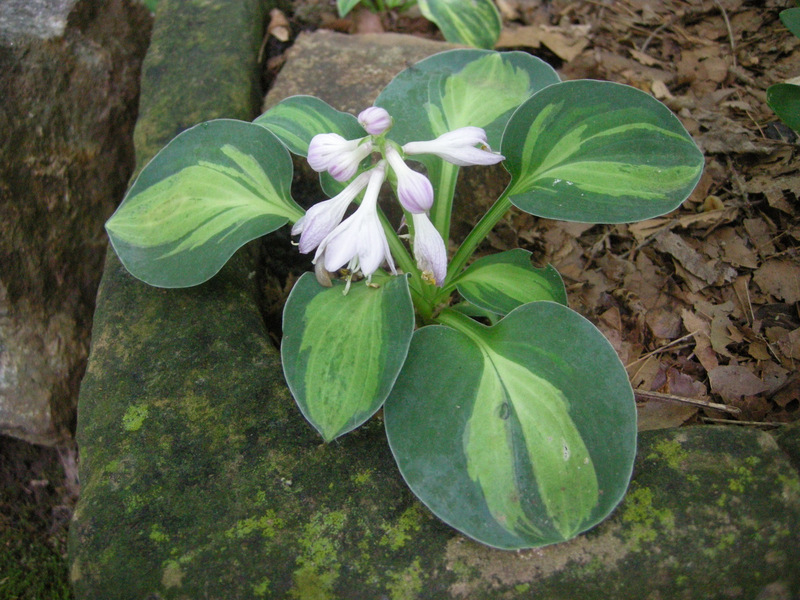 Could your garden benefit from flowers that bloom in January and February like hardy cyclamen, snow crocus, or snowdrops to relieve the gray? Make a list and take photographs so that when you are shopping this spring you know what you need and where it should go. I know it’s icy outside, but you never know what you might find to end the winter doldrums like the hardy cyclamen (pictured above), which I discovered during my own chilly inventory. 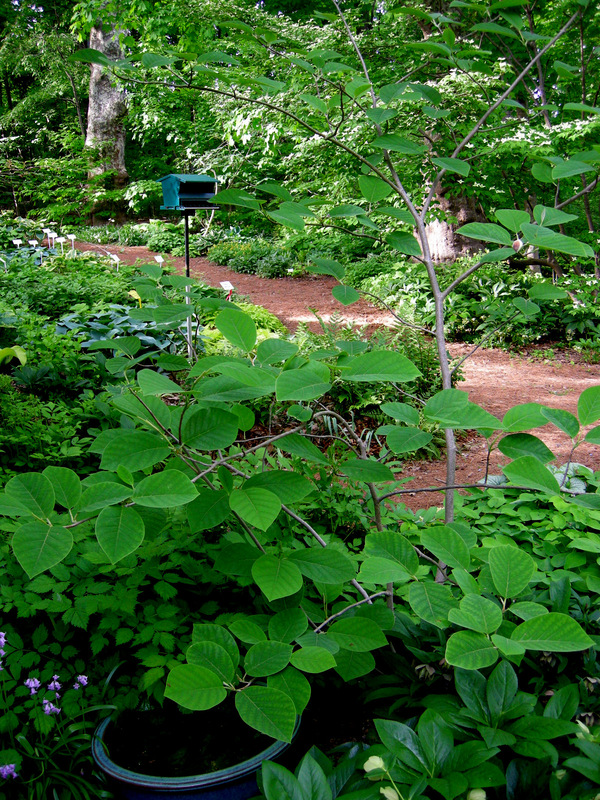 If you need ideas, visit local arboretums and gardens. I always find a trip to Winterthur, an elegant and intimate public garden in Delaware, highly inspirational and informative. 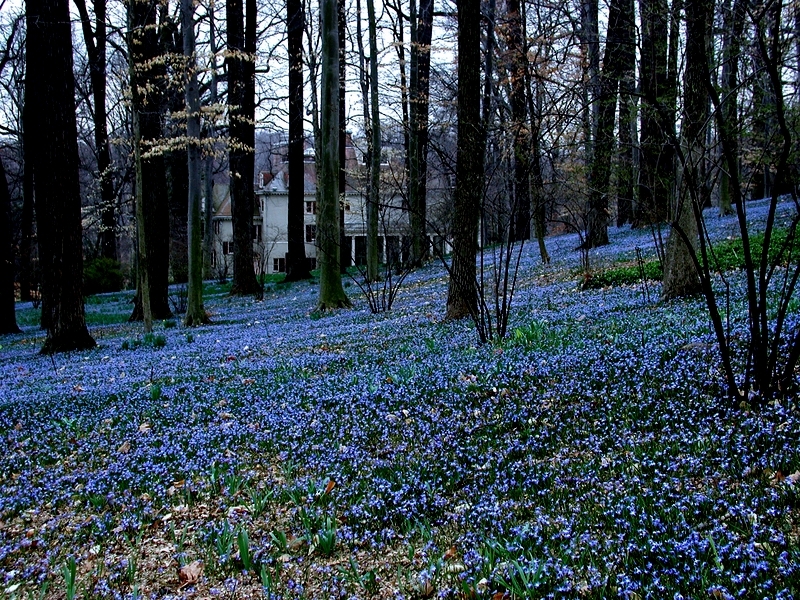 Starting March 1 when Winterthur opens for spring, the area of the gardens known as the March Bank erupts into bloom with tens of thousands of snowdrops, adonis, winter aconite, snow crocus, early scillas, glory-of-the-snow, spring snowflake, and early daffodils. 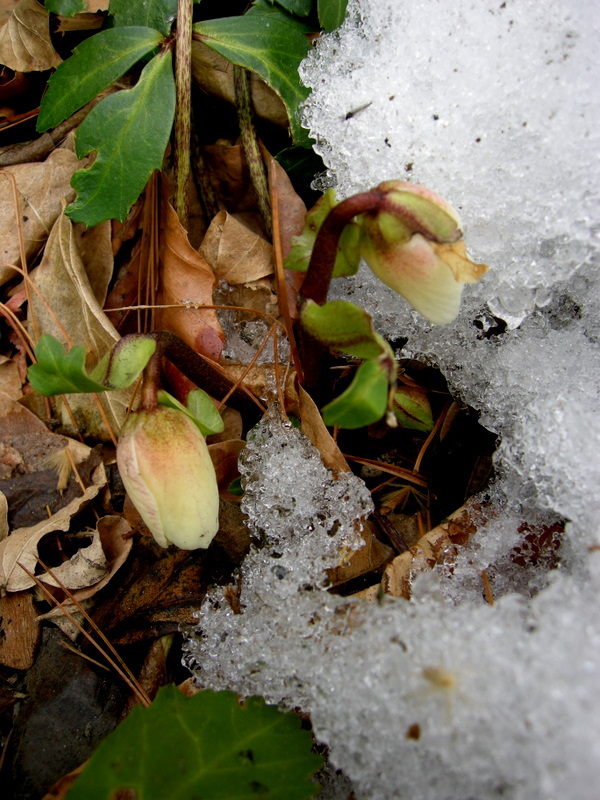 With our near record-breaking snowfall accompanied by generous doses of ice (see The Joys and Sorrows of Snow), I wasn’t planning on participating in February’s Garden Blogger’s Bloom Day. But when I grabbed my camera and walked around, there was much to be seen. 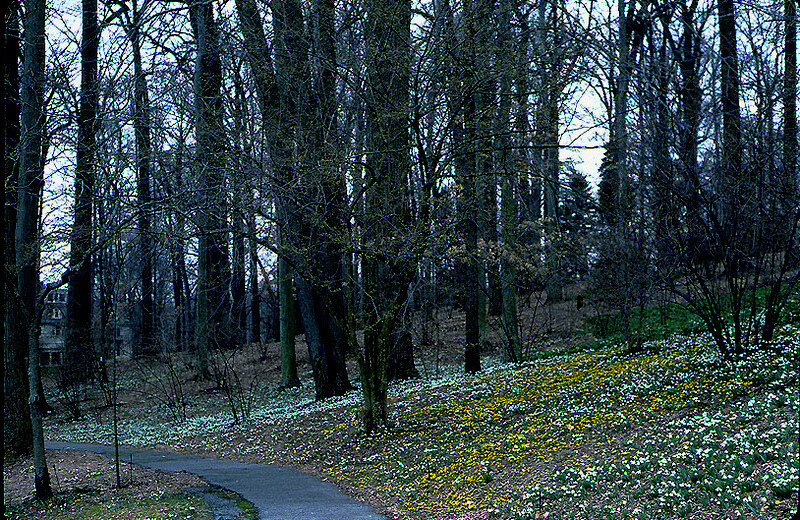 In addition to the flowers, there was more than enough views of the destruction of the winter by nature and otherwise. 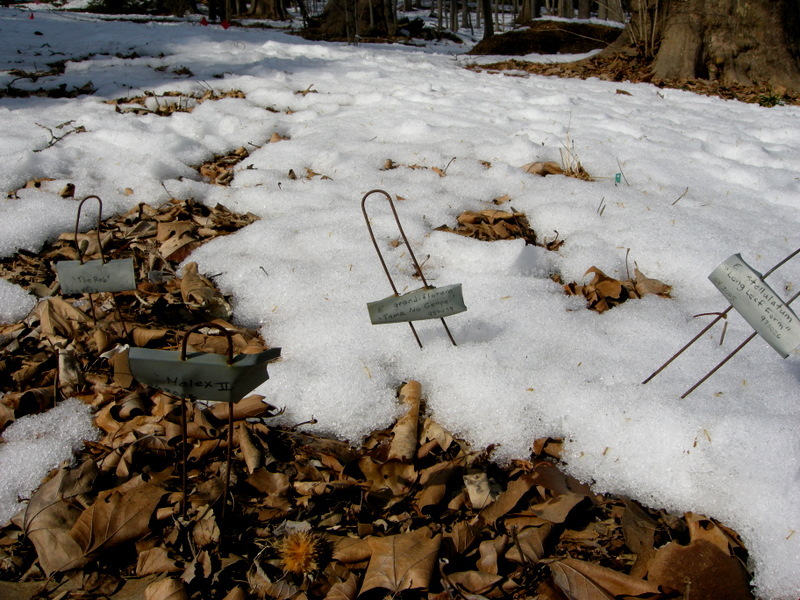 The signs marking my epimedium collection after the ravages of my three snowboarding teenage sons. 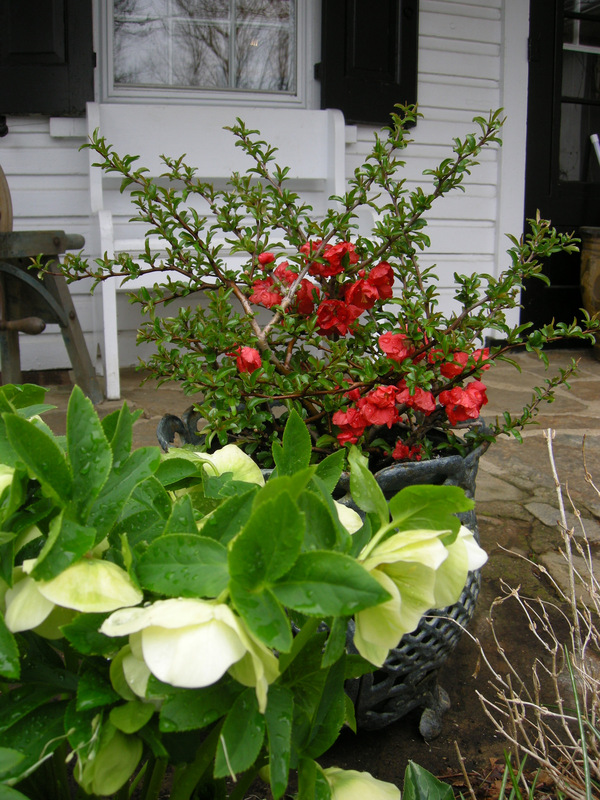 Please let me know in a comment/reply what flowers are blooming in your winter garden. If you participated in GBBD, please provide a link so my nursery customers can read your post. 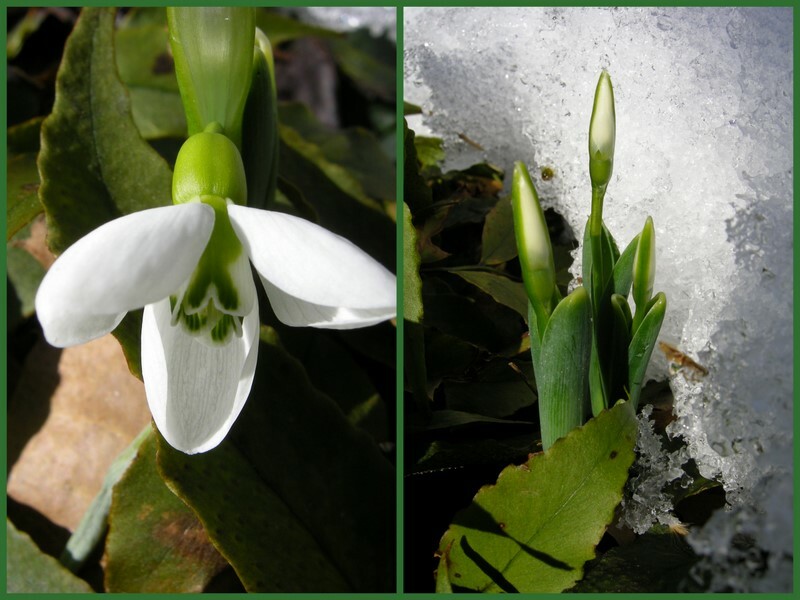 Nursery Happenings: I am currently accepting orders for snowdrops, including mail orders. For the catalogue and order information, click here. 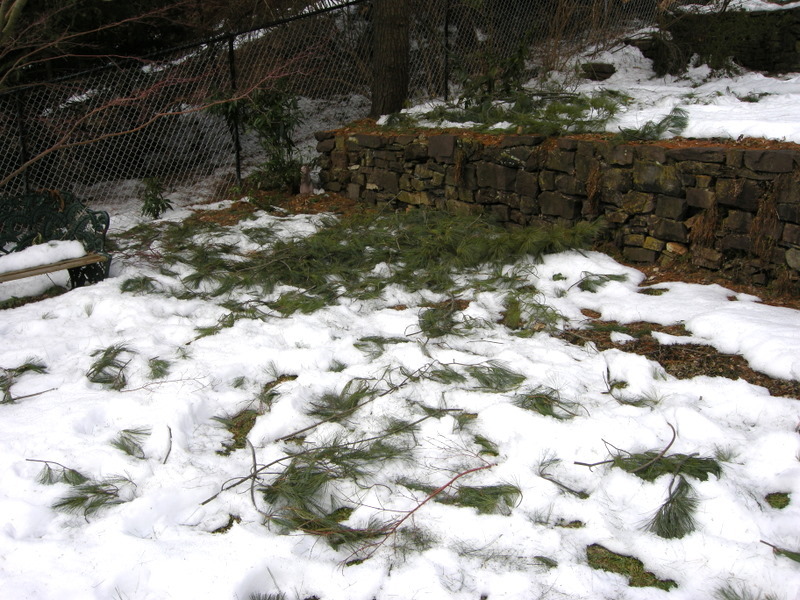 I am also taking reservations for Charles Cresson’s Snowdrops and Other Winter Interest Plants Seminar. For the brochure and registration information, click here.